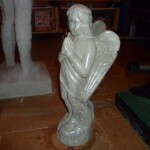 Height: 19 in. 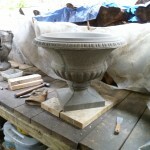 Diameter: 22 in. 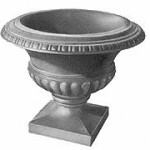 Cavity Diameter: 15-1/2 in. 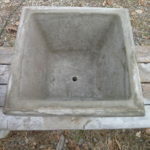 Depth: 9 1/2 in. 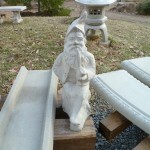 Height: 9-1/2 in. 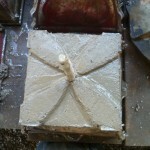 Square: 13-3/4 in. 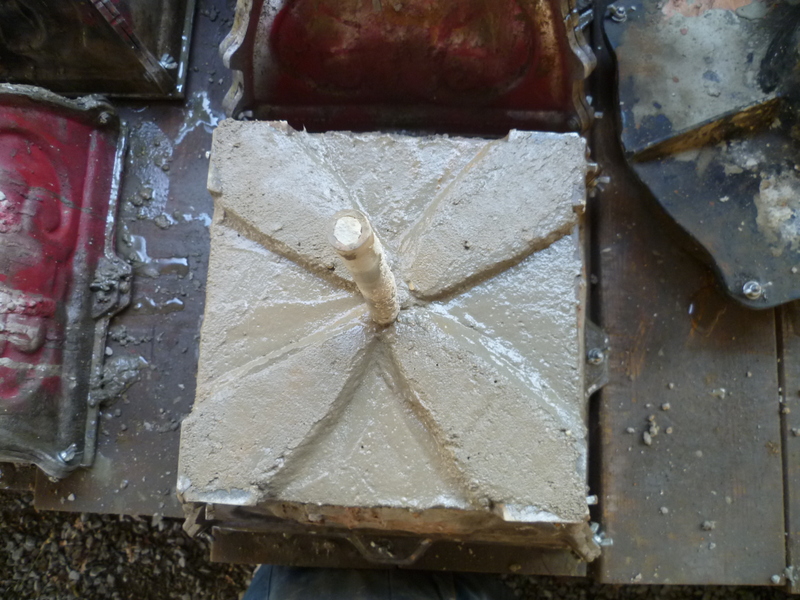 Cavity: 11 in. 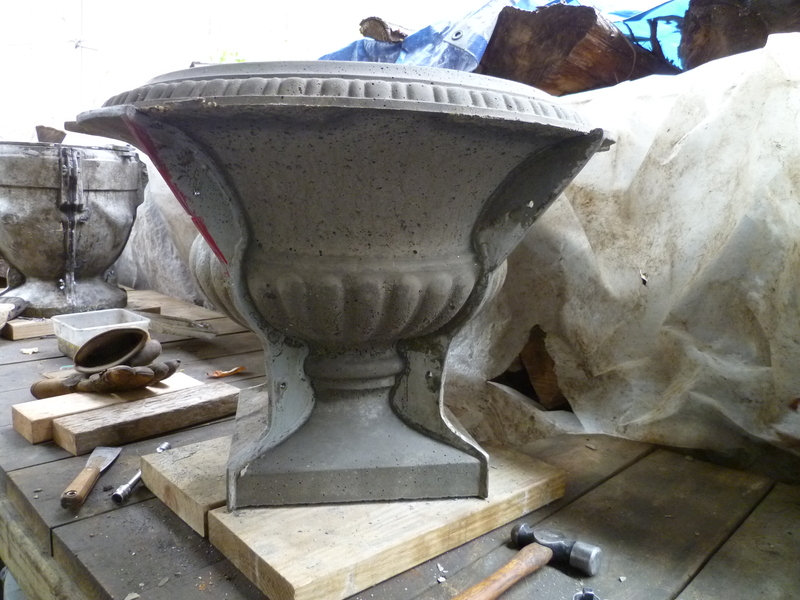 Cavity Depth: 8 in. 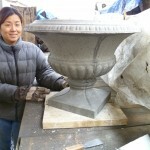 Height: 13-1/2 in. 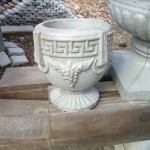 Diameter: 11-7/8 in. 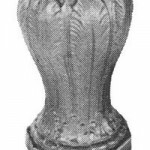 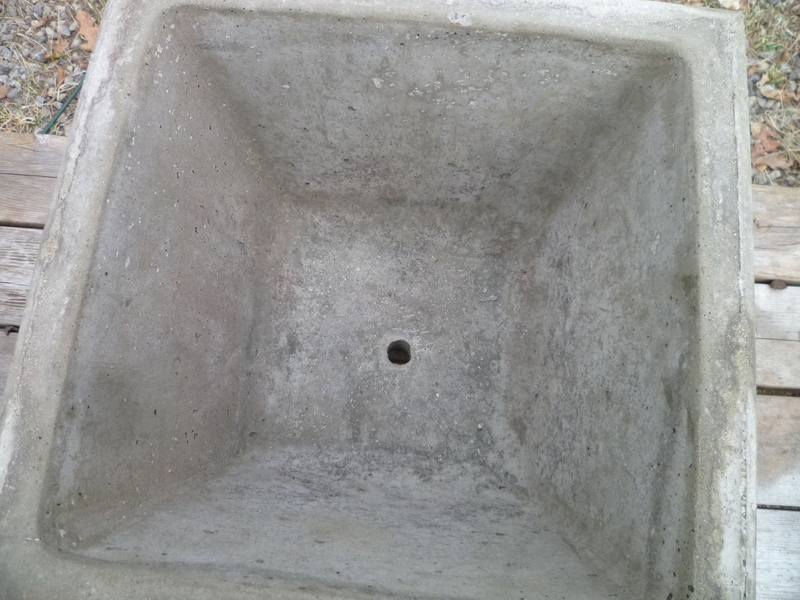 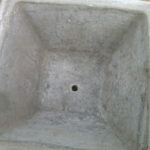 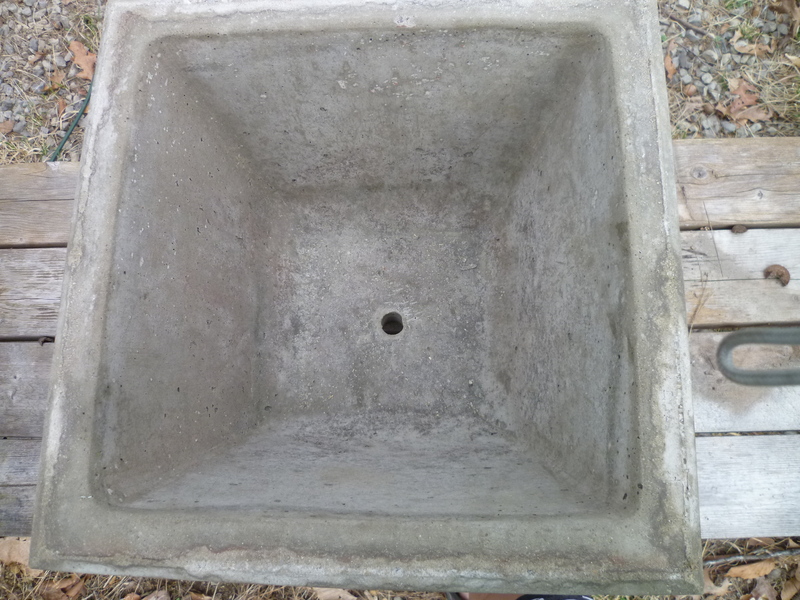 Cavity Diameter: 9-1/2 in Cavity Depth: 9-5/8 in. 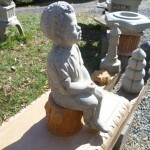 Height: 13-1/2 in. 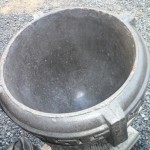 Diameter: 13-3/8 in. 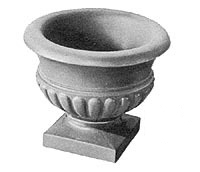 Cavity Diameter: 9-1/2 in. 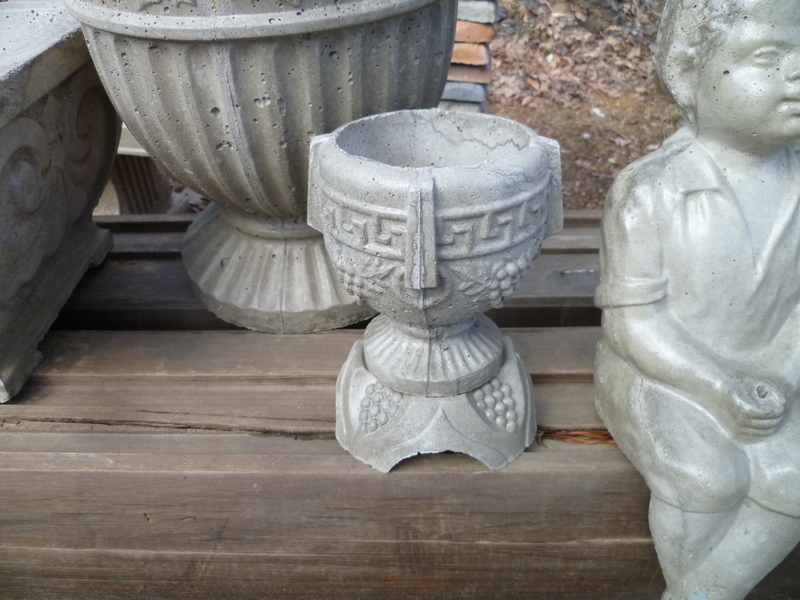 Height: 11-1/2 in. 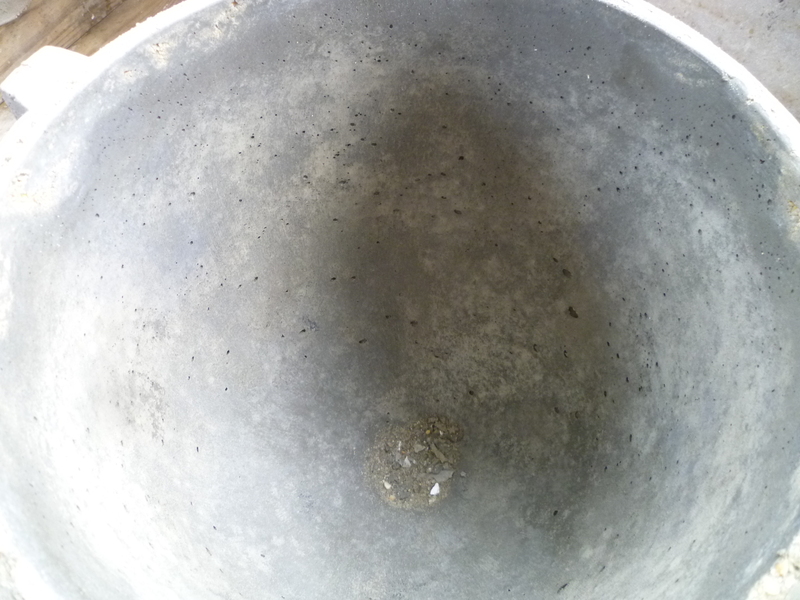 Diameter: 14 in. 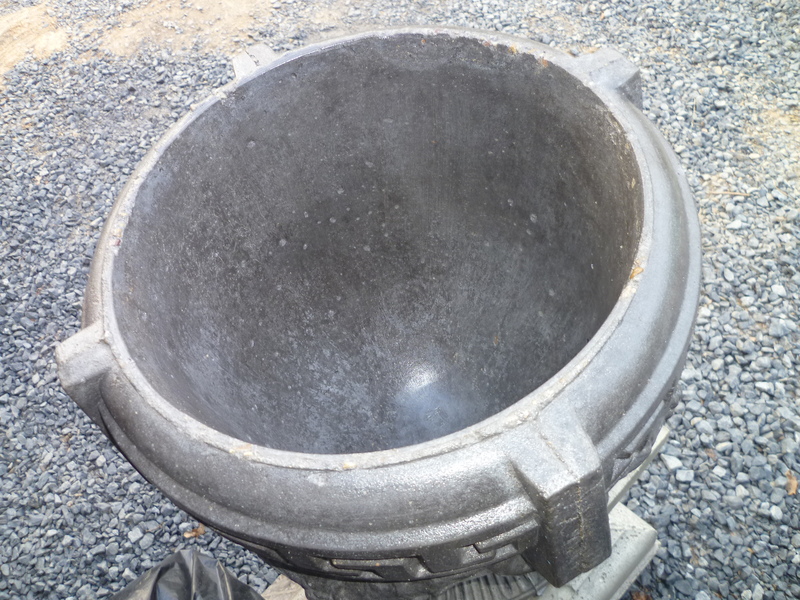 Cavity Diameter: 11 in. 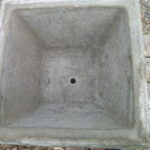 Depth: 8 in. 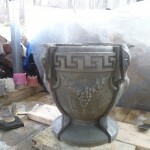 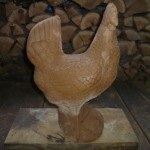 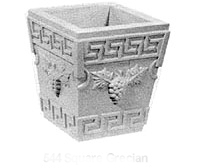 Square Grecian $40 Height: 9-3/4 in. 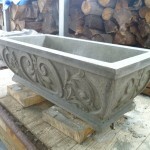 Square Top: 9-5/8 in. 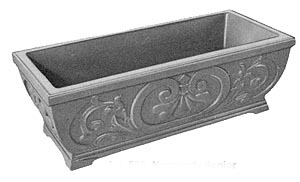 Cavity: 7-3/8 x 7-3/8 in. 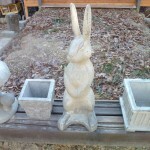 Height: 6-1/3 in. 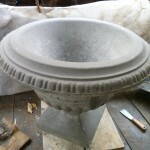 Diameter: 6-1/2 in. 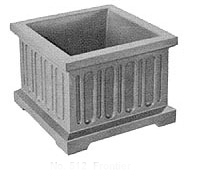 Cavity Diameter: 4-1/2 in. 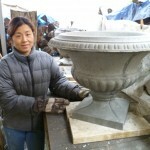 Height: 9-3/4 in. 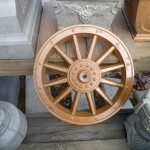 Diameter: 9-1/2 in. 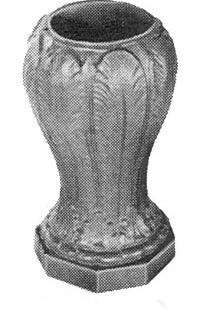 Cavity Diameter: 6-1/4 in. 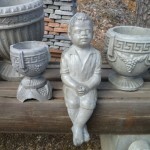 Height: 2 in. 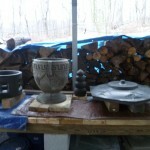 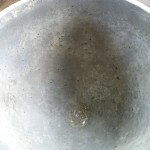 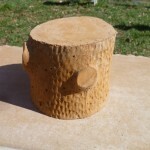 Top Diameter: 4-1/2 in. 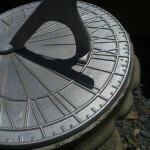 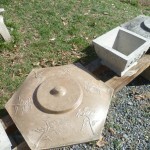 Bottom Diameter: 6-1/4 in. 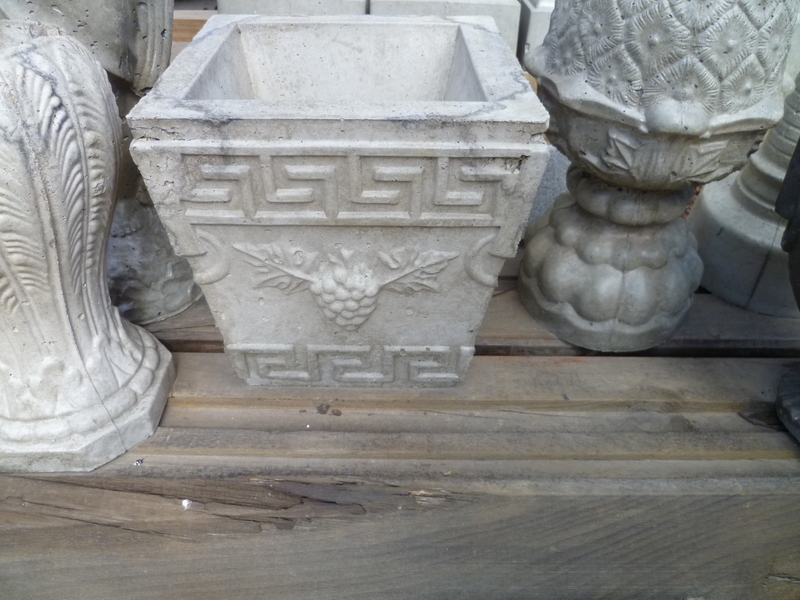 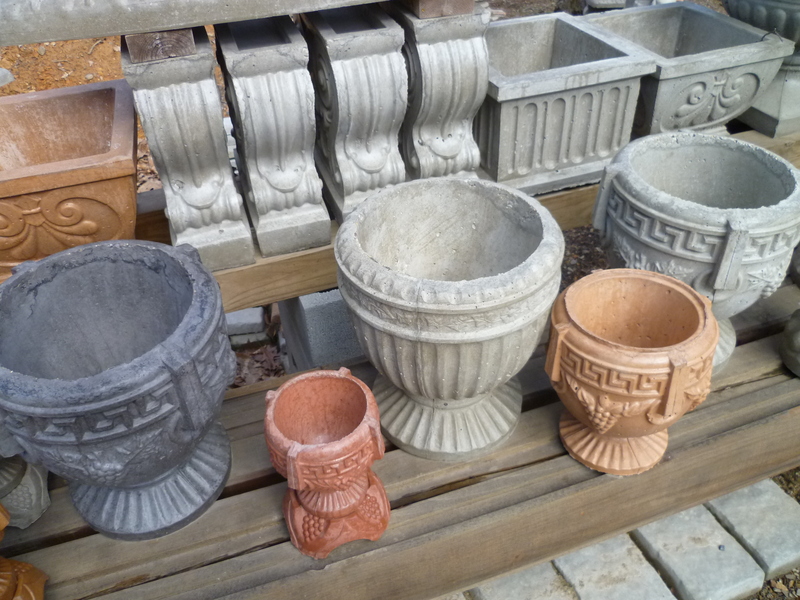 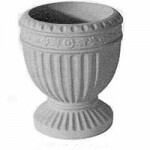 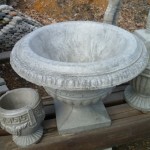 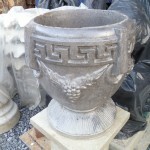 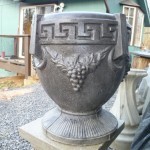 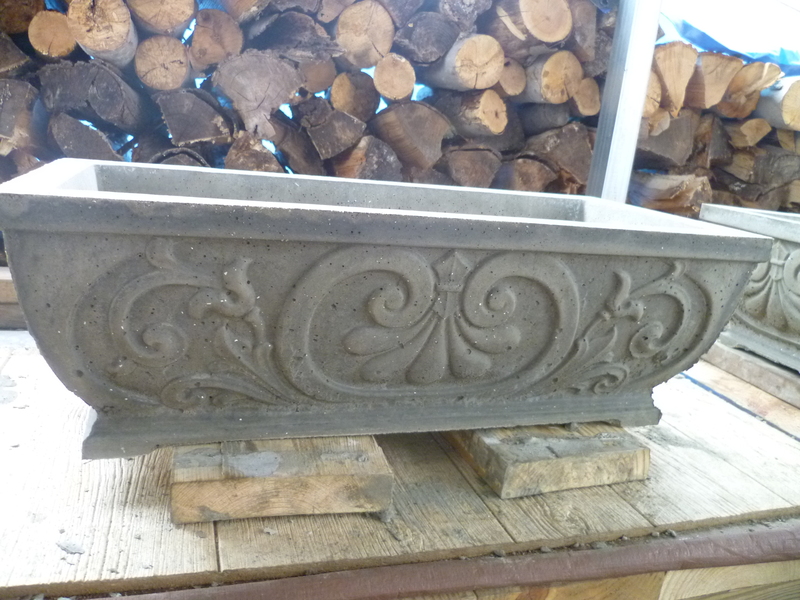 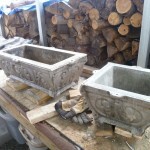 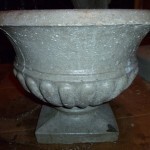 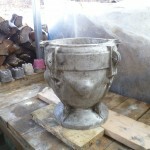 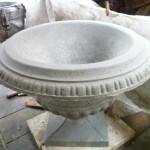 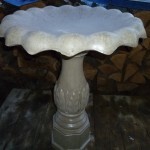 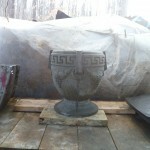 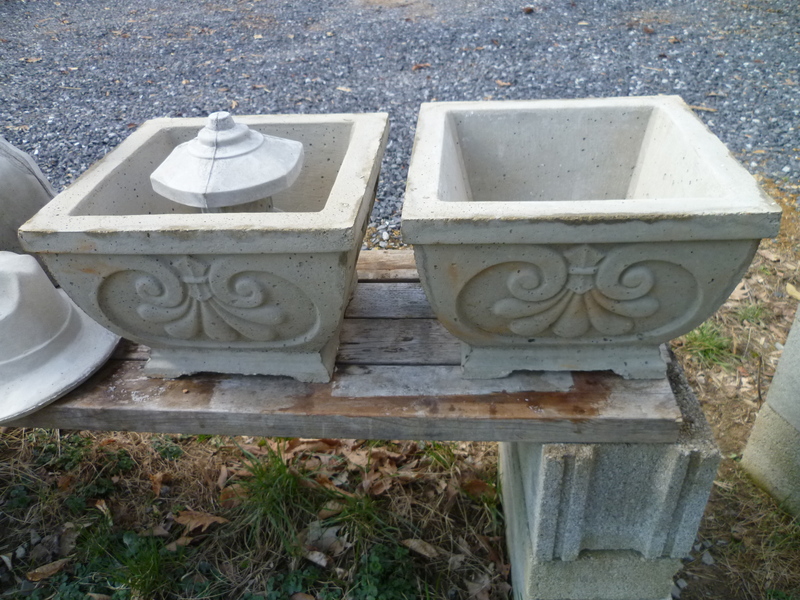 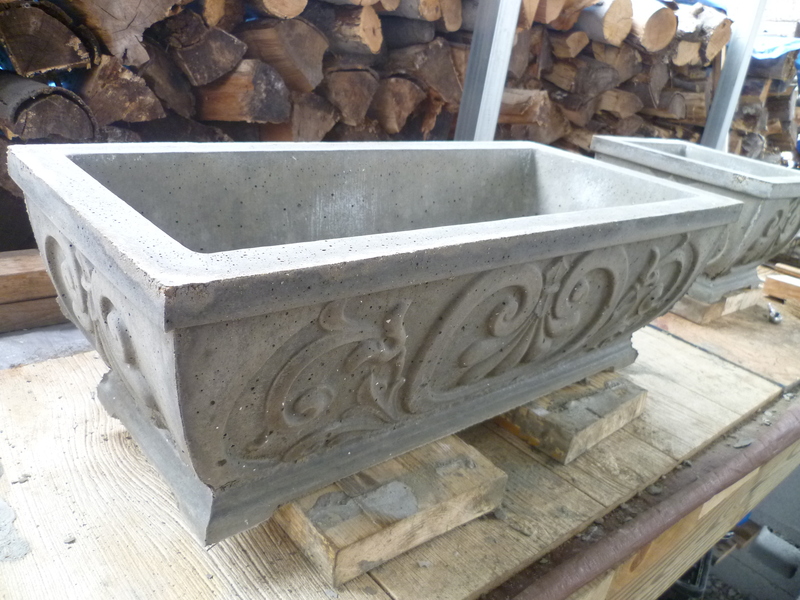 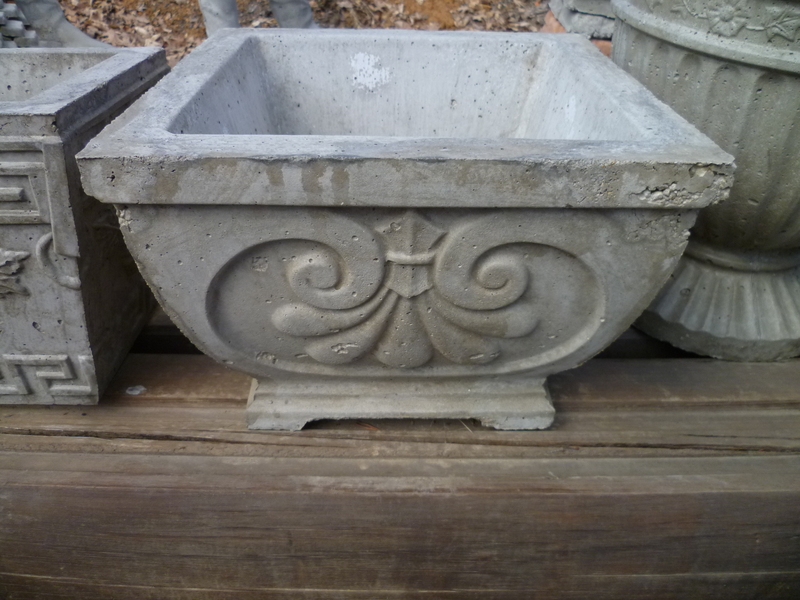 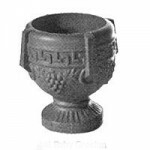 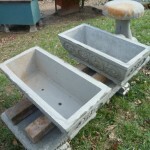 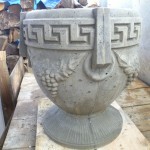 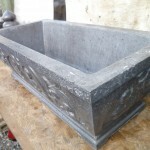 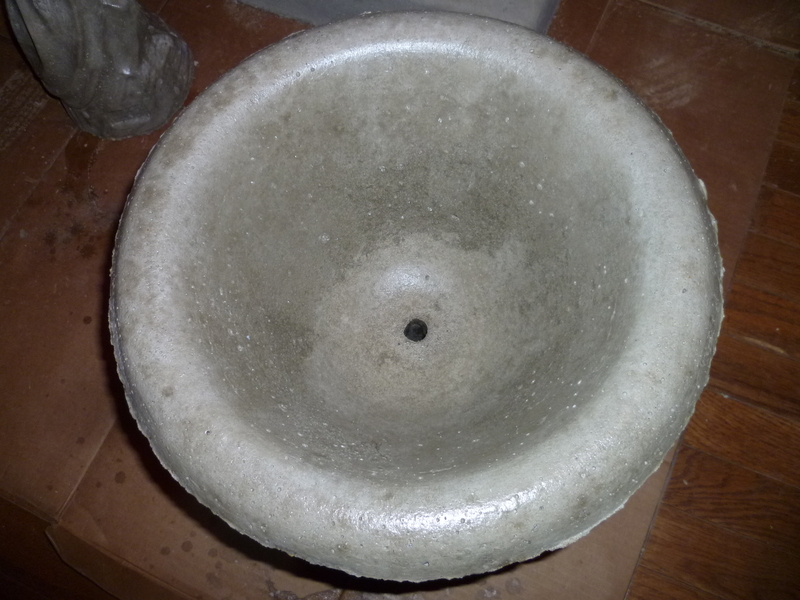 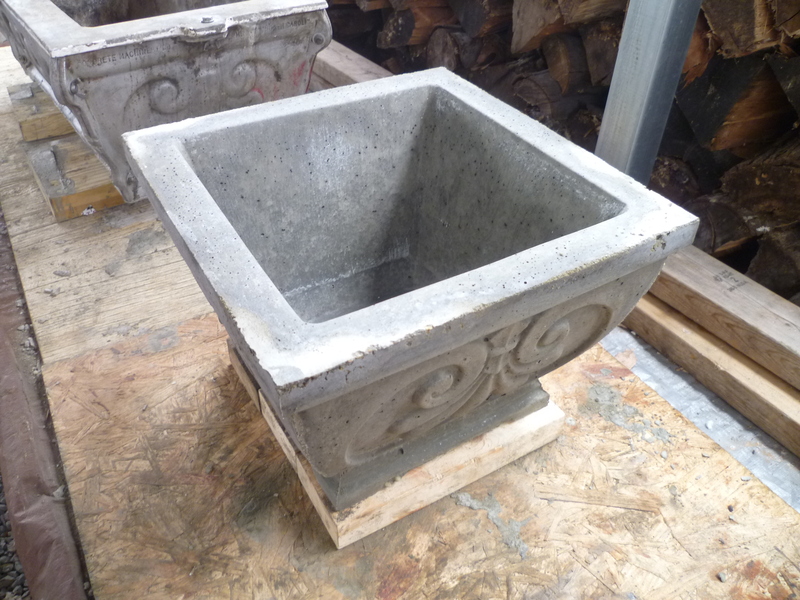 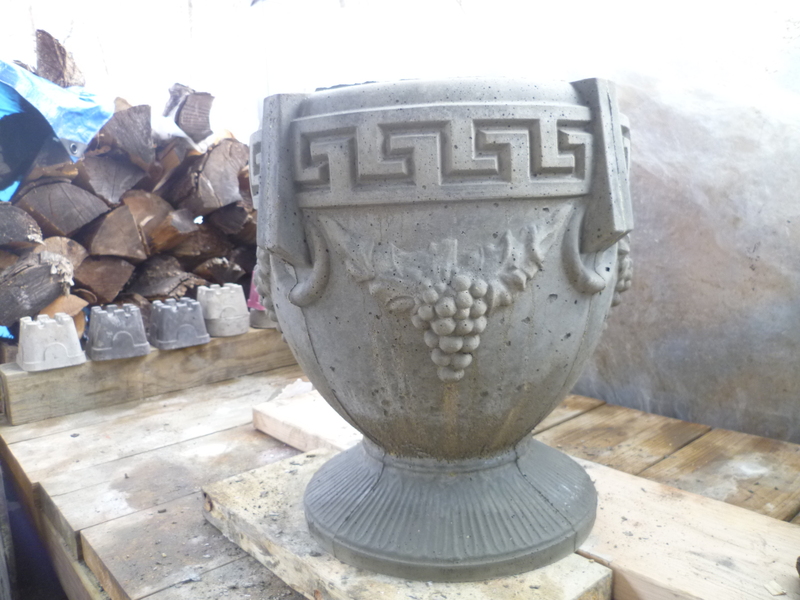 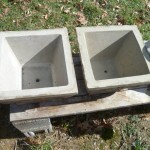 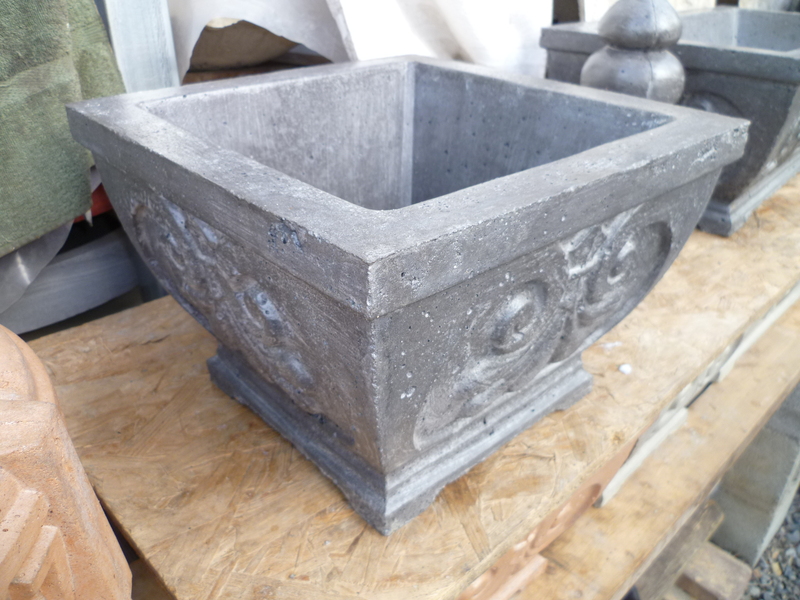 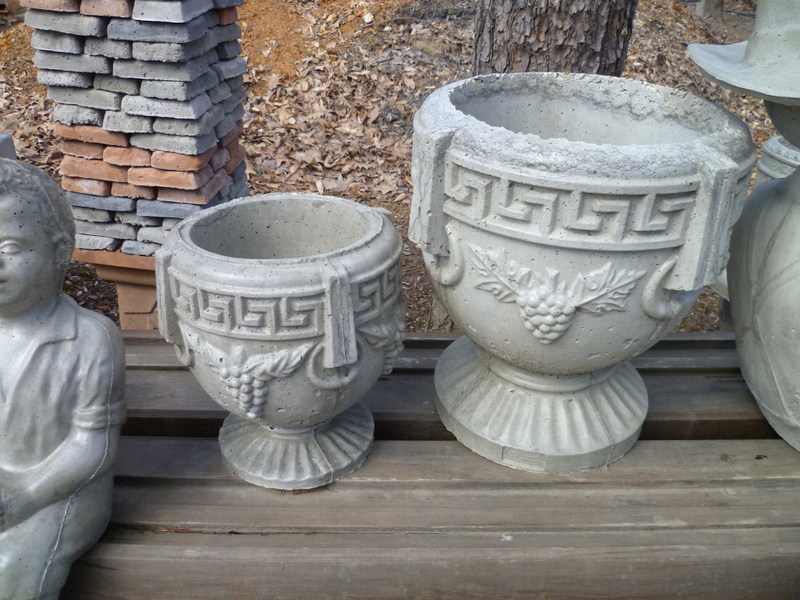 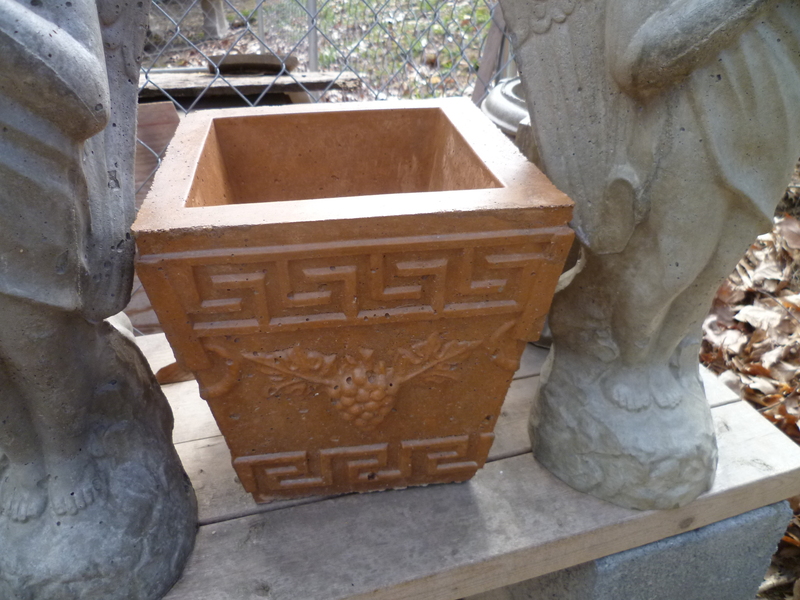 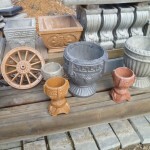 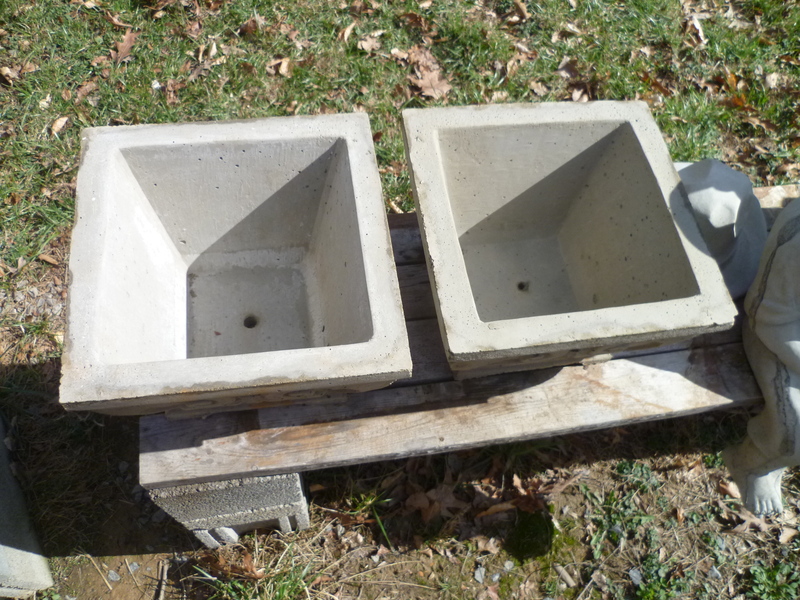 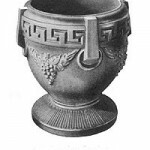 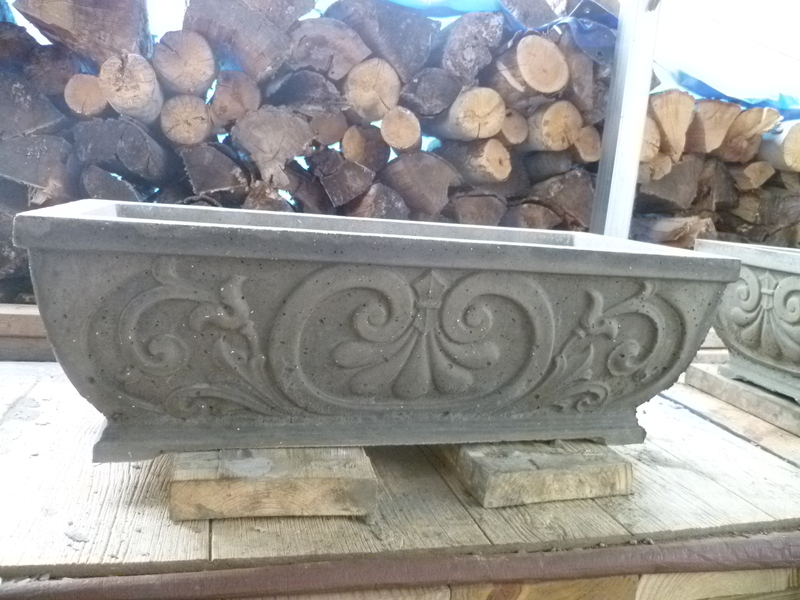 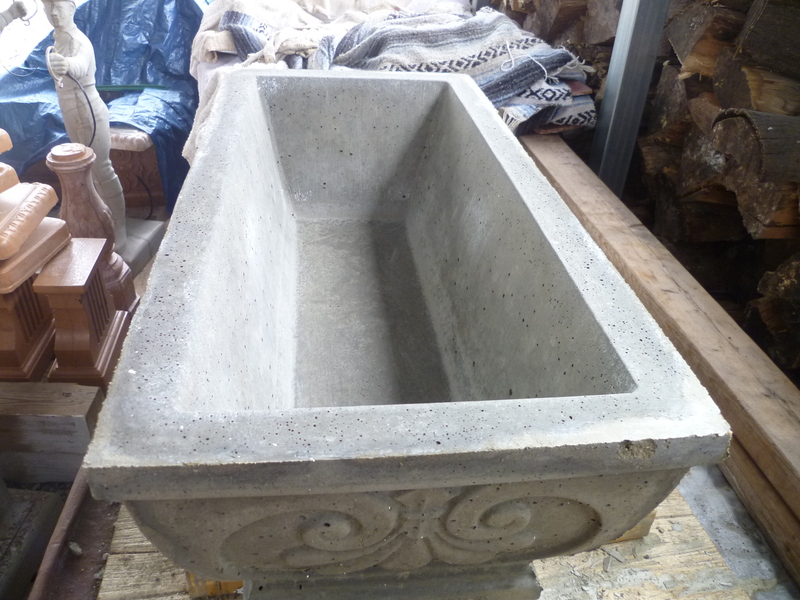 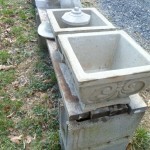 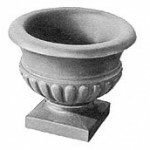 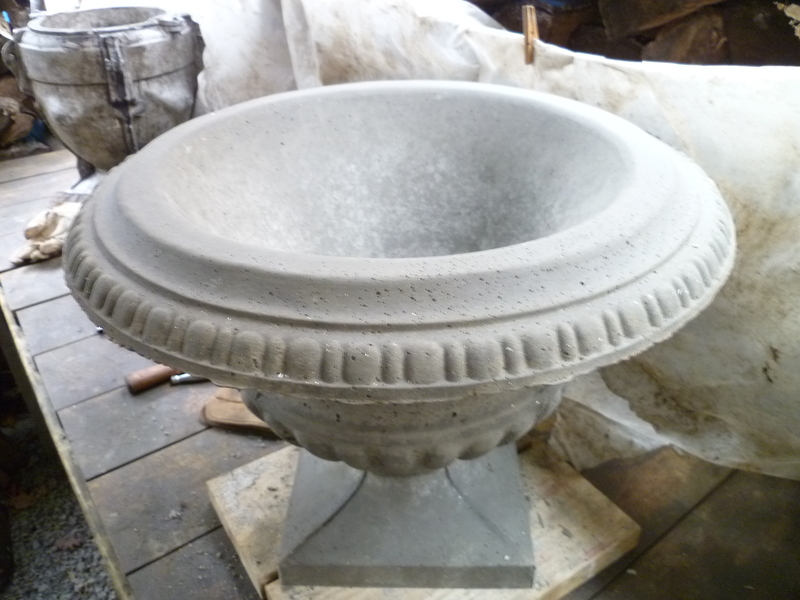 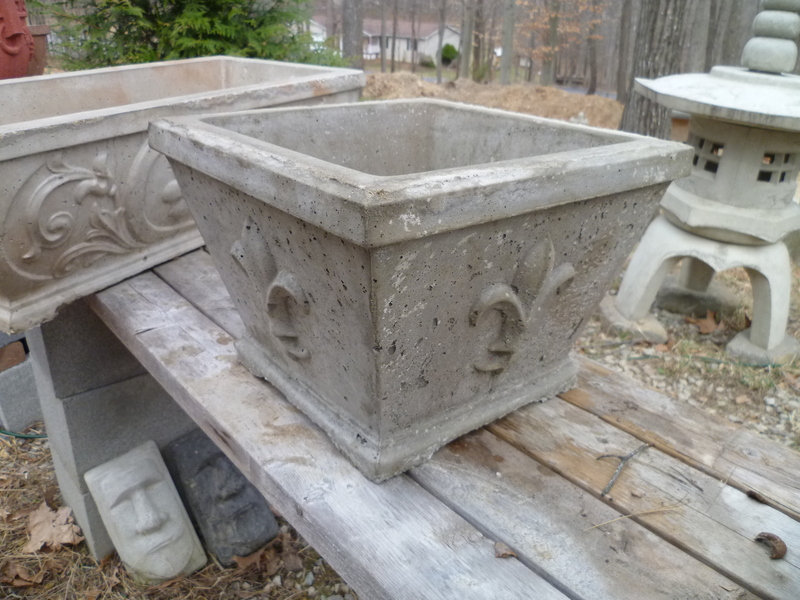 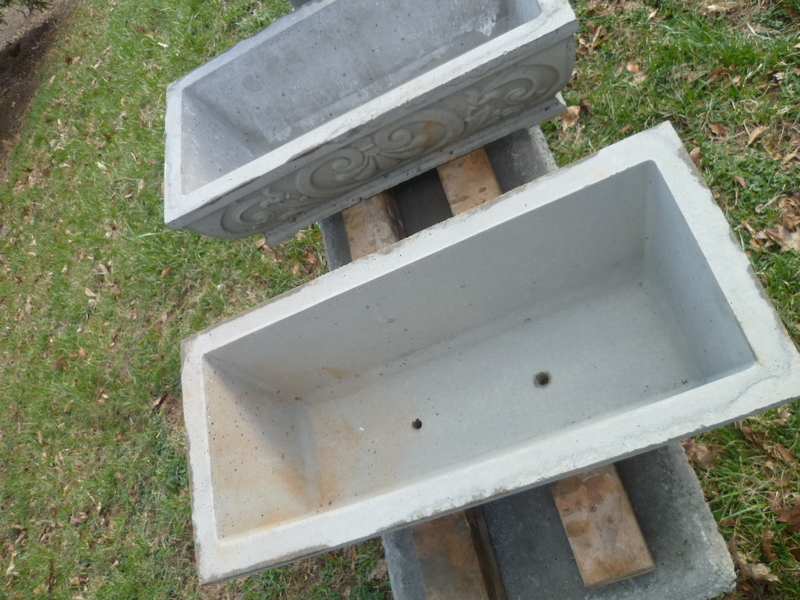 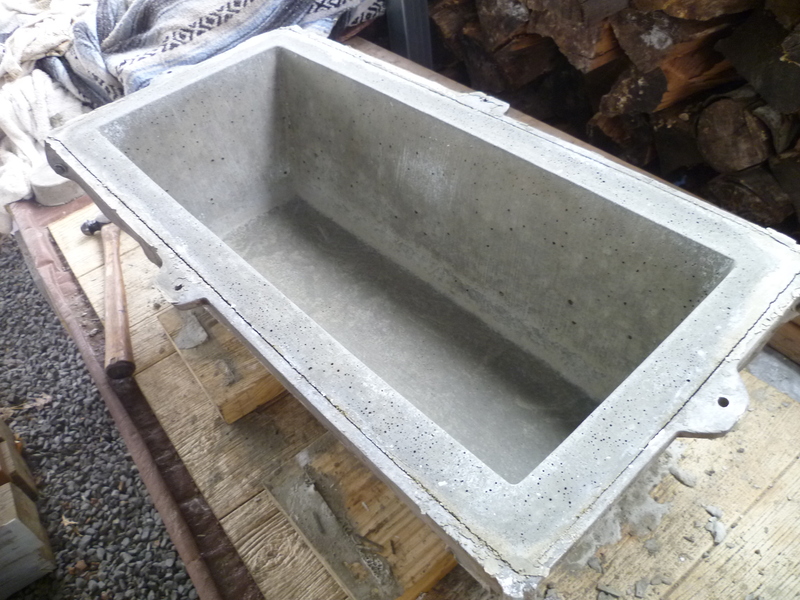 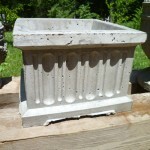 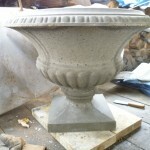 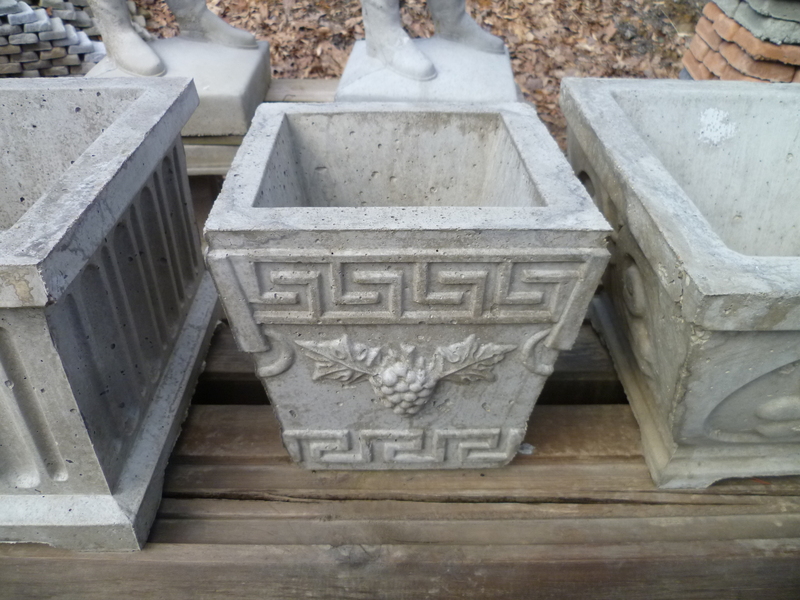 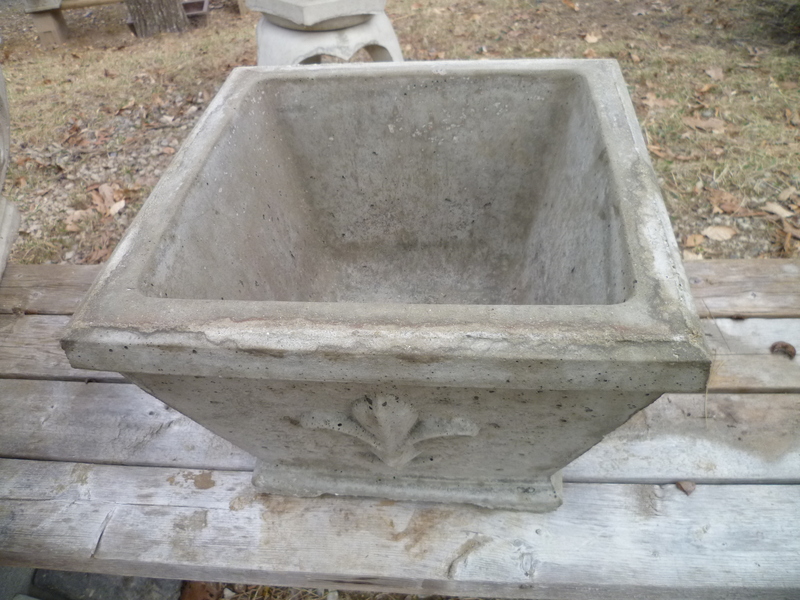 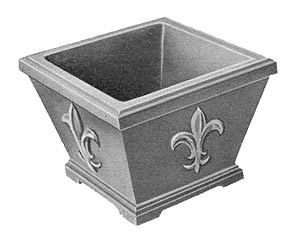 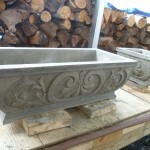 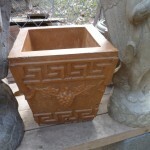 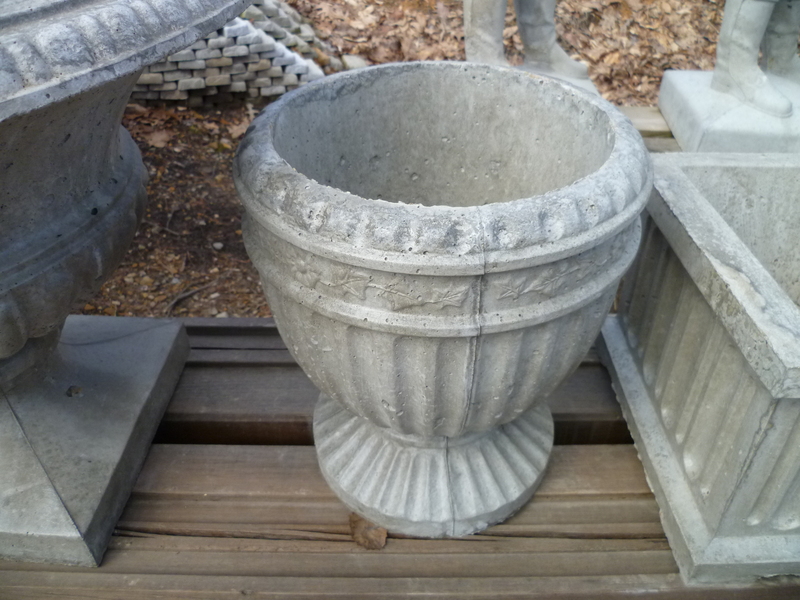 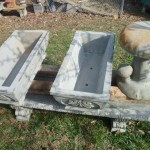 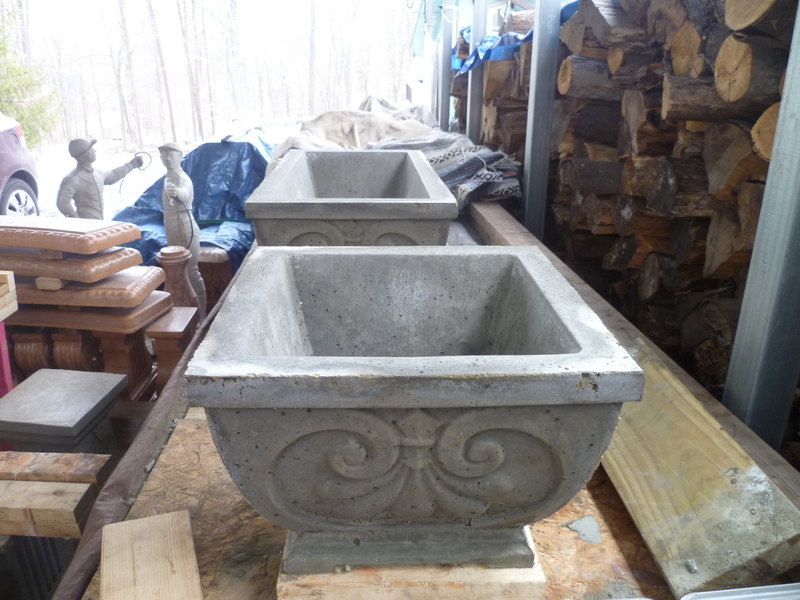 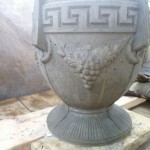 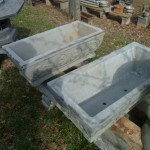 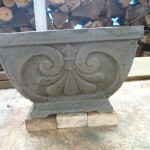 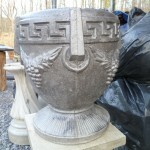 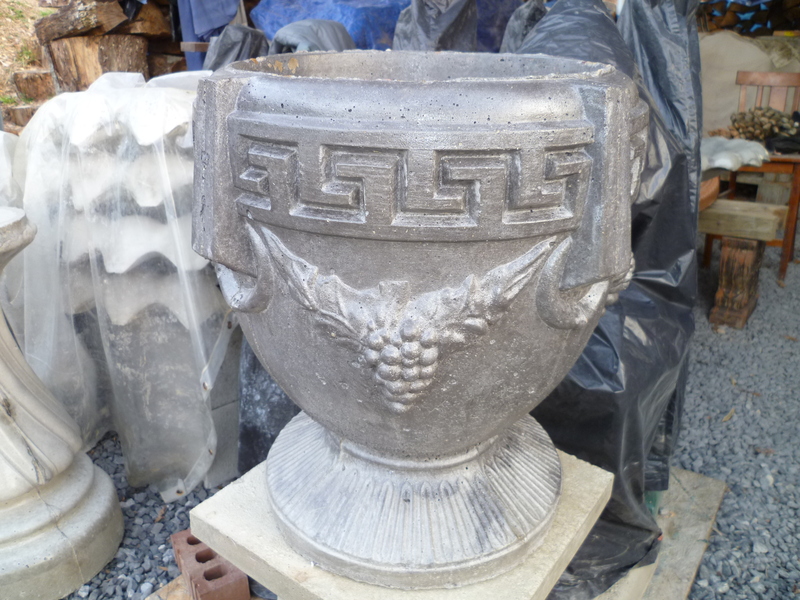 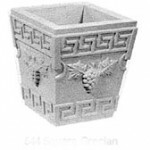 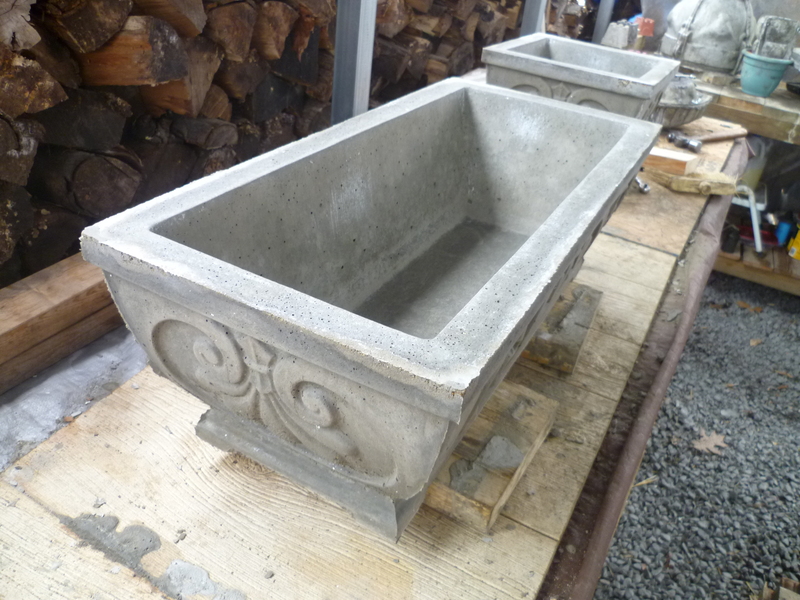 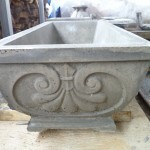 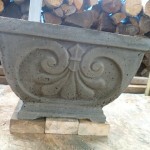 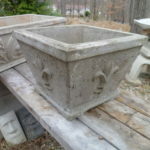 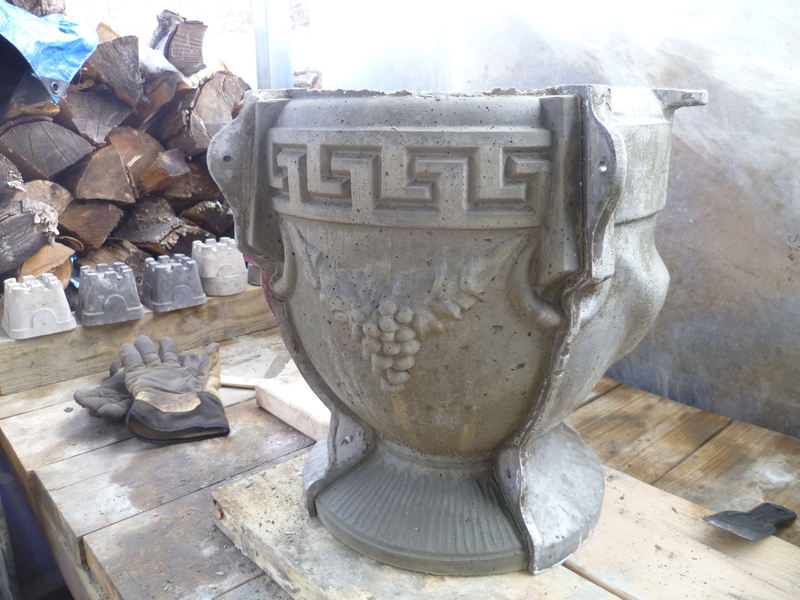 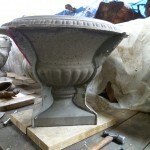 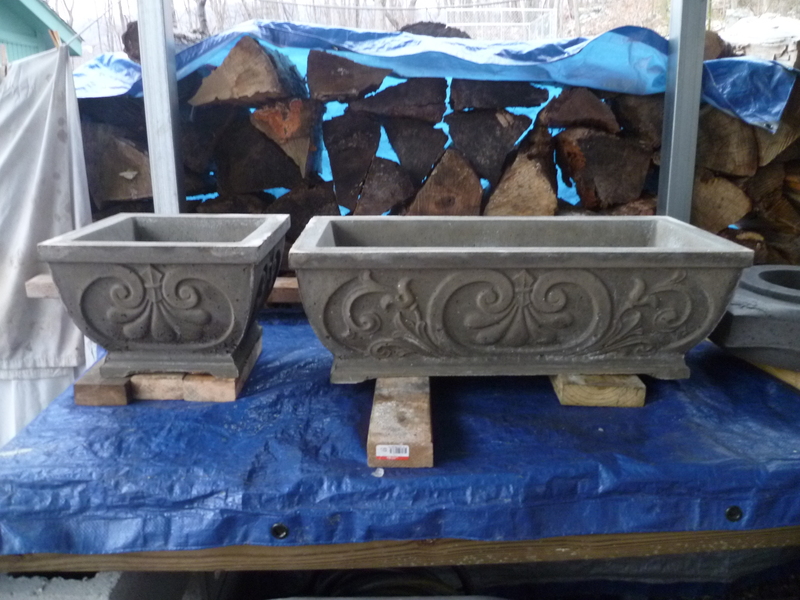 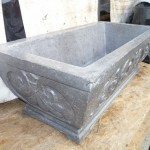 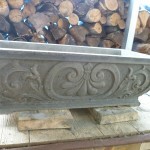 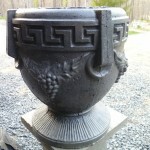 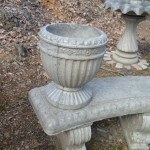 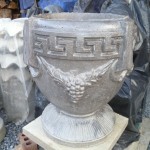 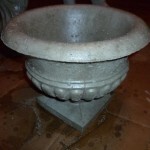 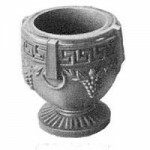 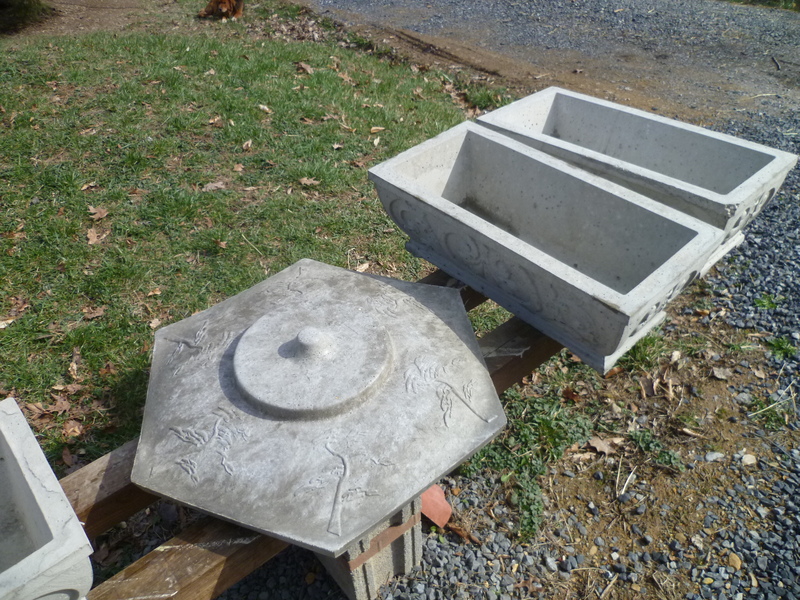 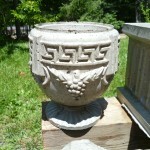 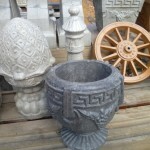 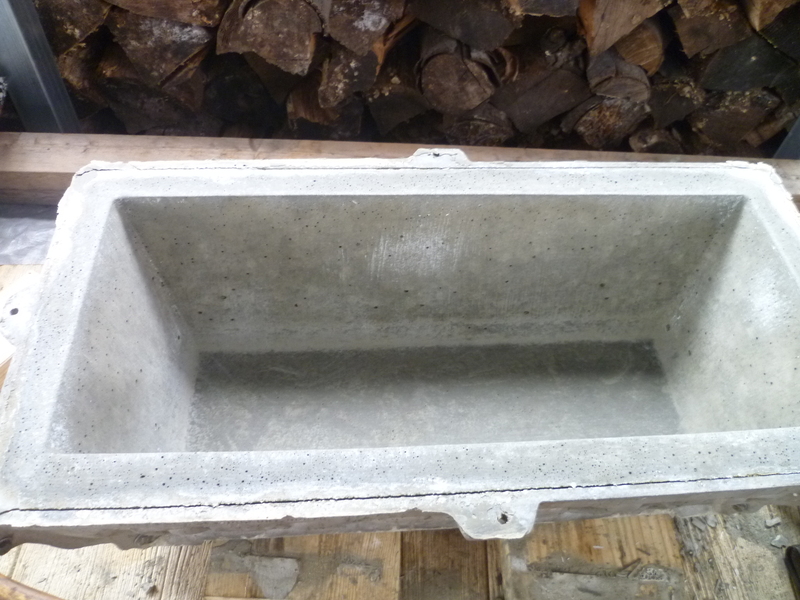 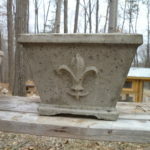 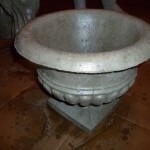 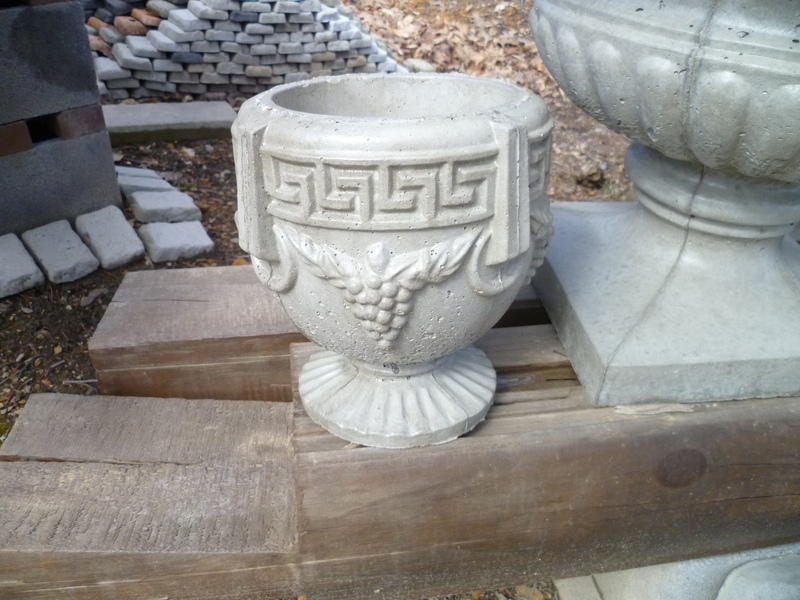 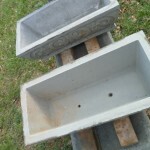 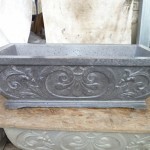 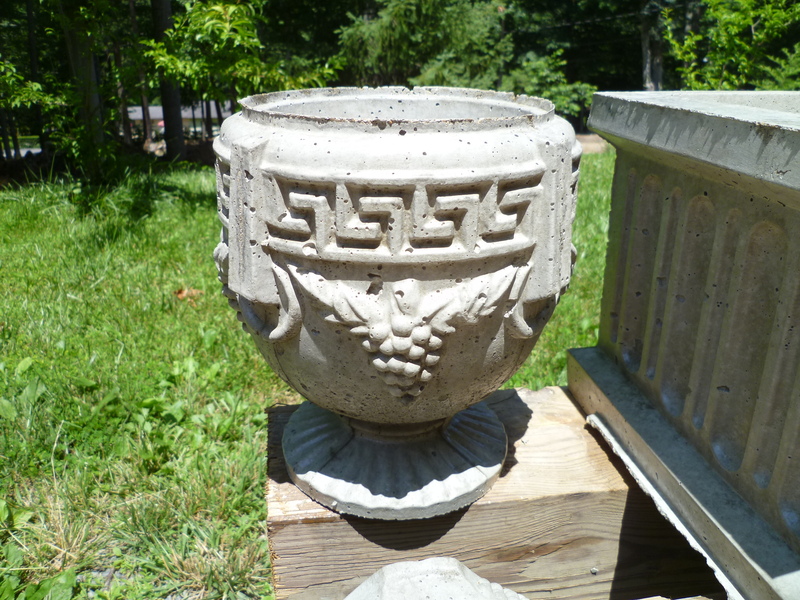 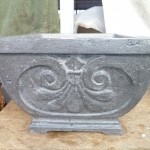 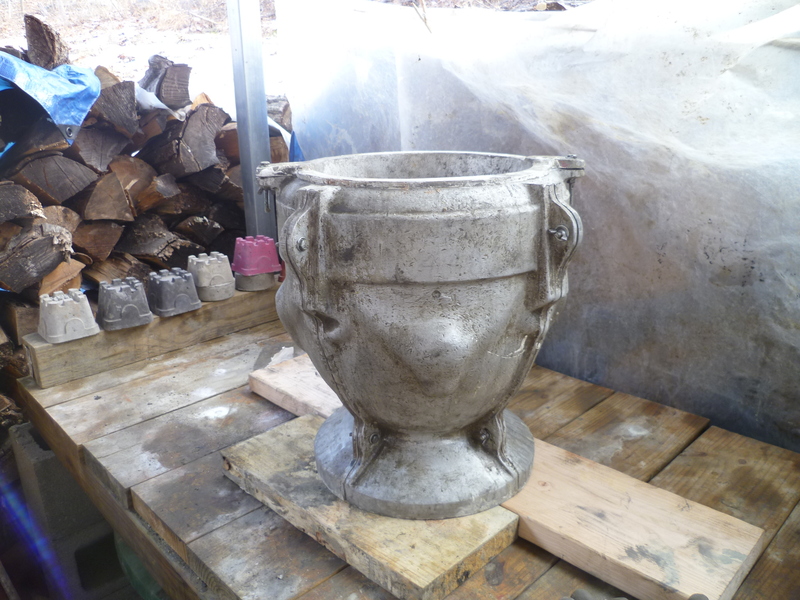 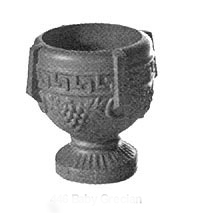 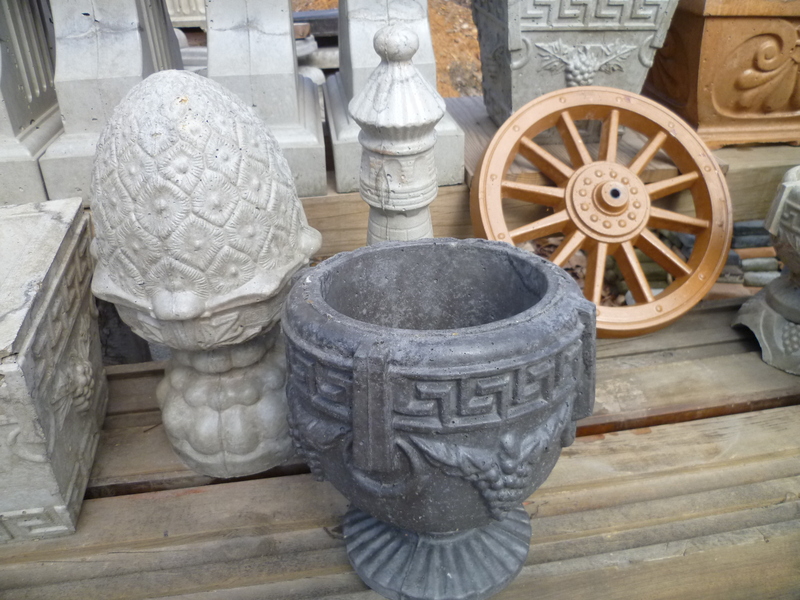 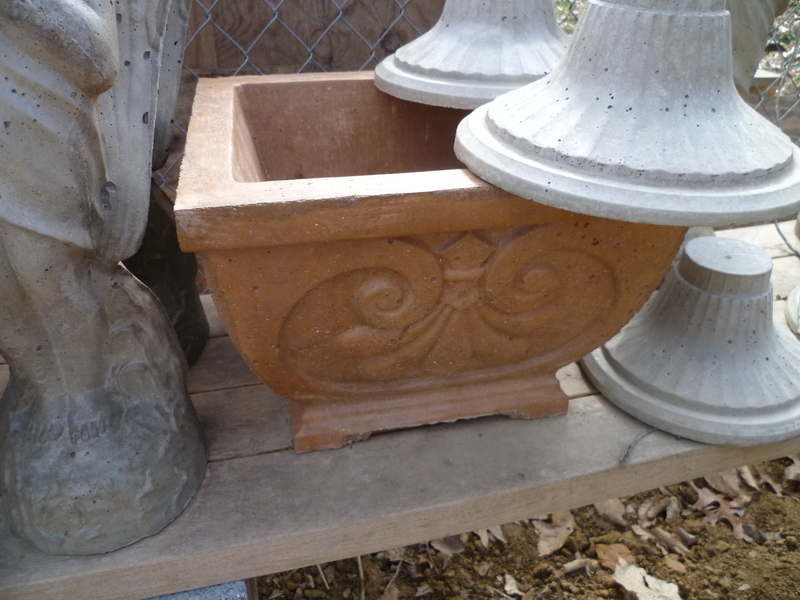 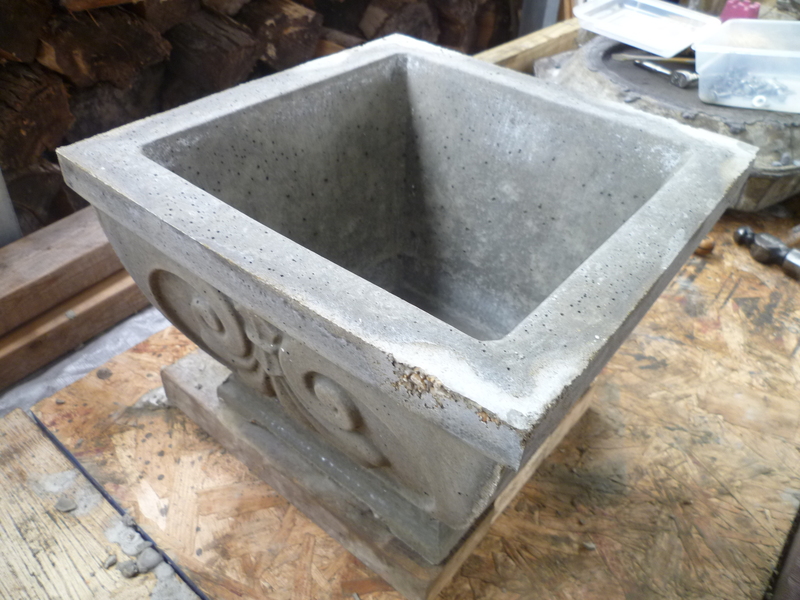 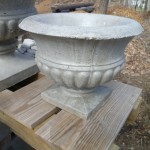 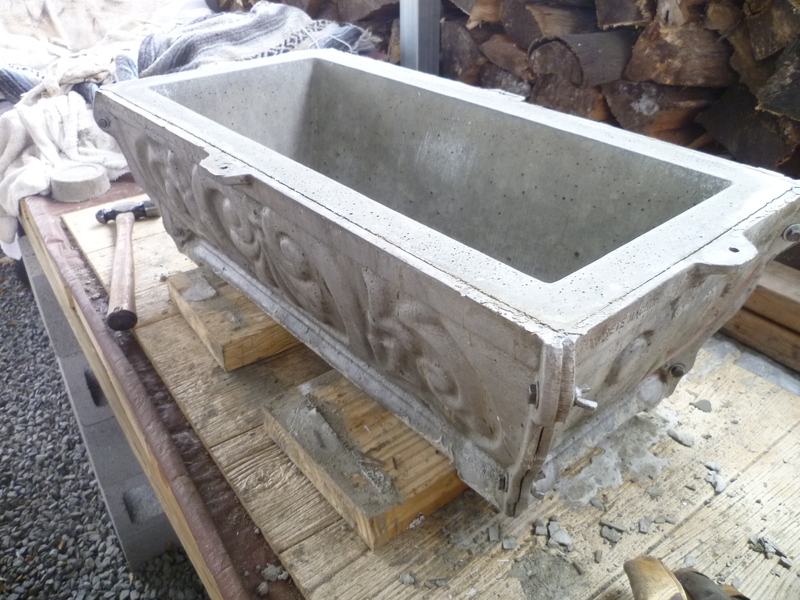 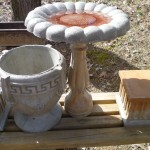 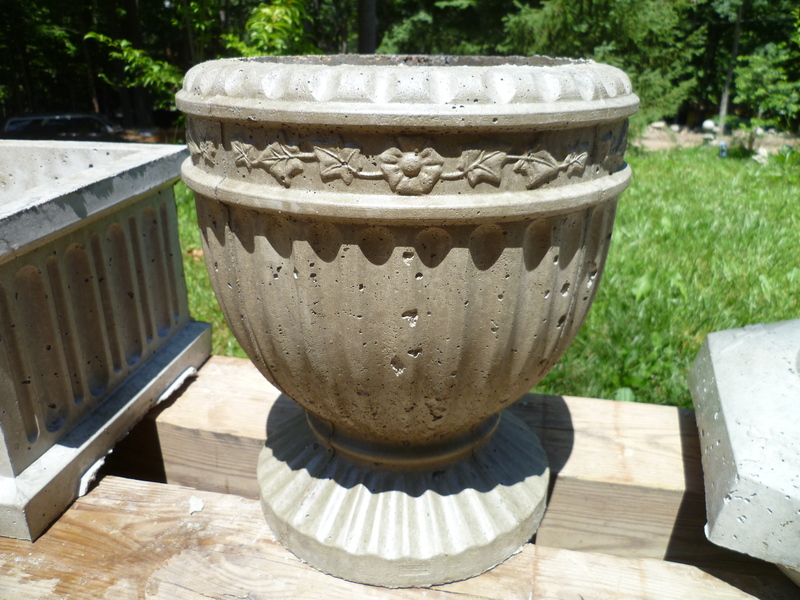 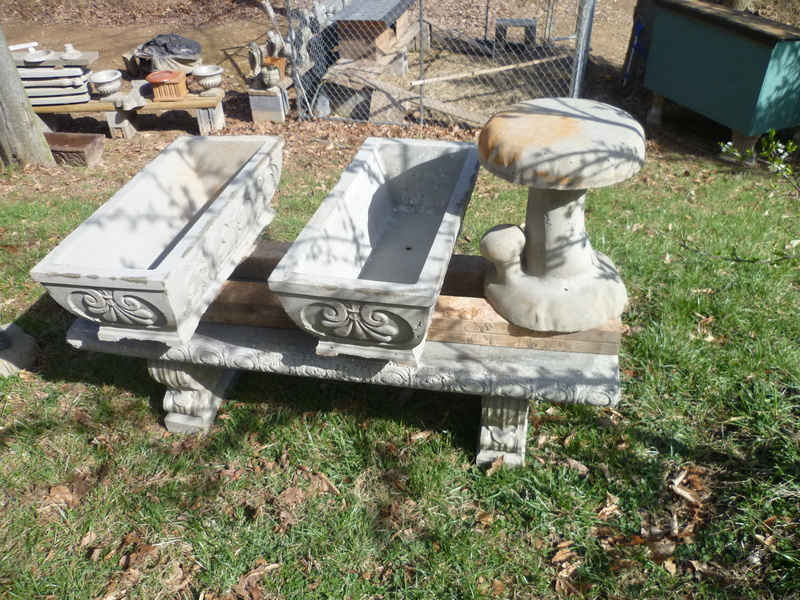 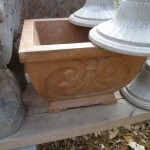 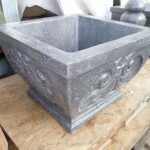 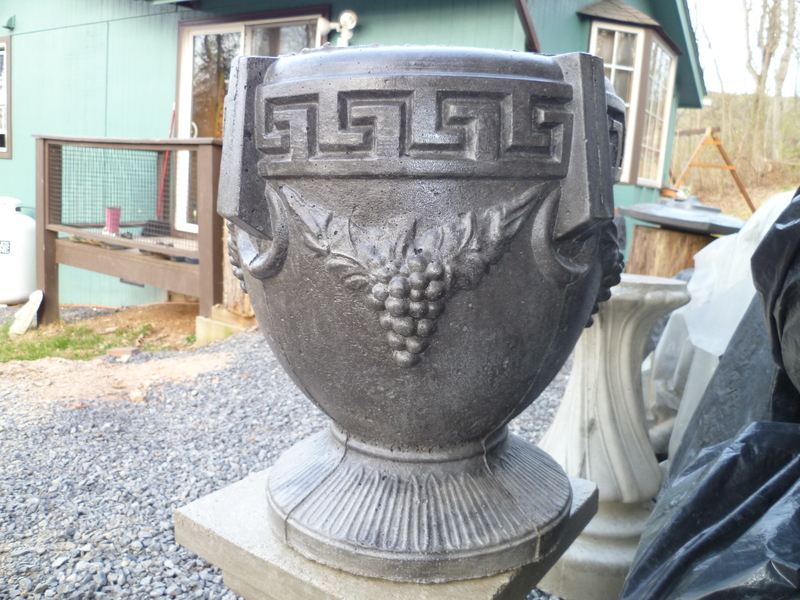 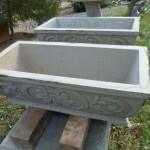 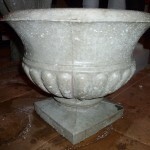 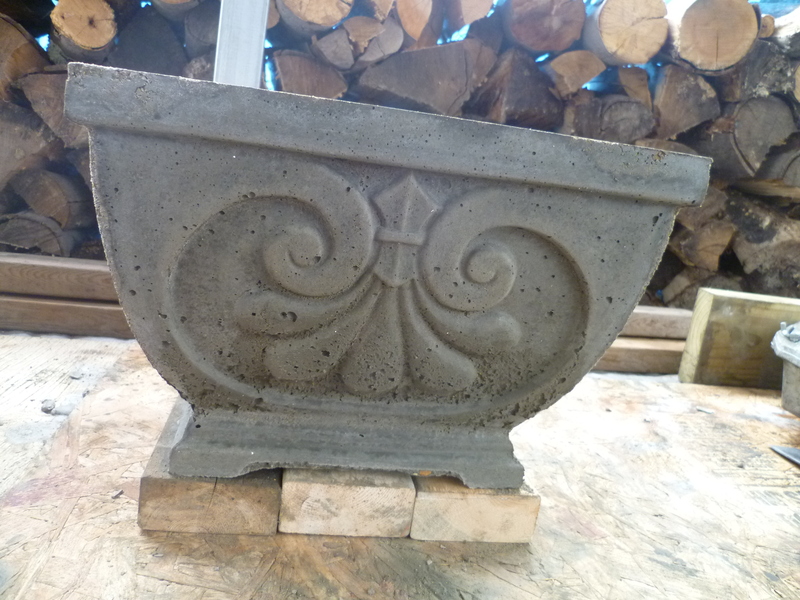 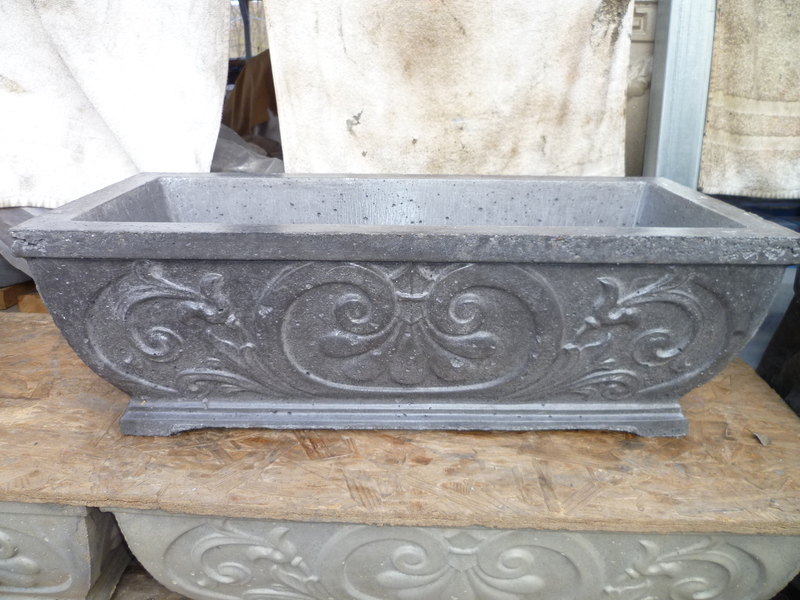 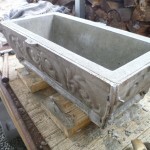 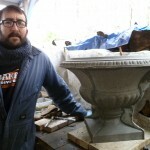 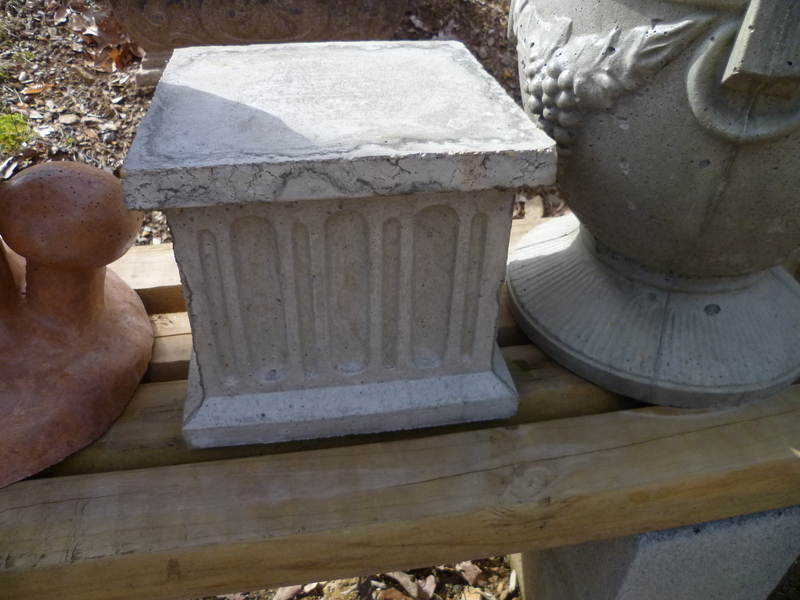 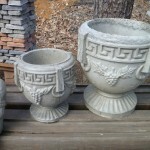 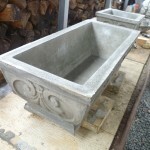 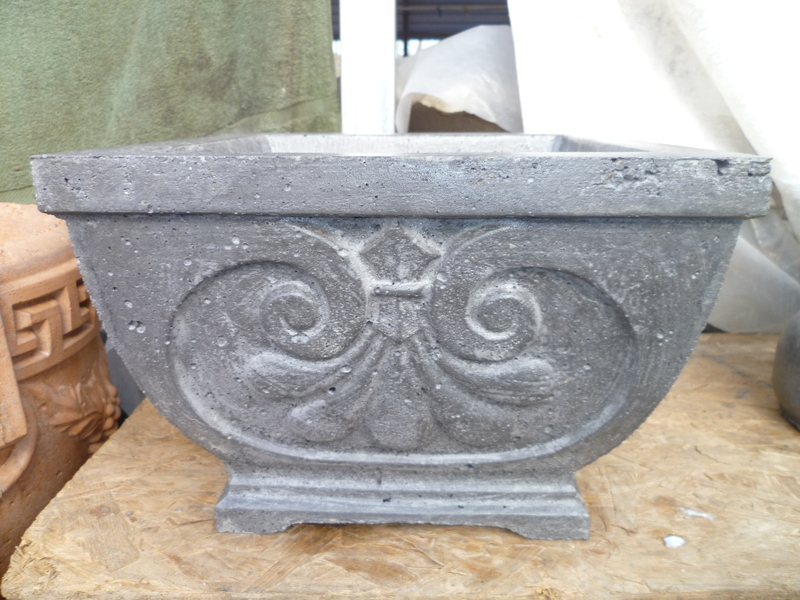 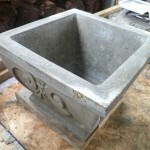 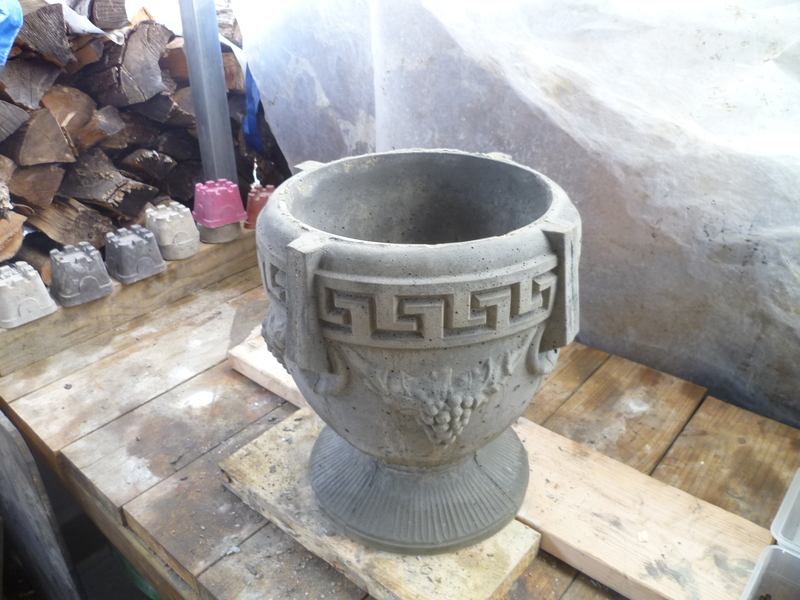 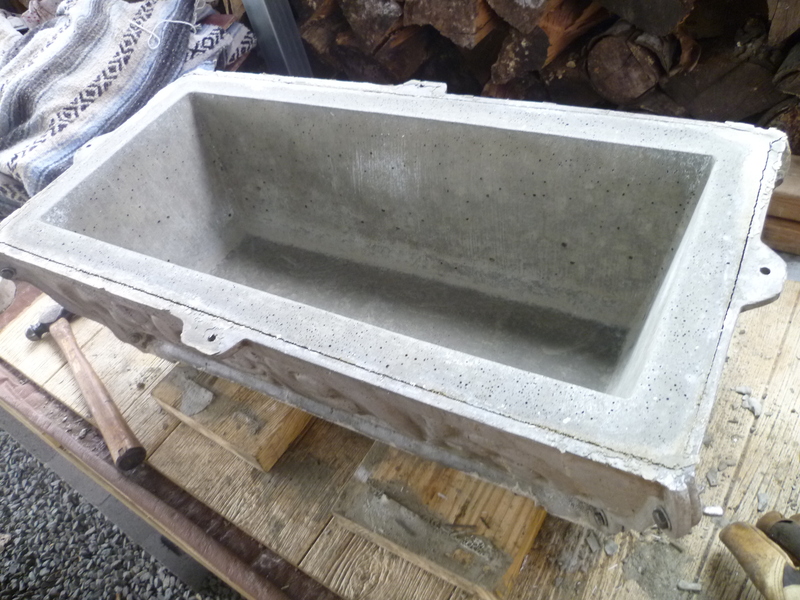 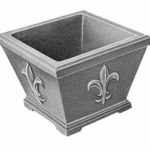 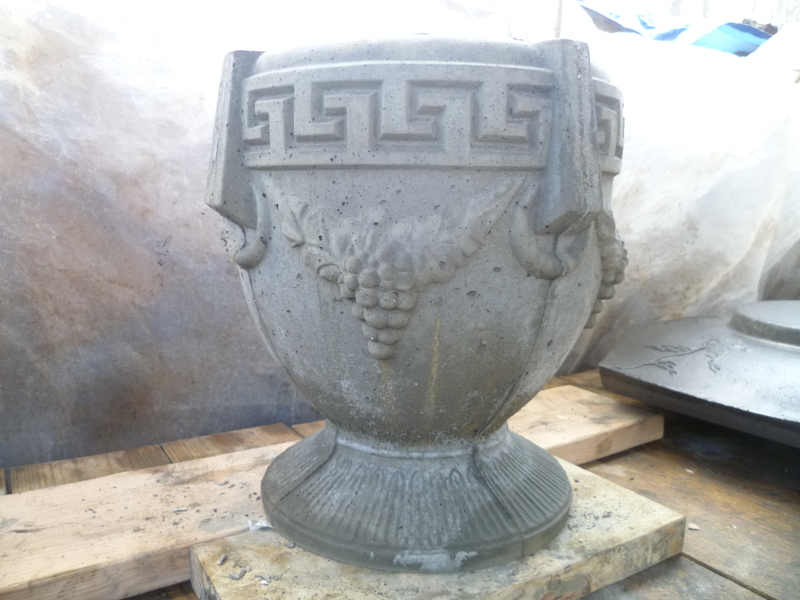 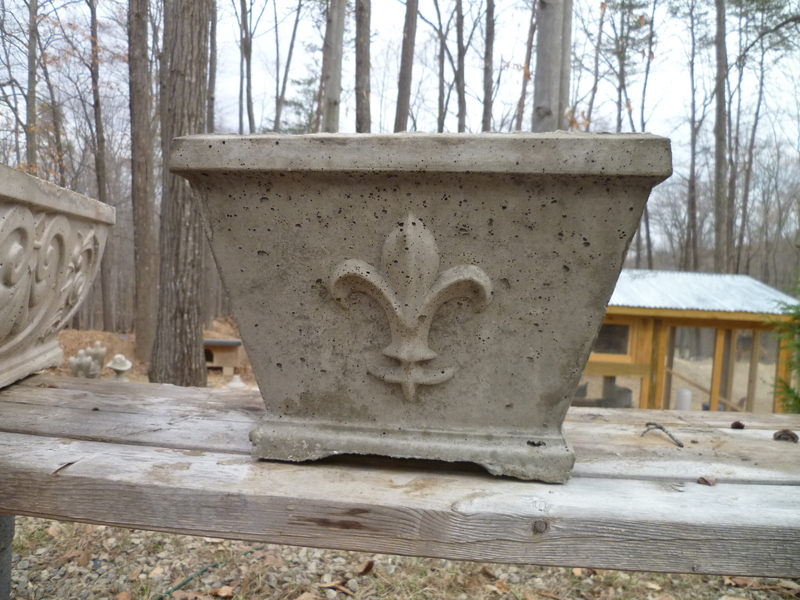 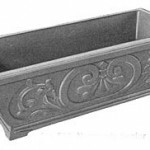 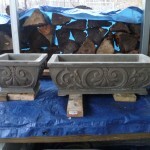 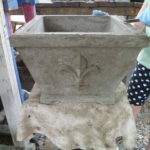 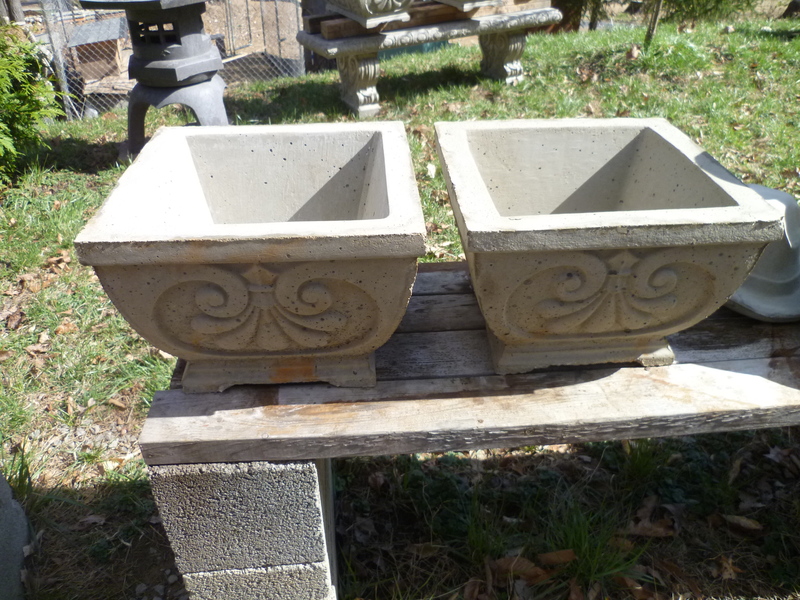 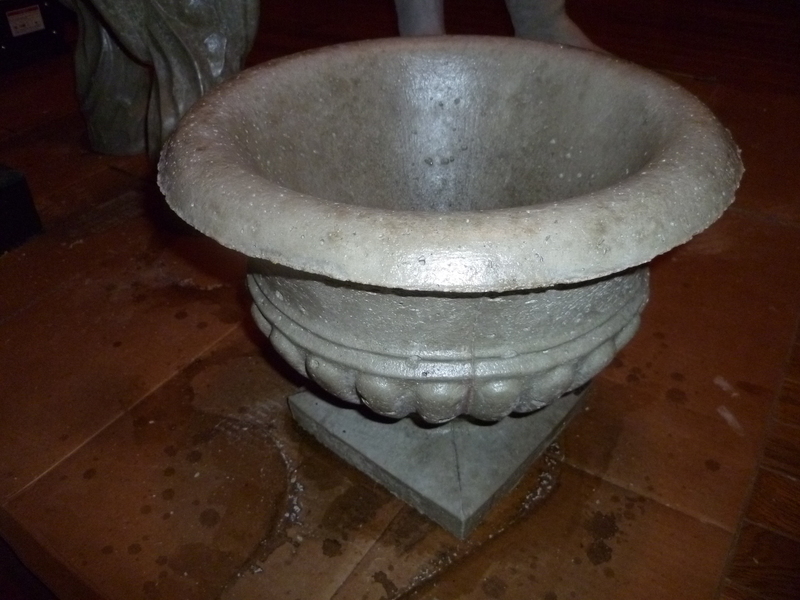 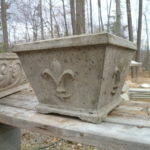 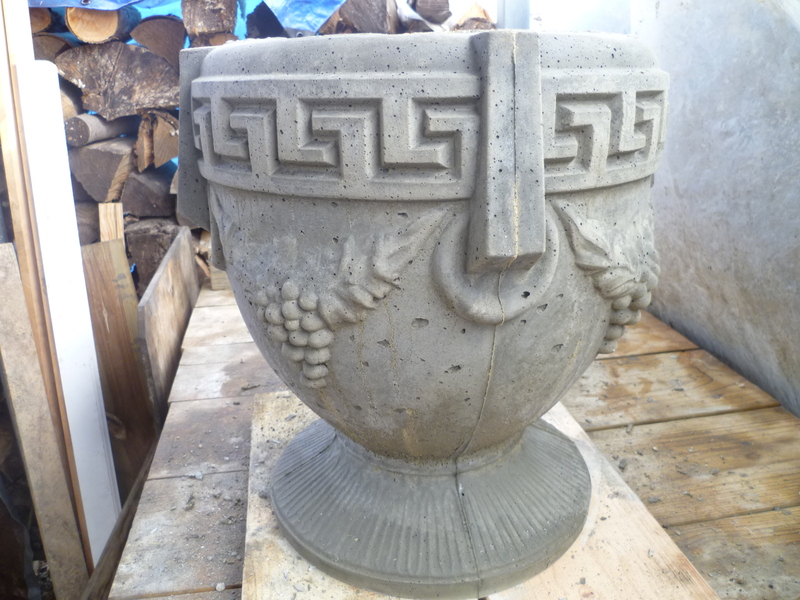 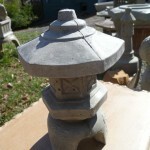 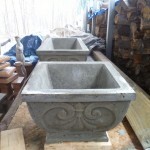 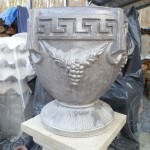 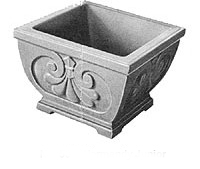 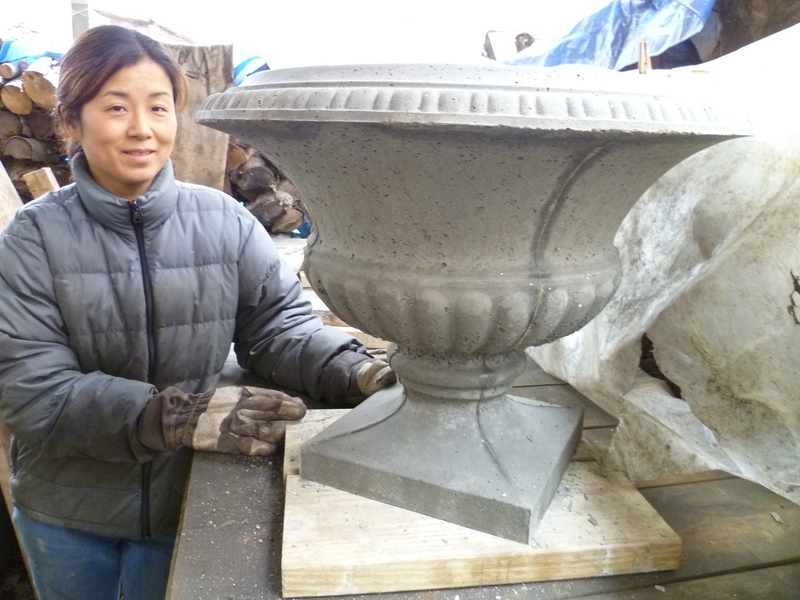 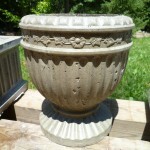 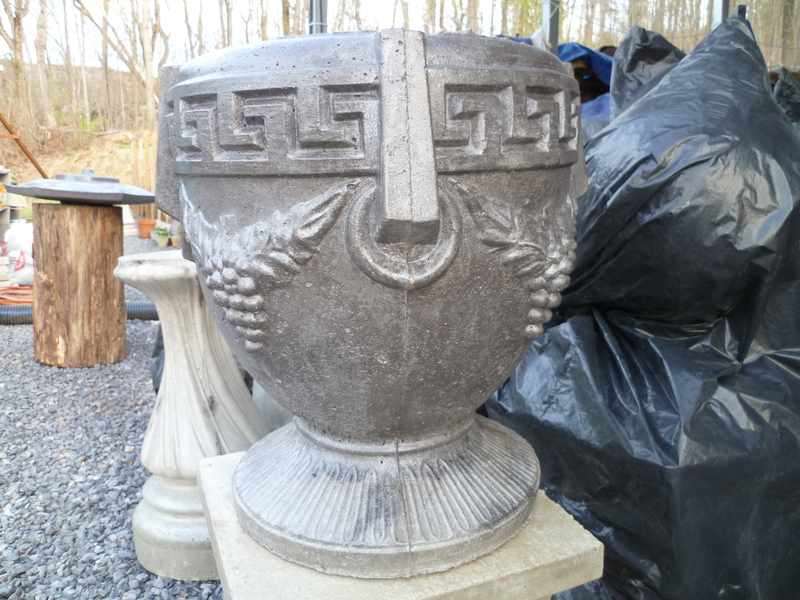 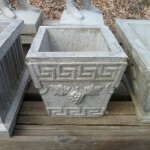 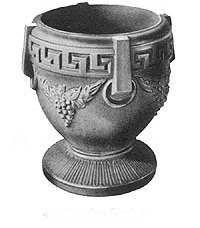 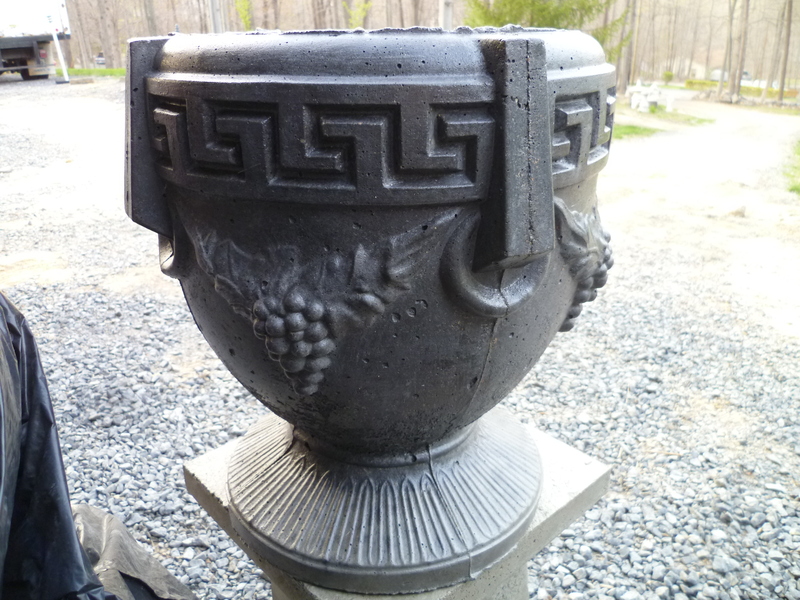 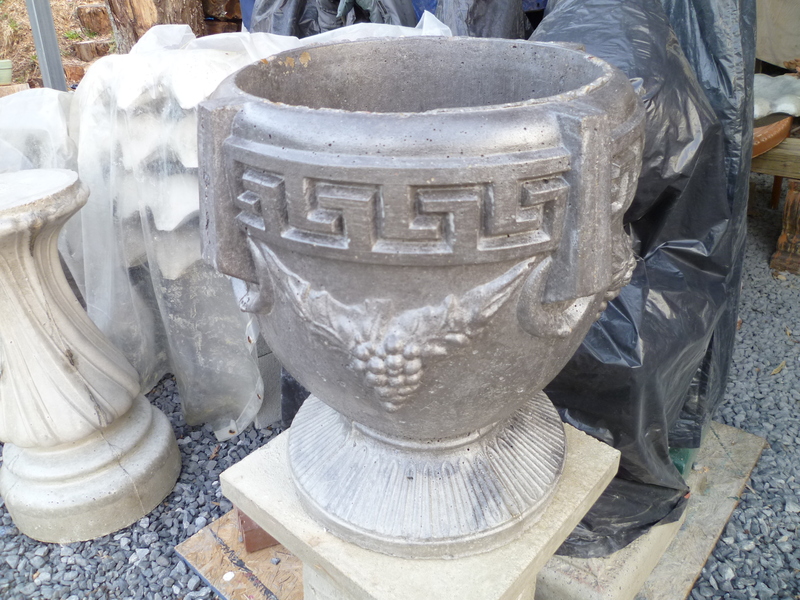 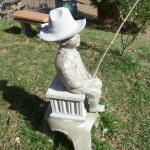 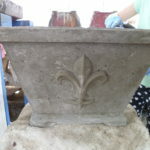 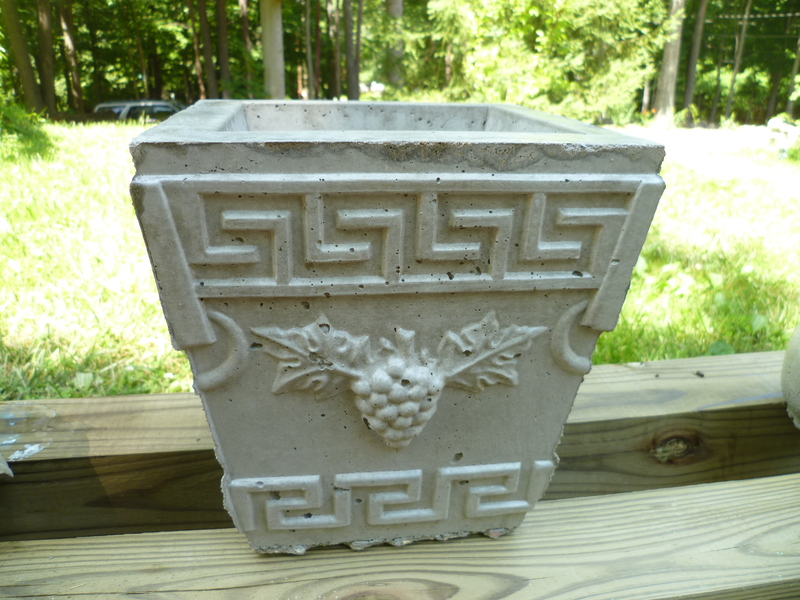 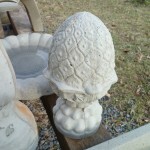 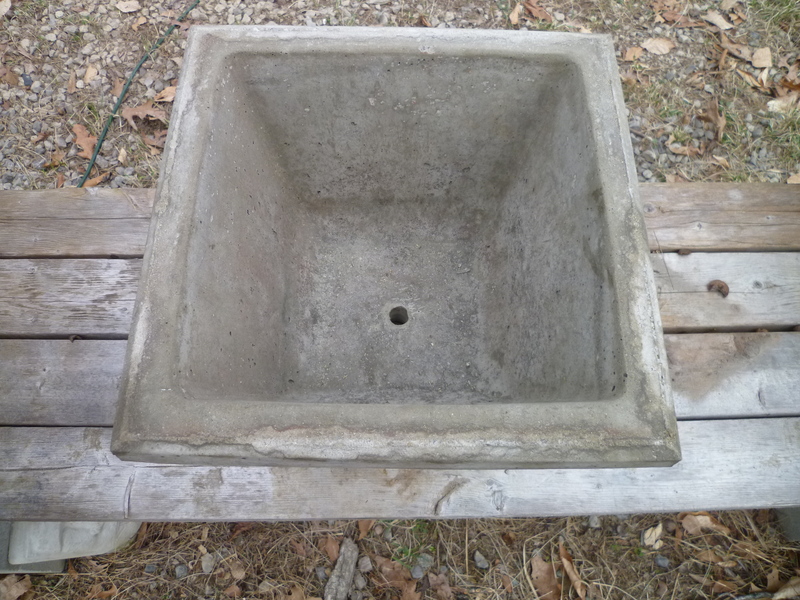 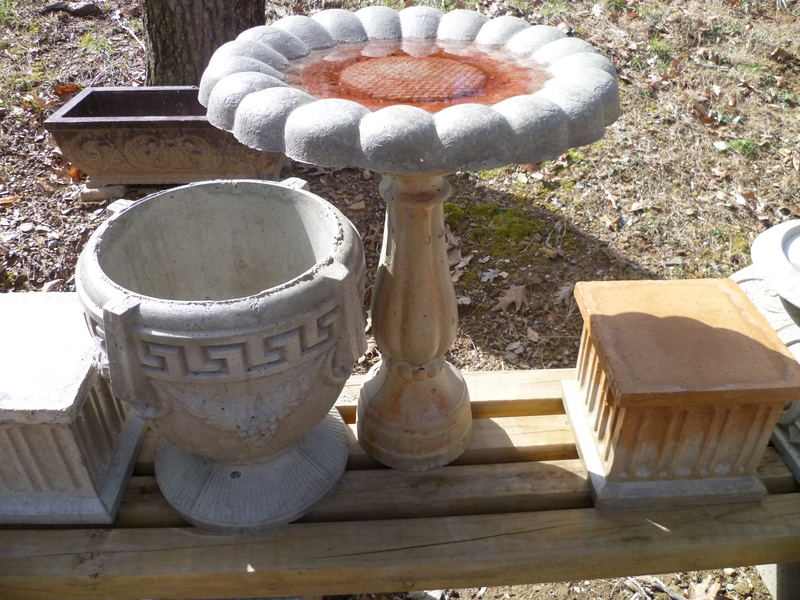 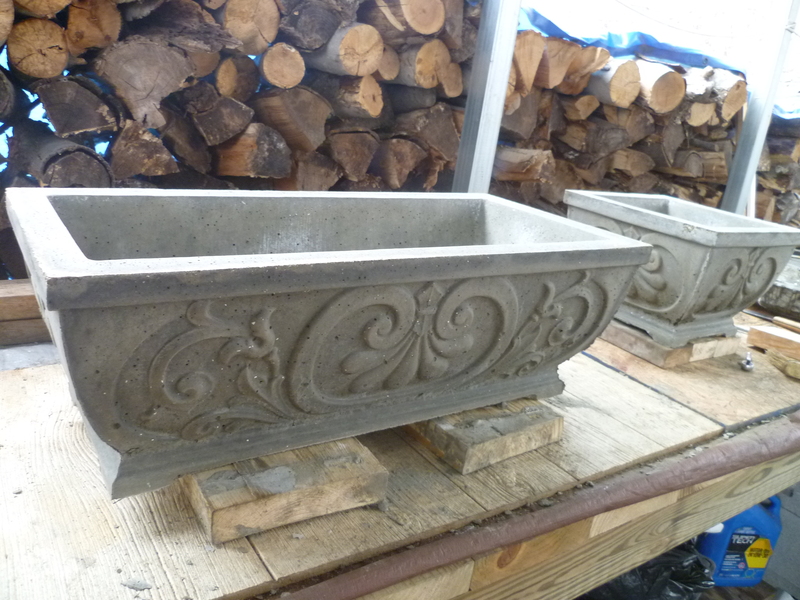 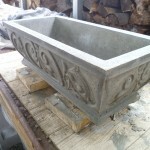 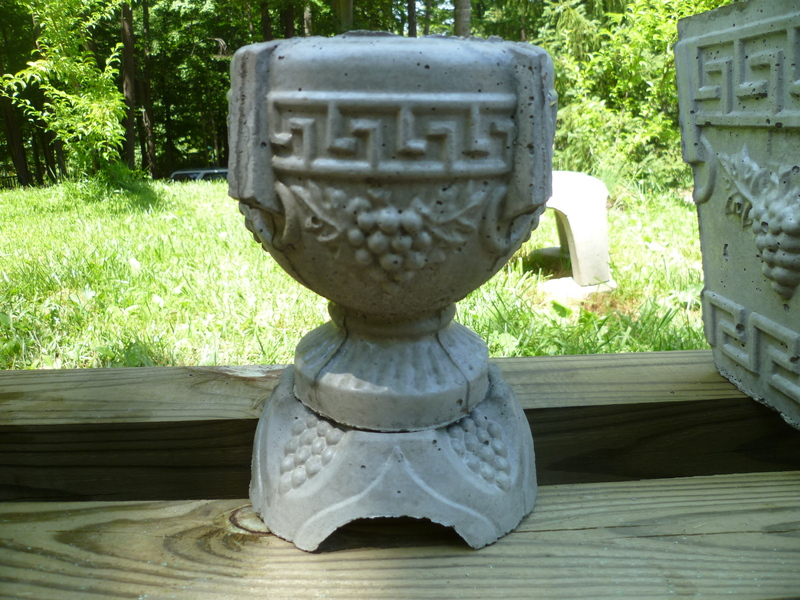 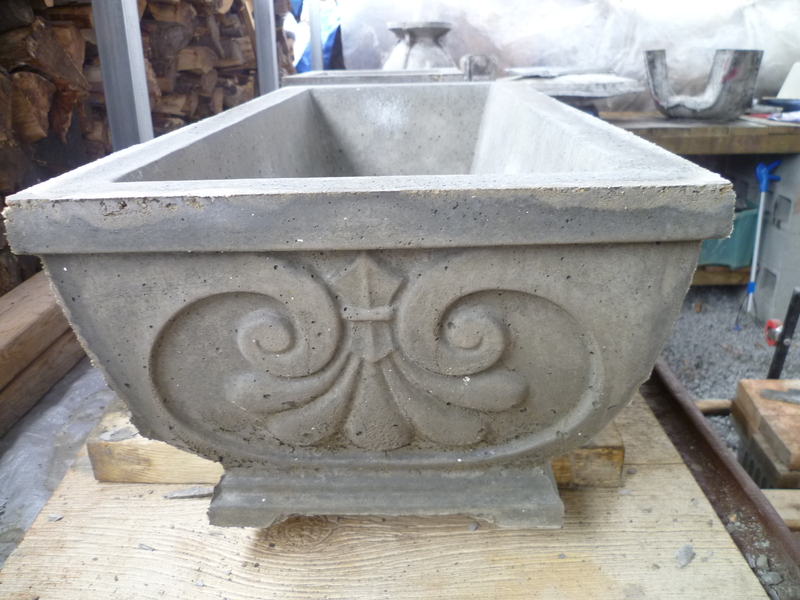 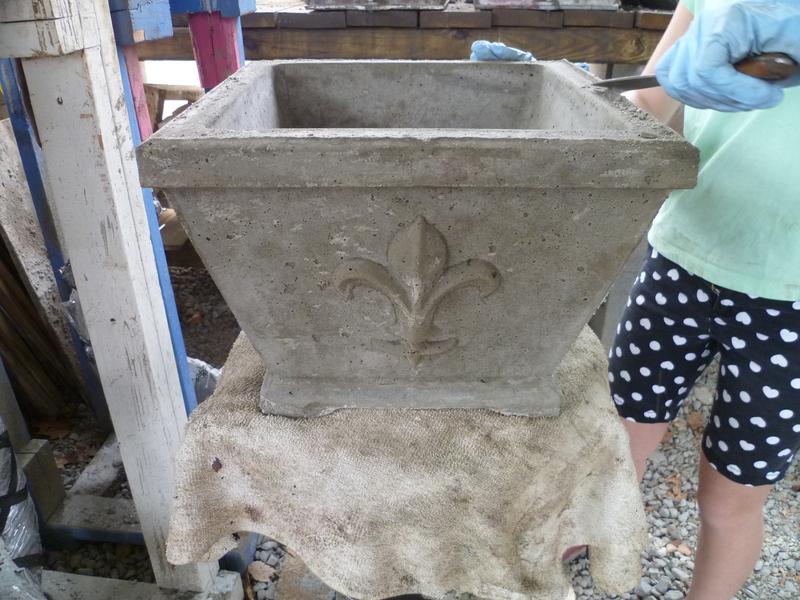 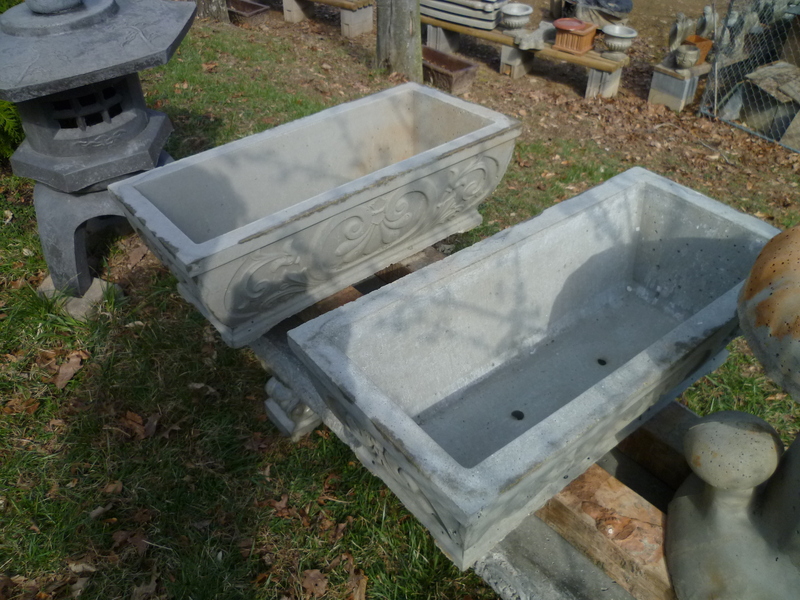 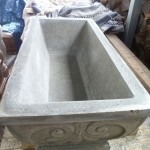 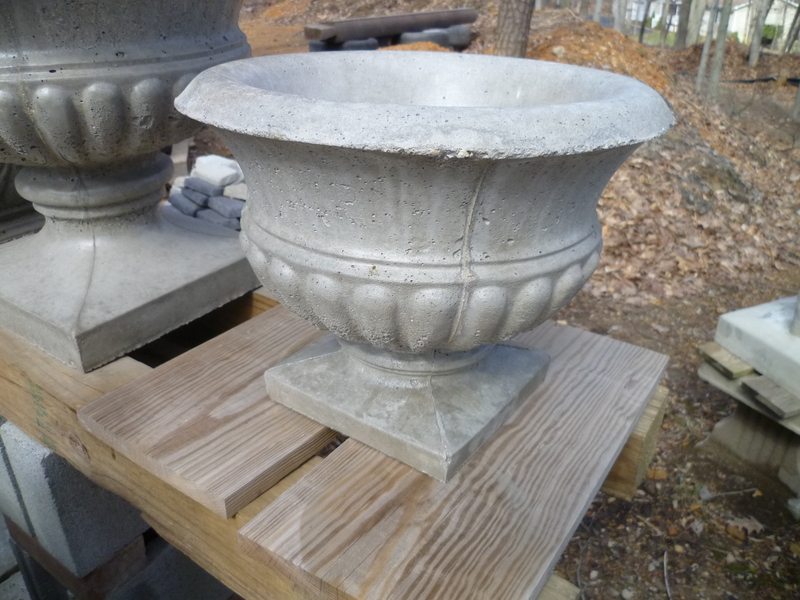 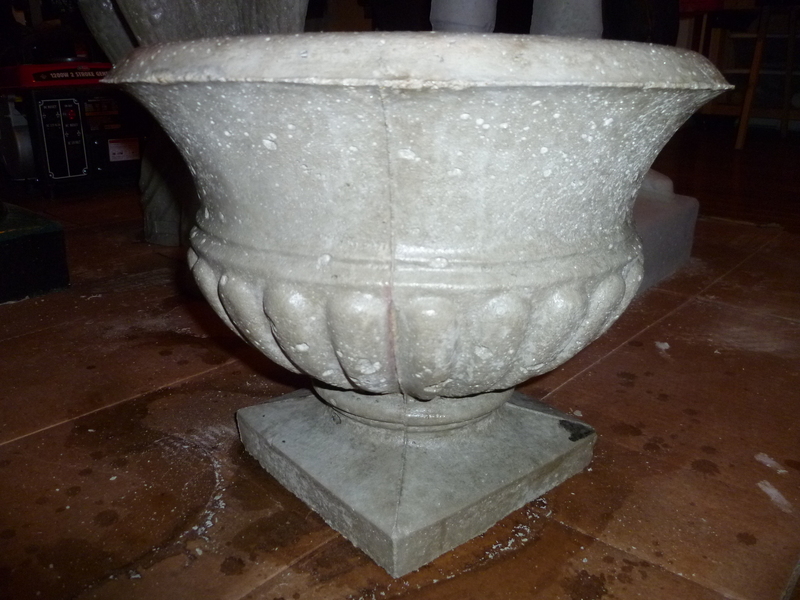 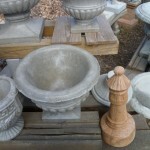 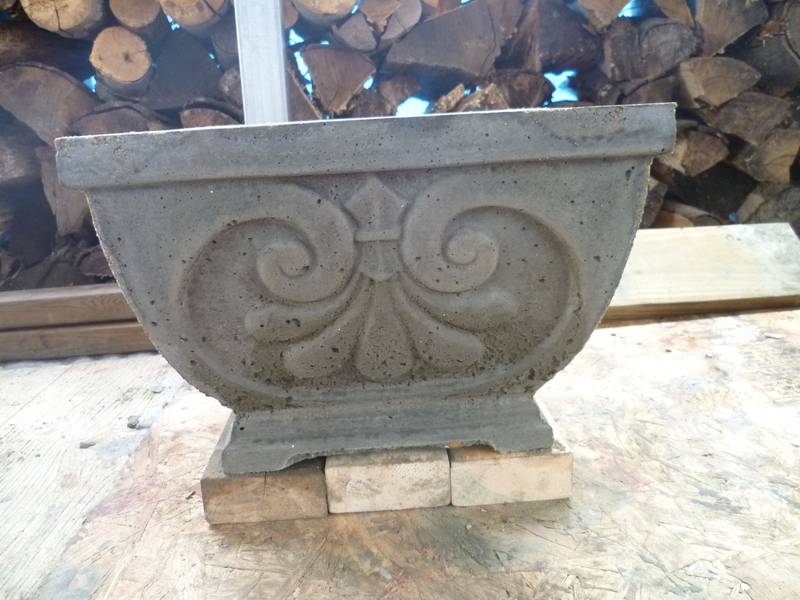 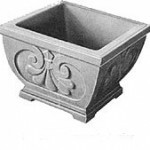 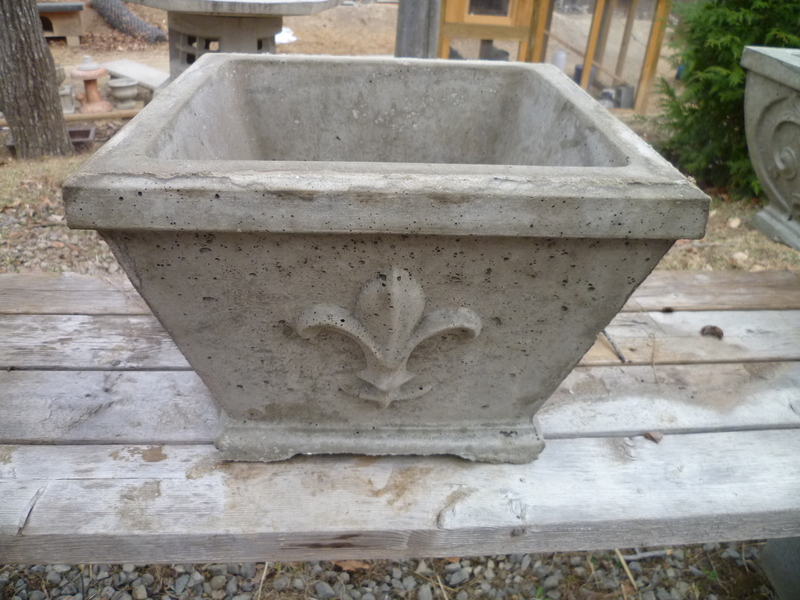 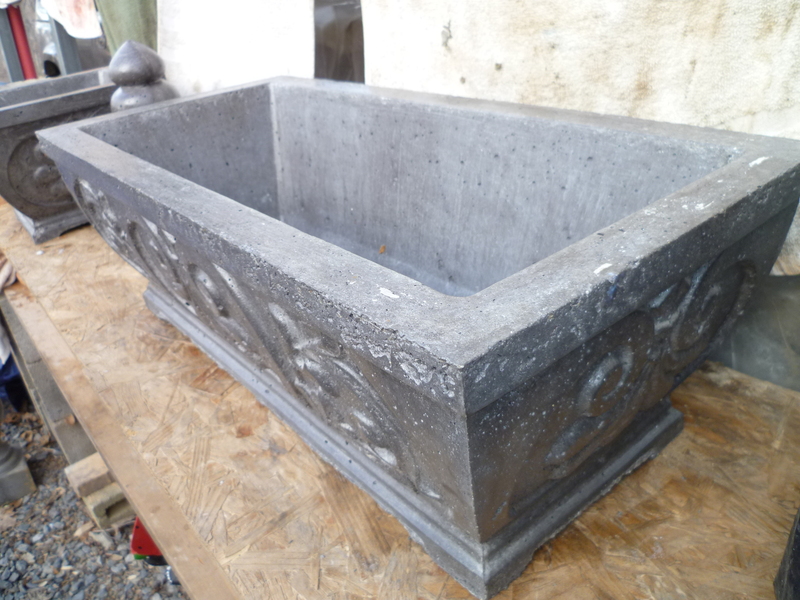 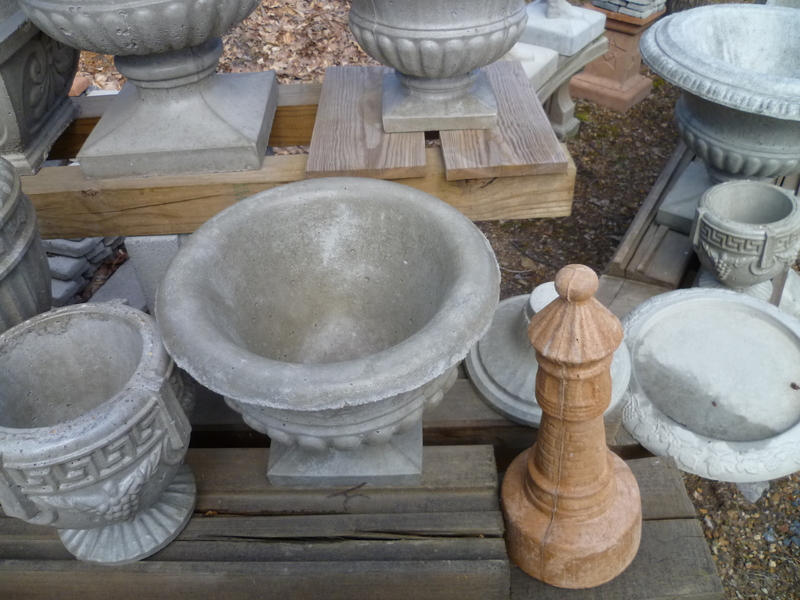 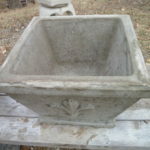 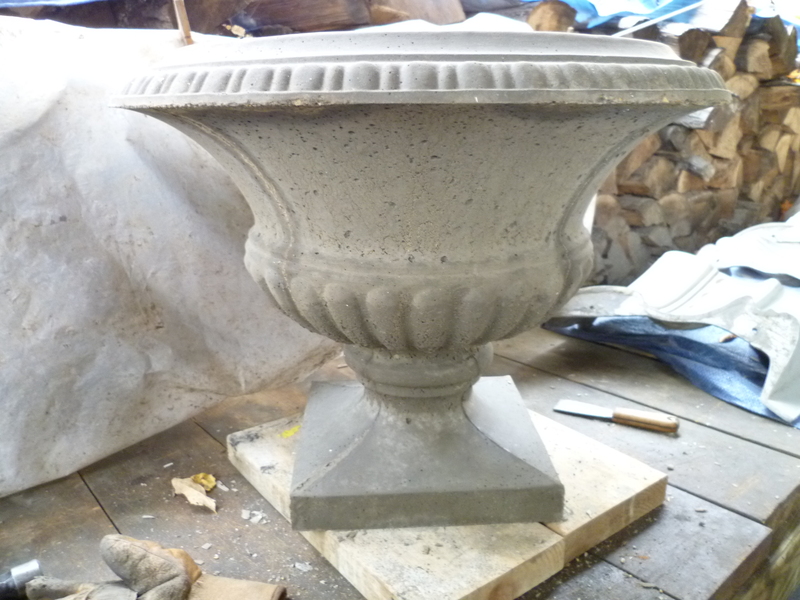 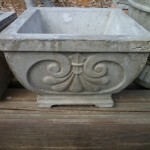 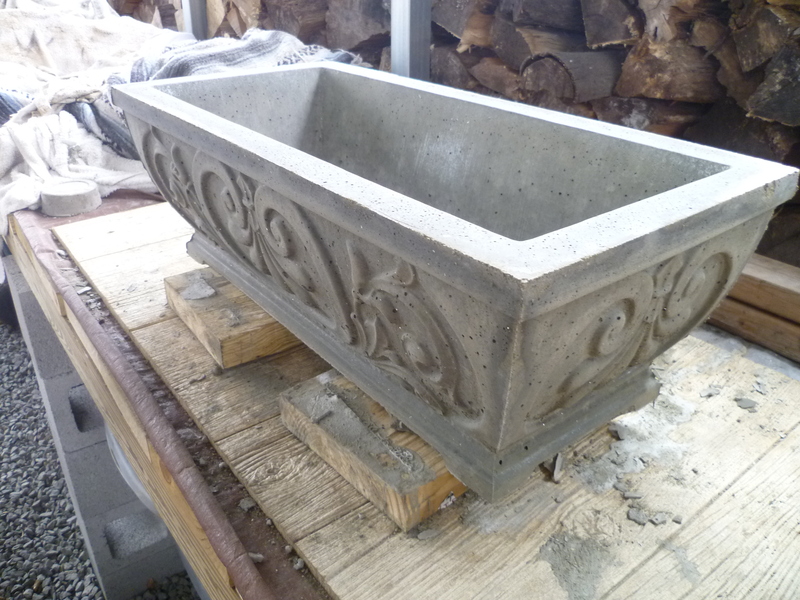 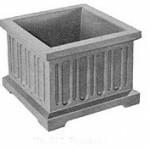 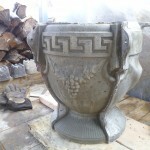 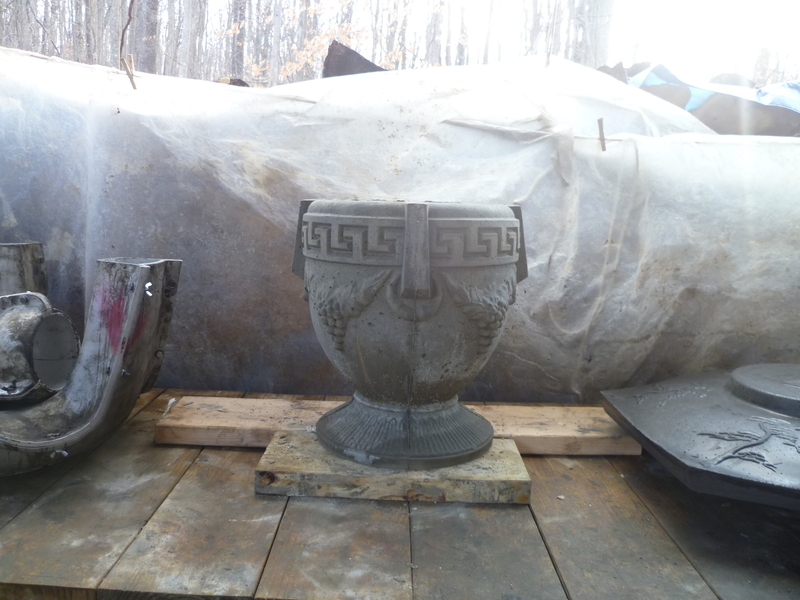 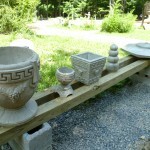 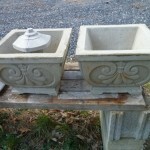 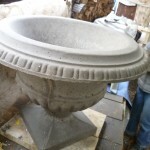 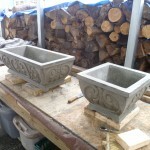 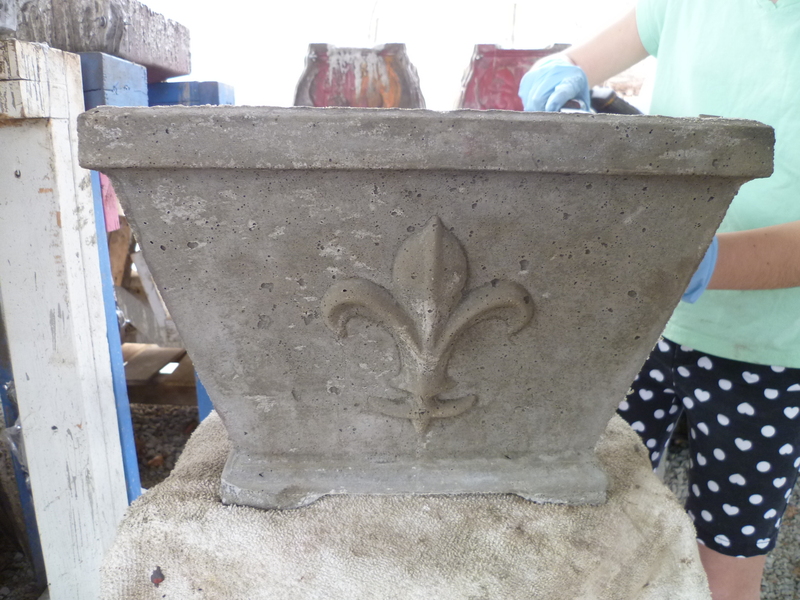 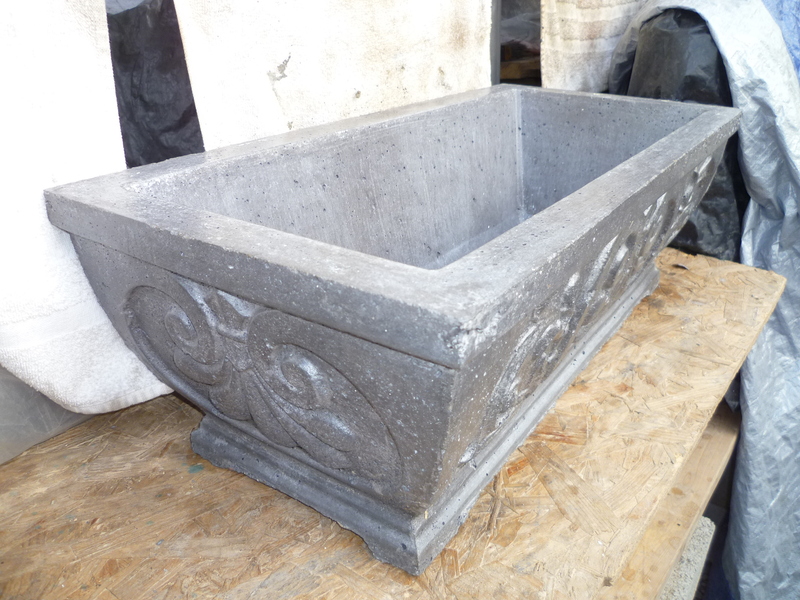 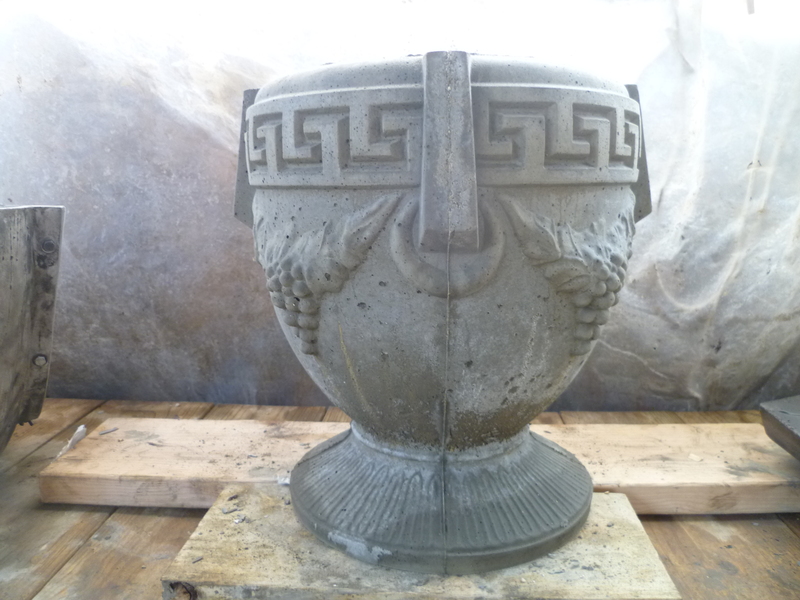 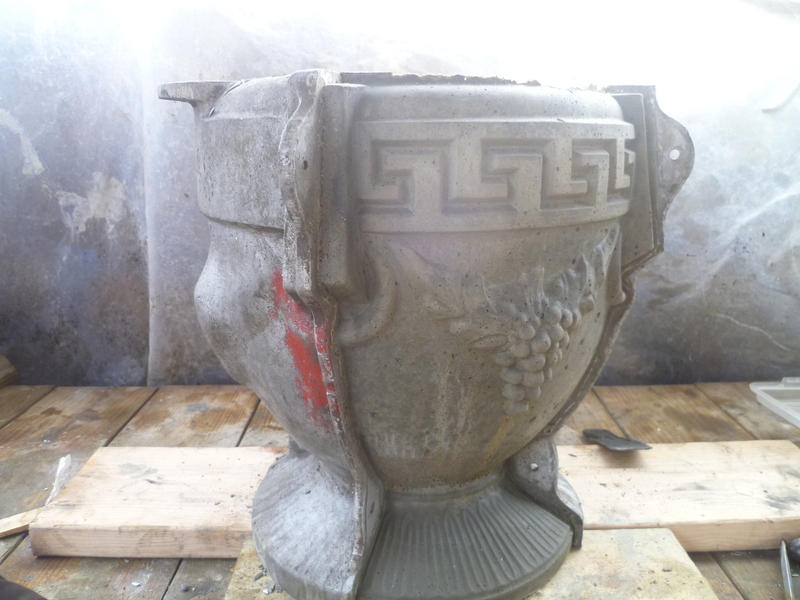 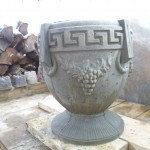 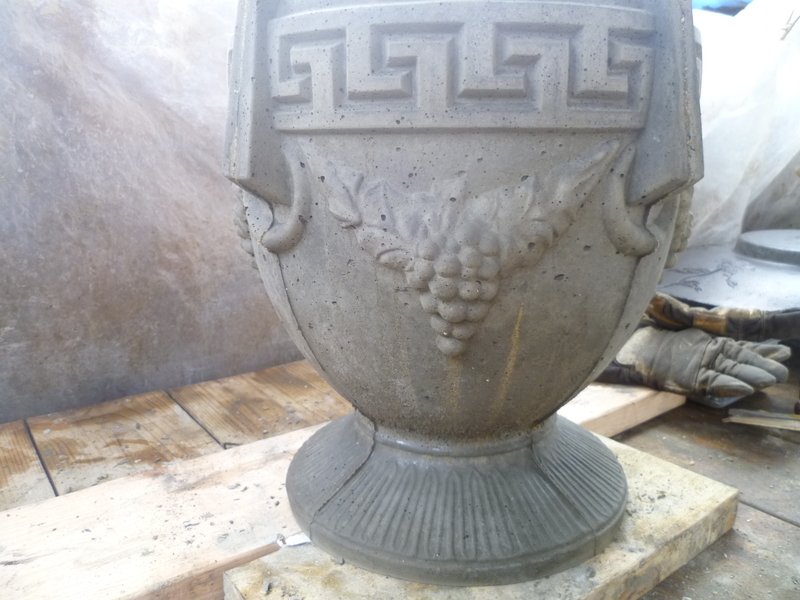 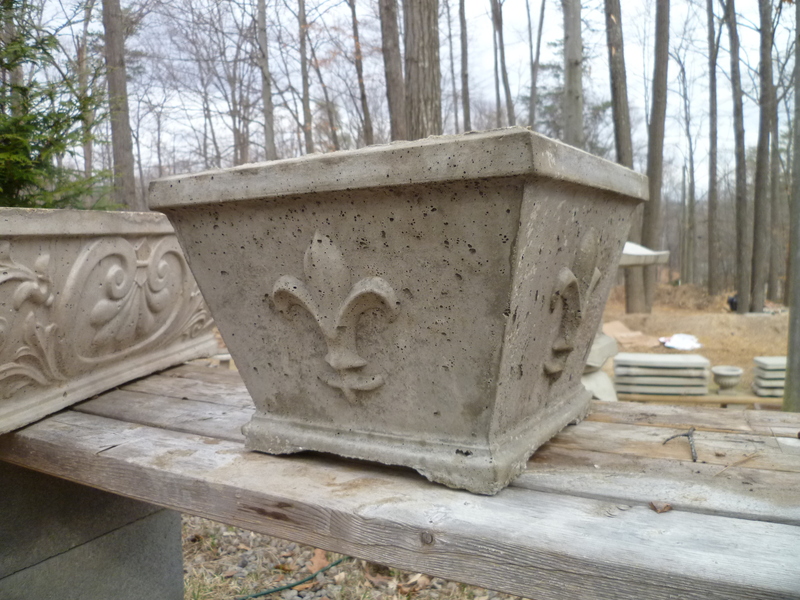 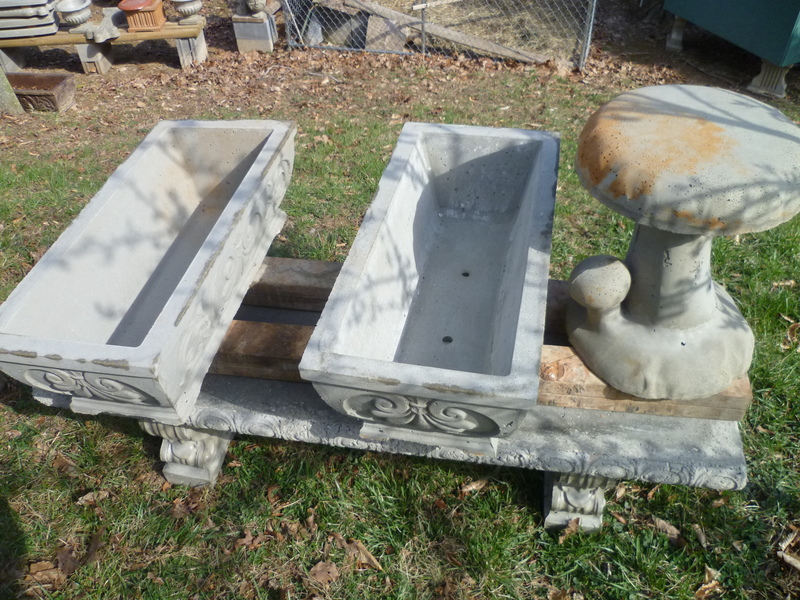 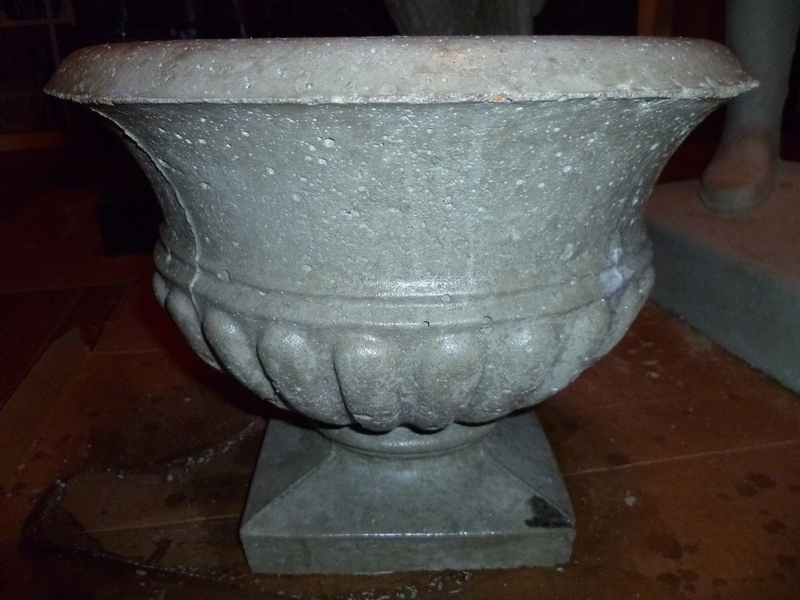 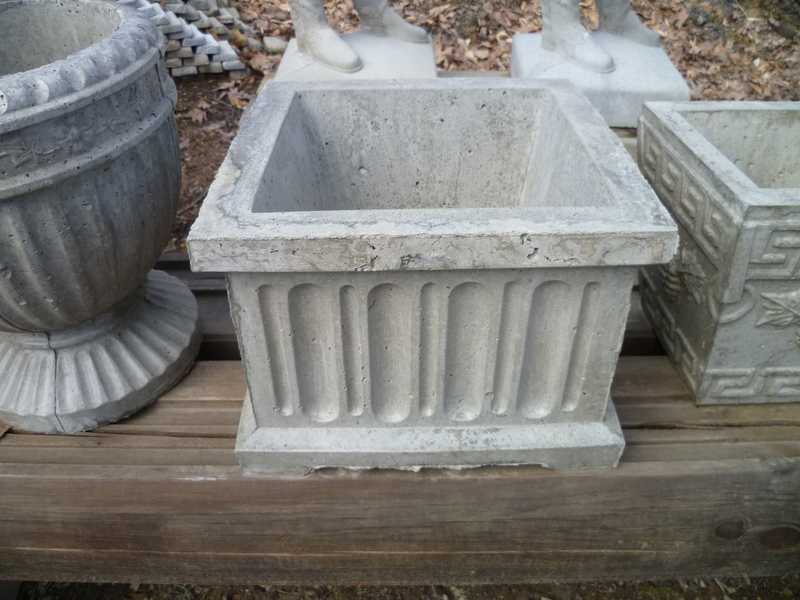 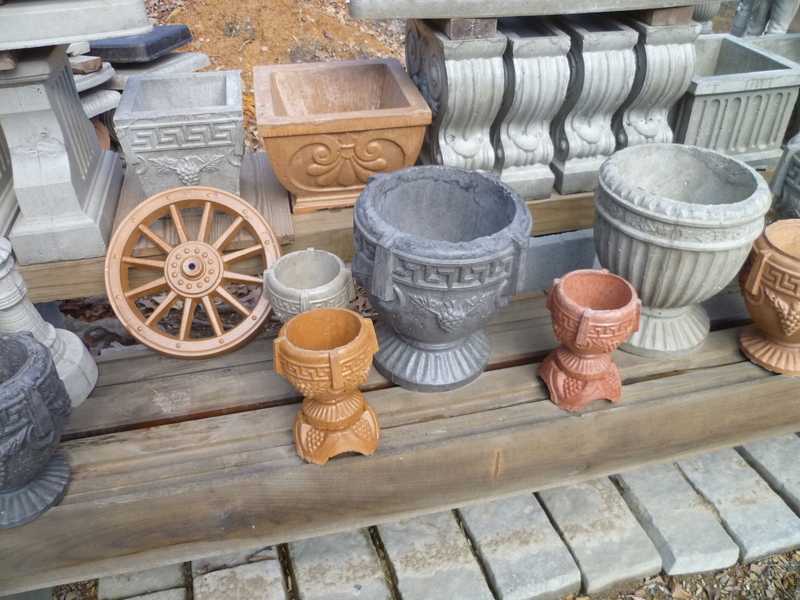 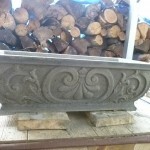 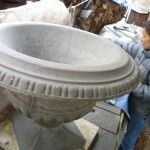 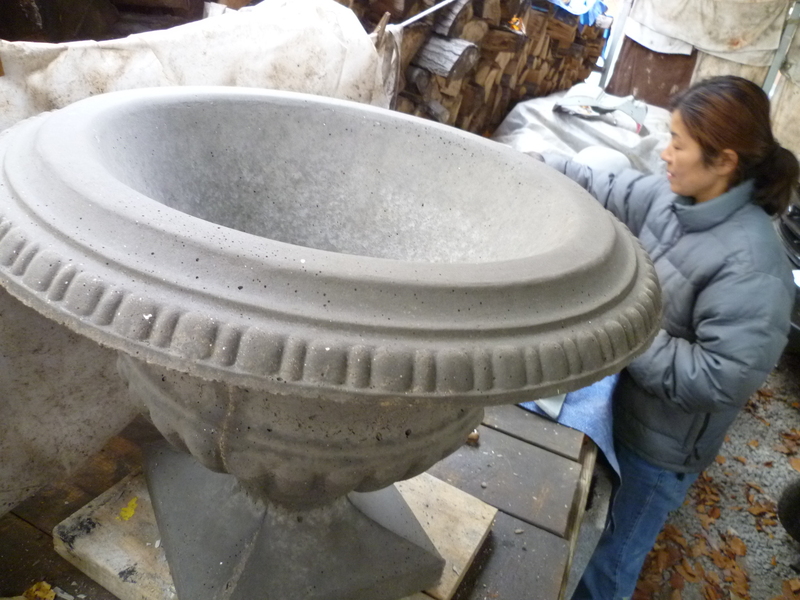 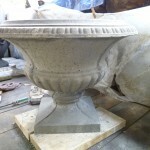 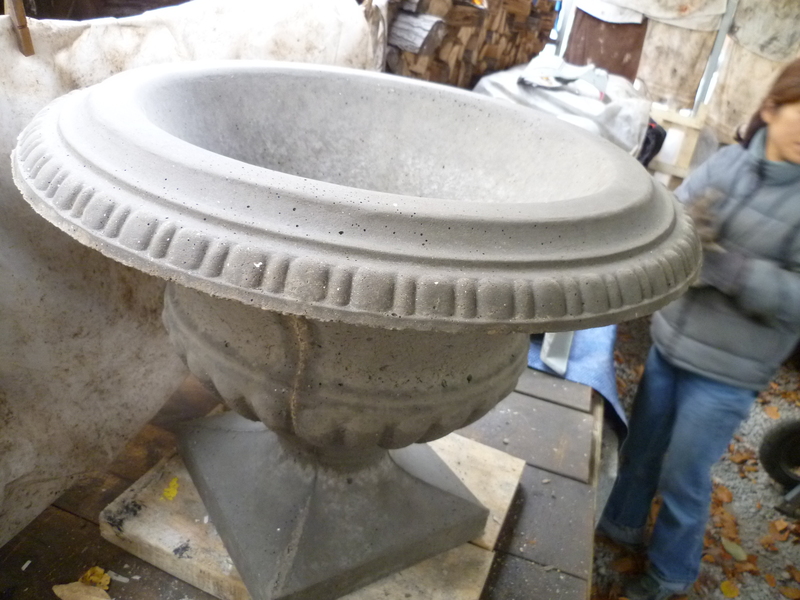 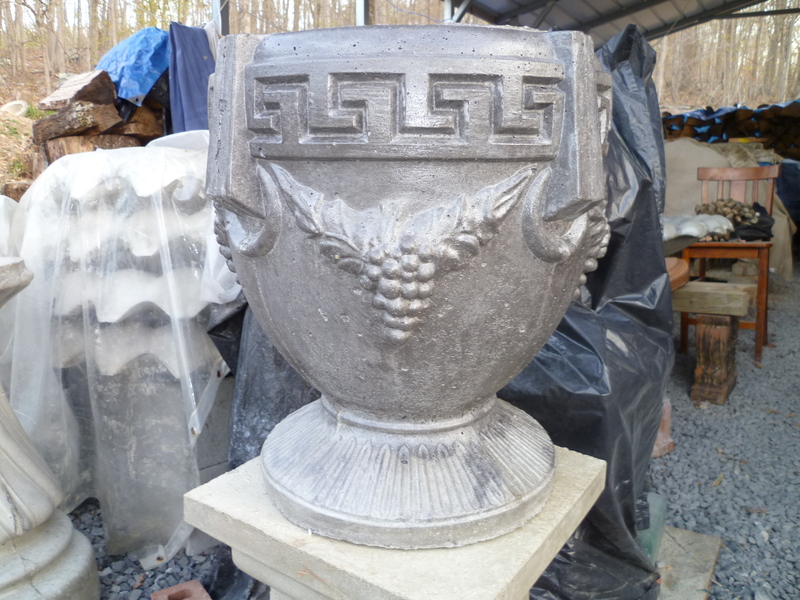 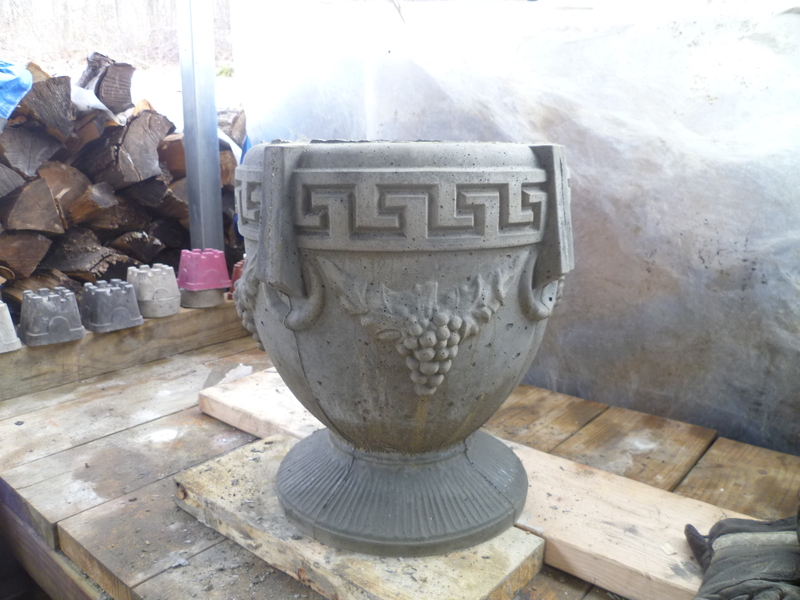 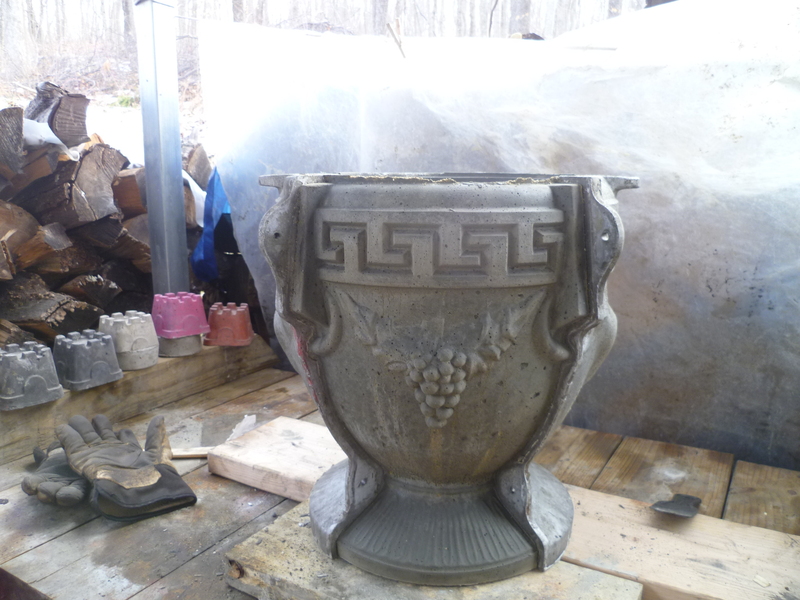 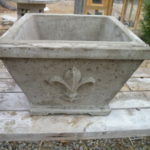 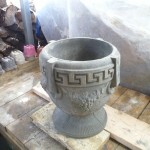 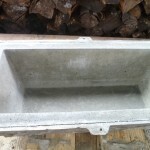 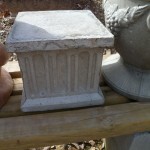 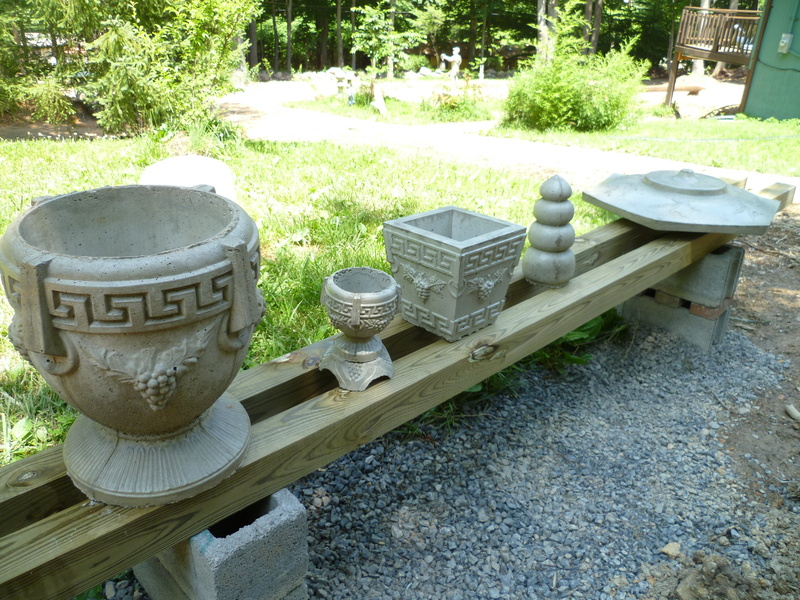 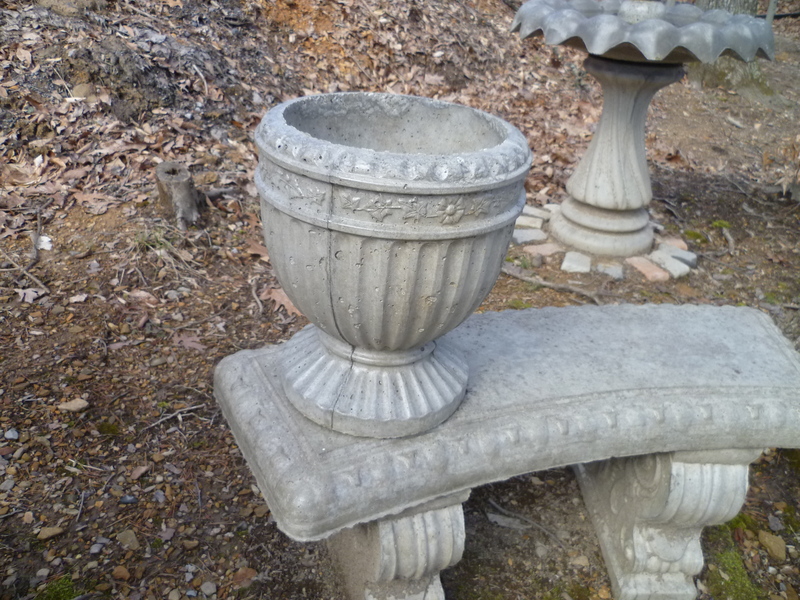 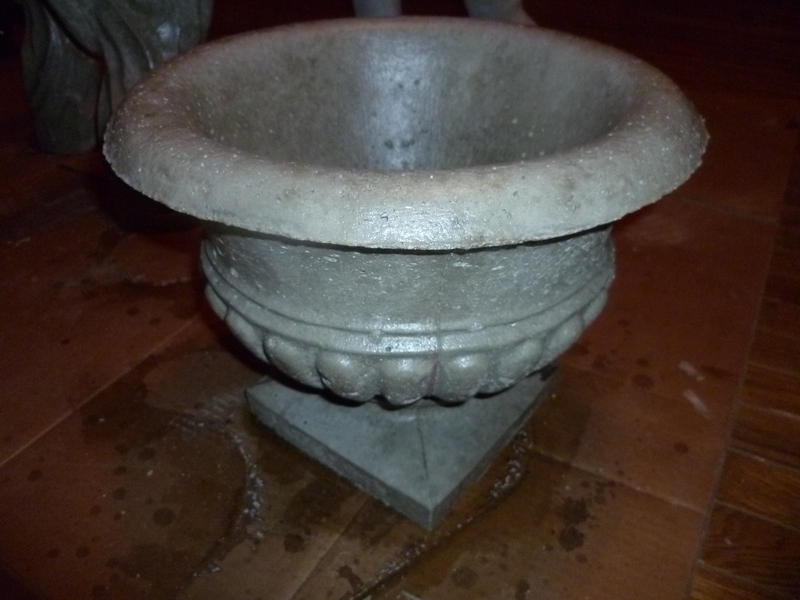 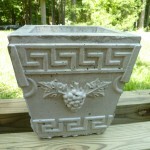 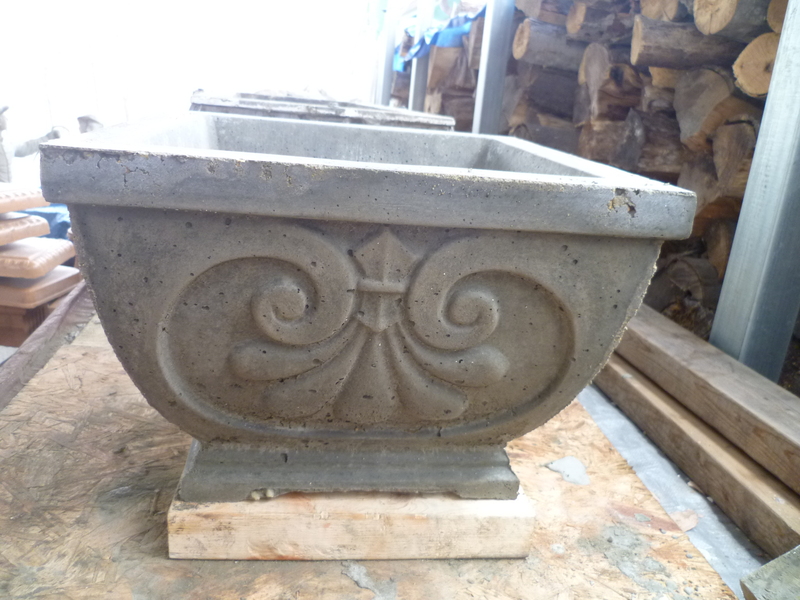 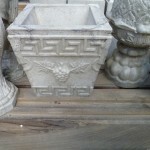 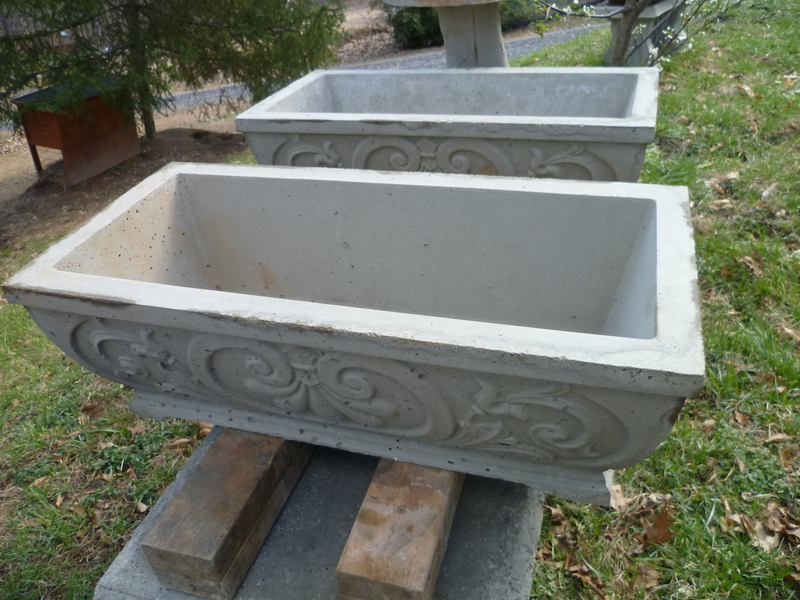 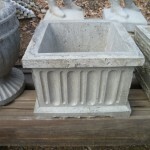 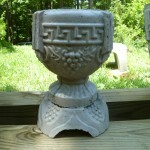 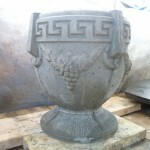 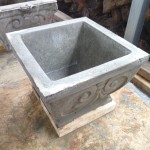 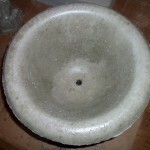 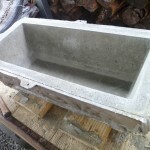 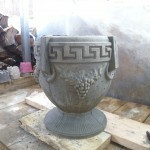 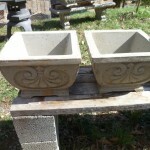 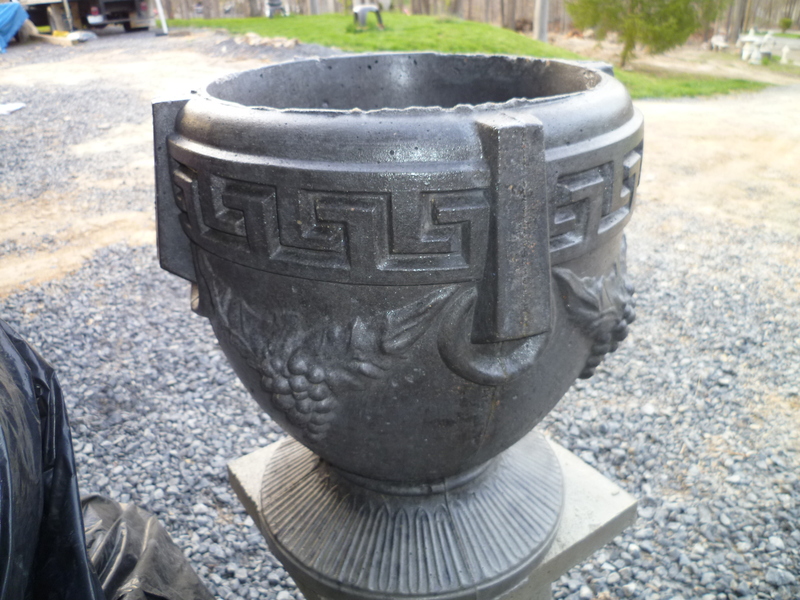 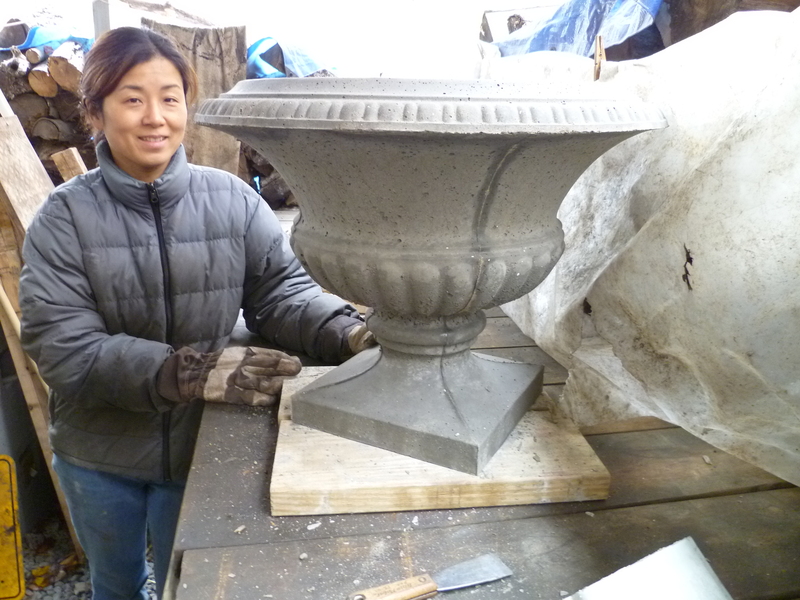 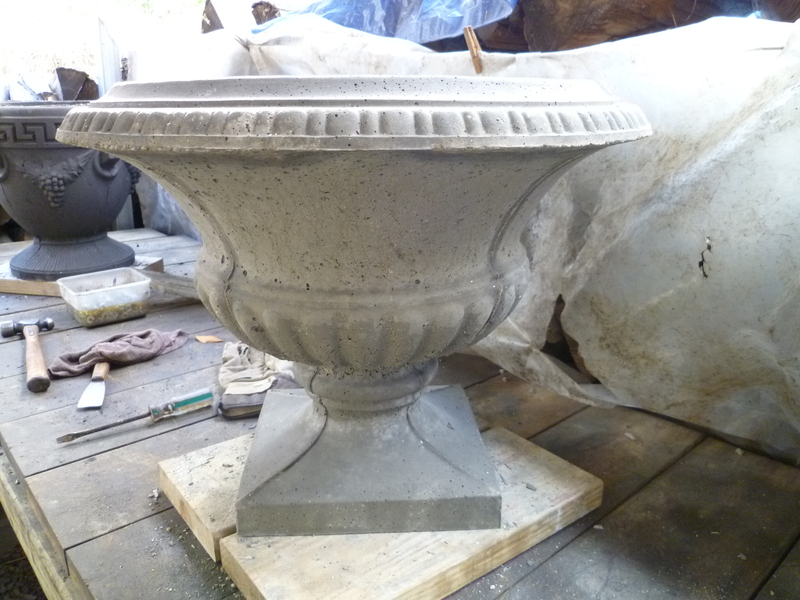 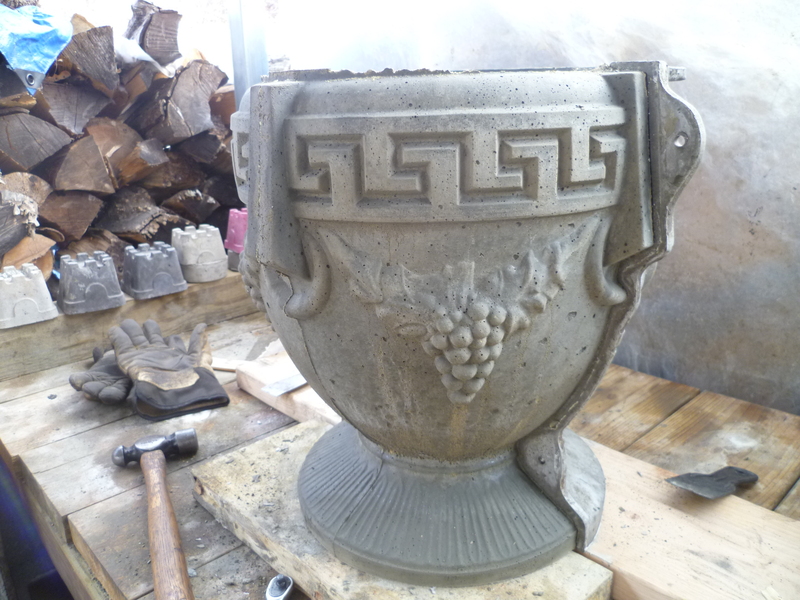 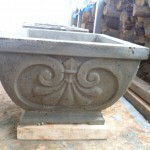 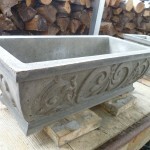 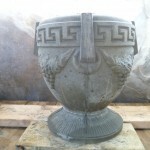 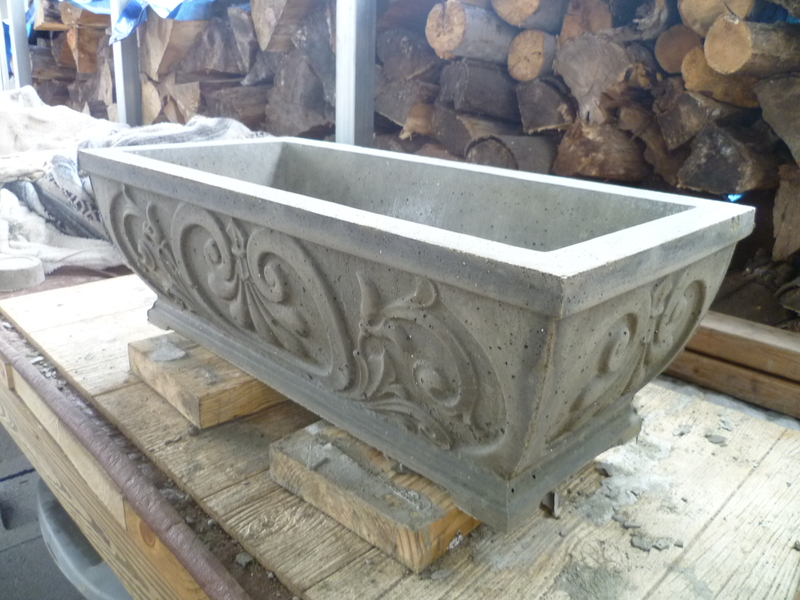 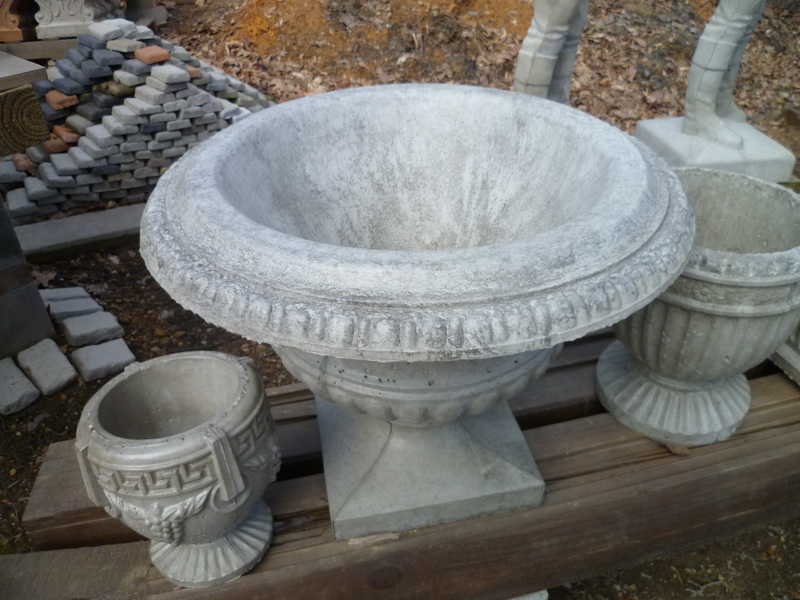 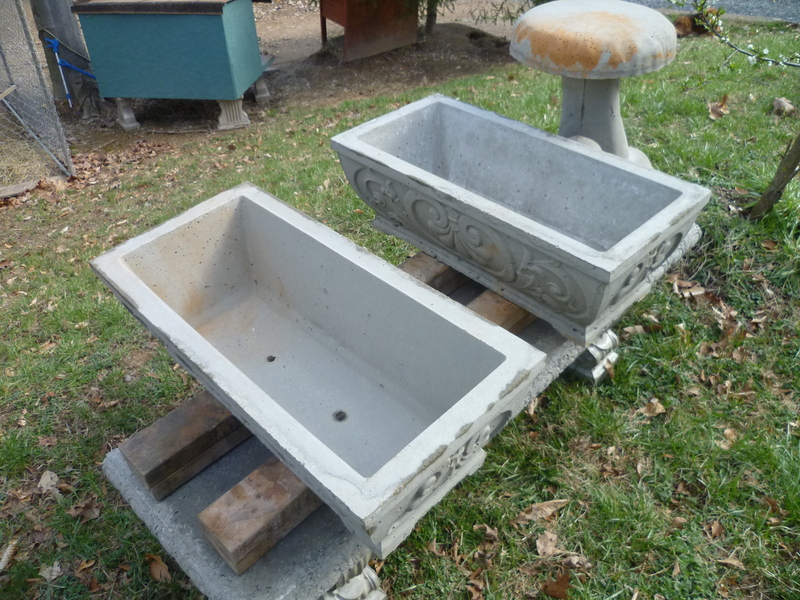 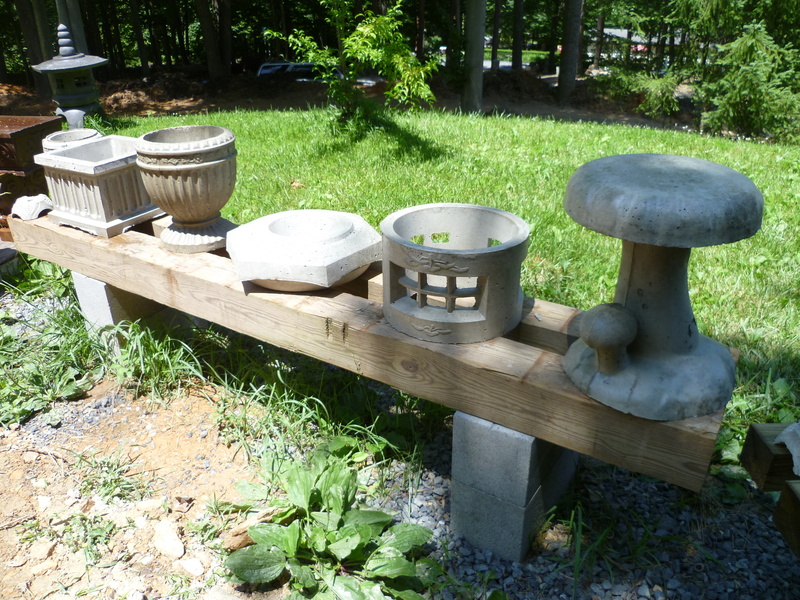 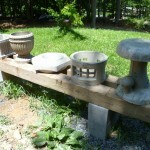 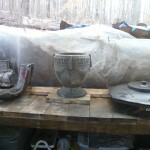 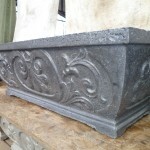 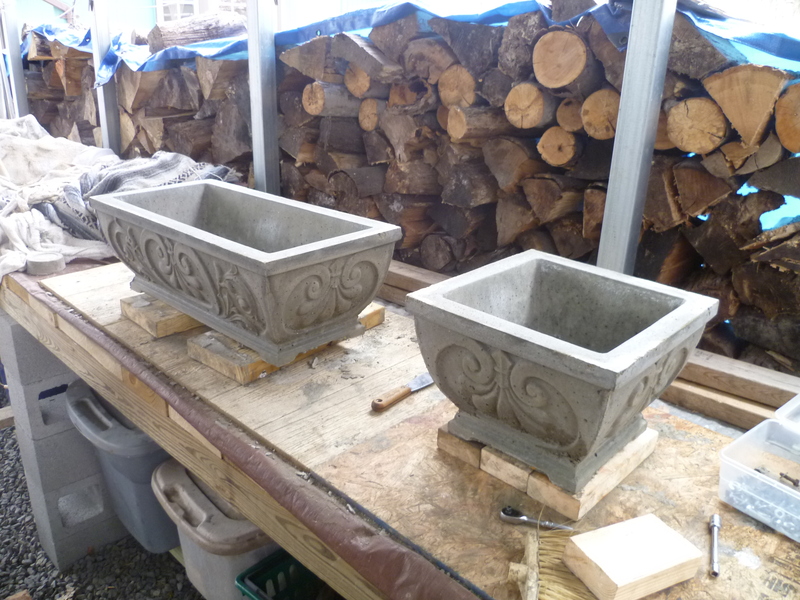 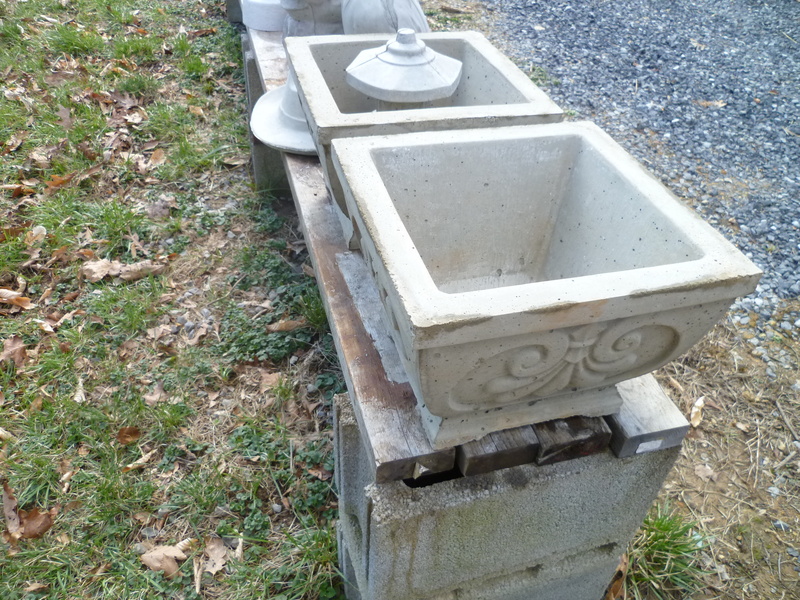 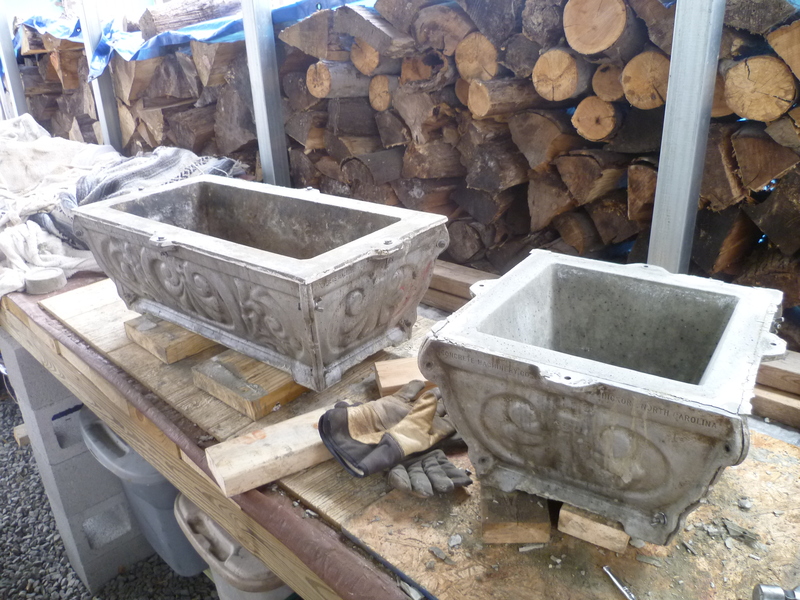 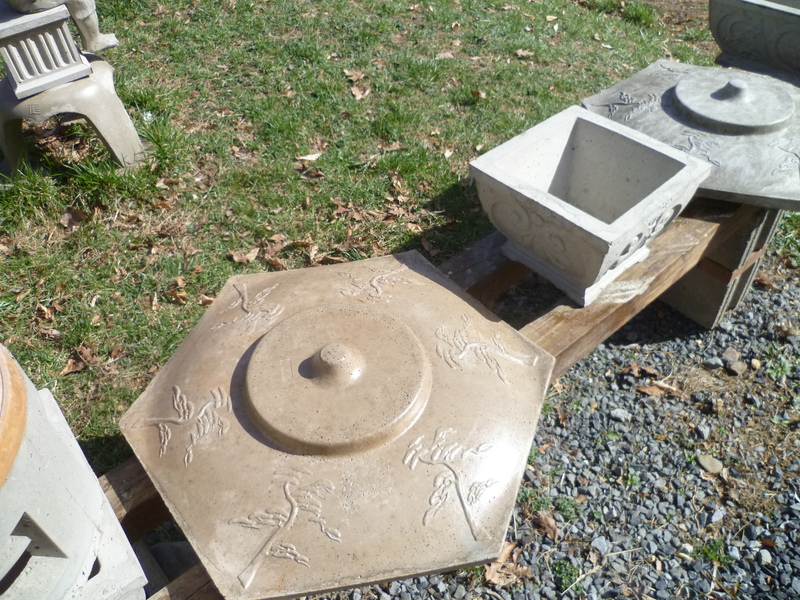 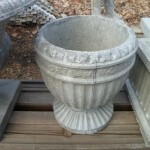 Frontier Concrete Planter $45 Height: 9-1/2 in. 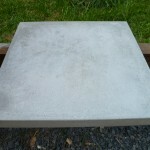 Square: 13-1/4 in. 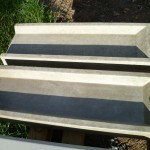 Cavity: 10-1/2 x 10-1/2 in. 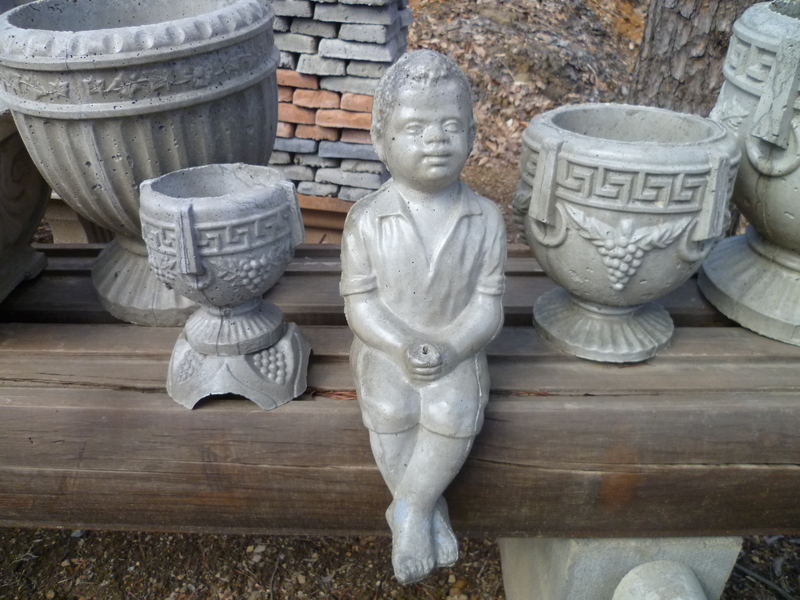 Height: 9-3/4 in. 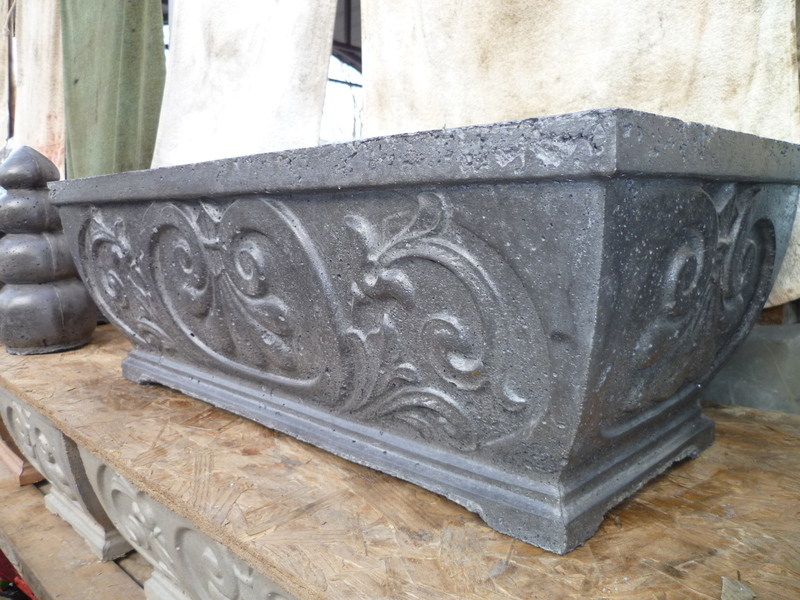 Square: 13-3/4 in. 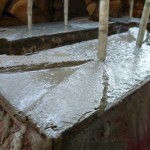 Cavity: 11 in. 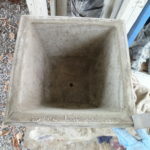 Cavity Depth: 8 in. 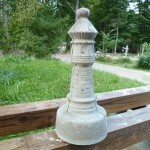 Height: 9-1/2 in. 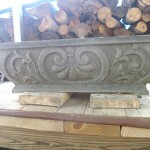 Length: 28-3/4 in. 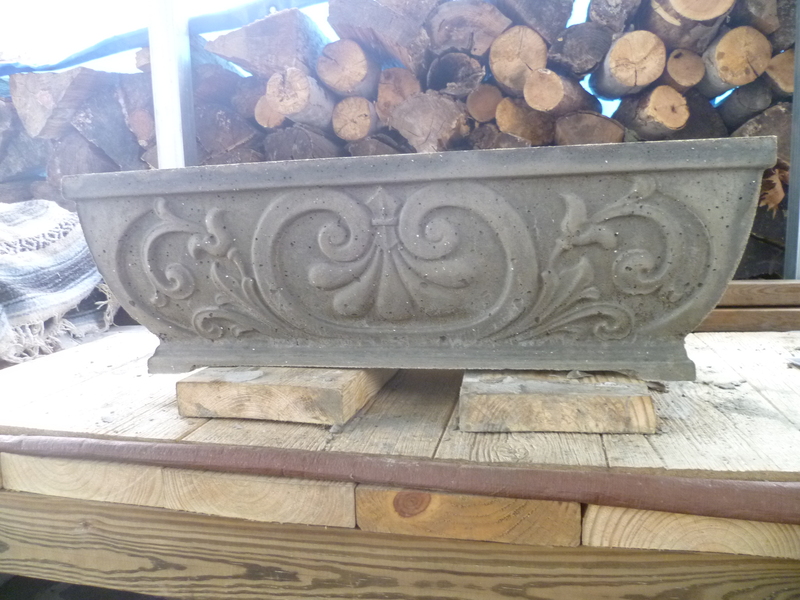 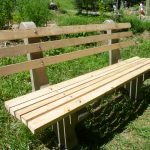 Width: 13-3/4 in. 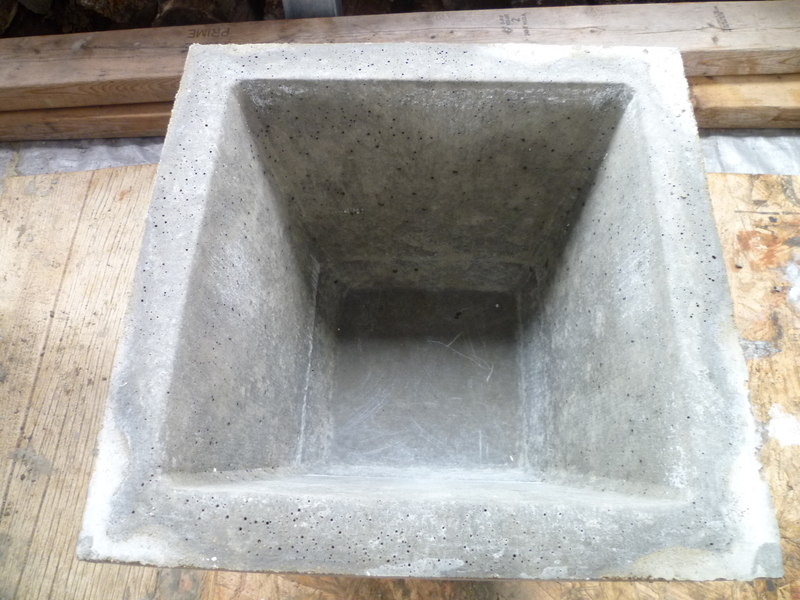 Cavity: 11 x 26 in. 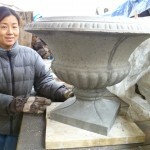 Height: 16-3/4 in. 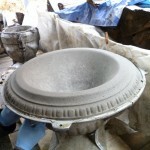 Diameter: 16 in. 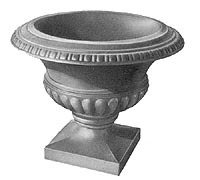 Cavity Diameter: 11-3/4 in. 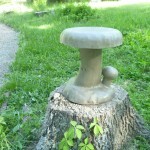 Height: 10-7/8 in. 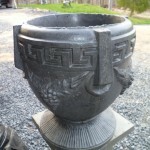 Diameter: 6-1/2 in. 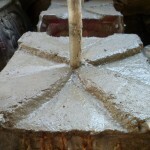 Cavity Diameter: 3-3/4 in. 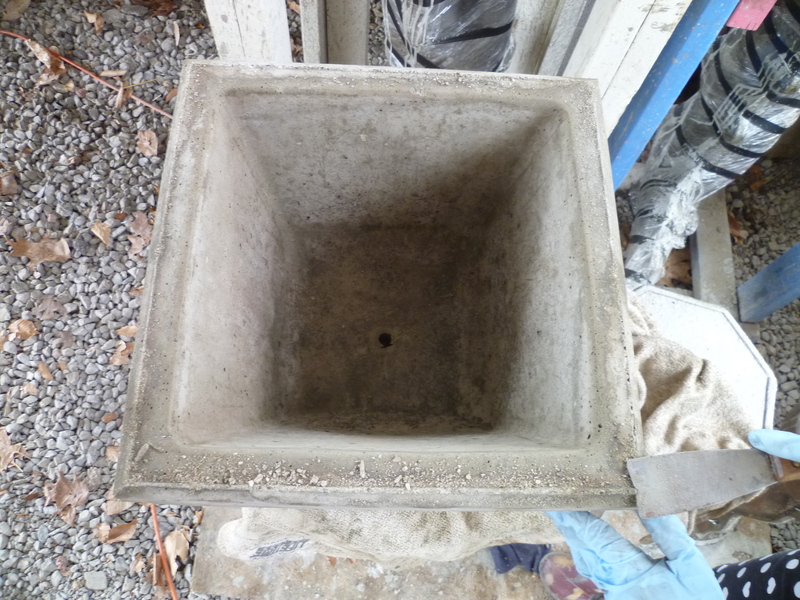 Cavity Depth: 5 in. 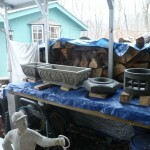 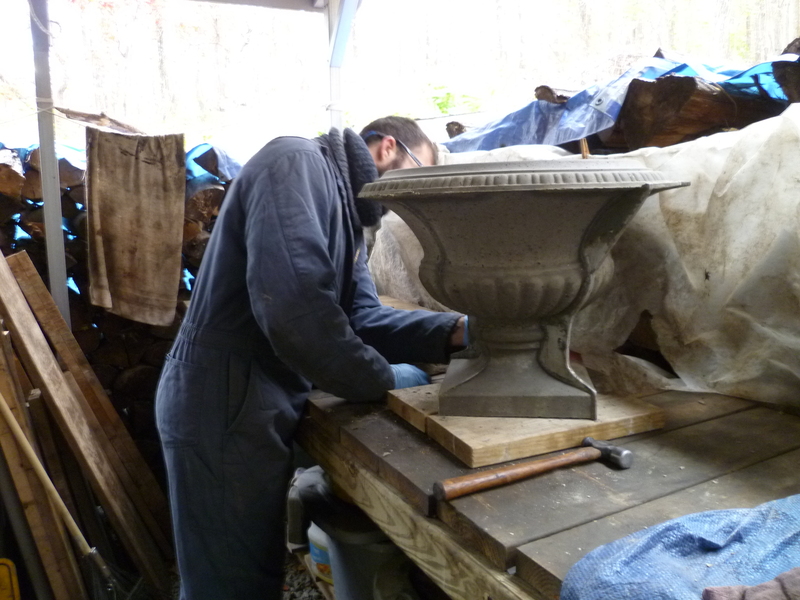 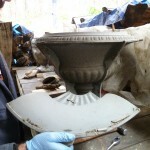 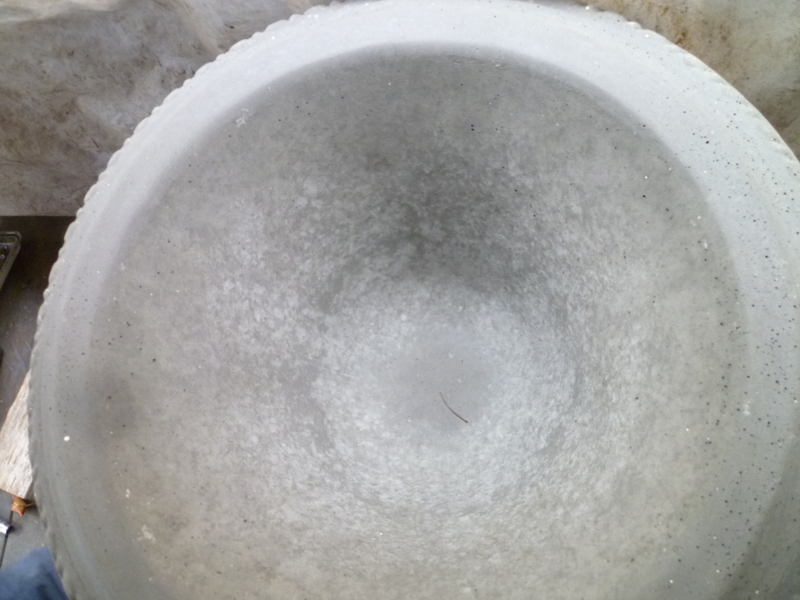 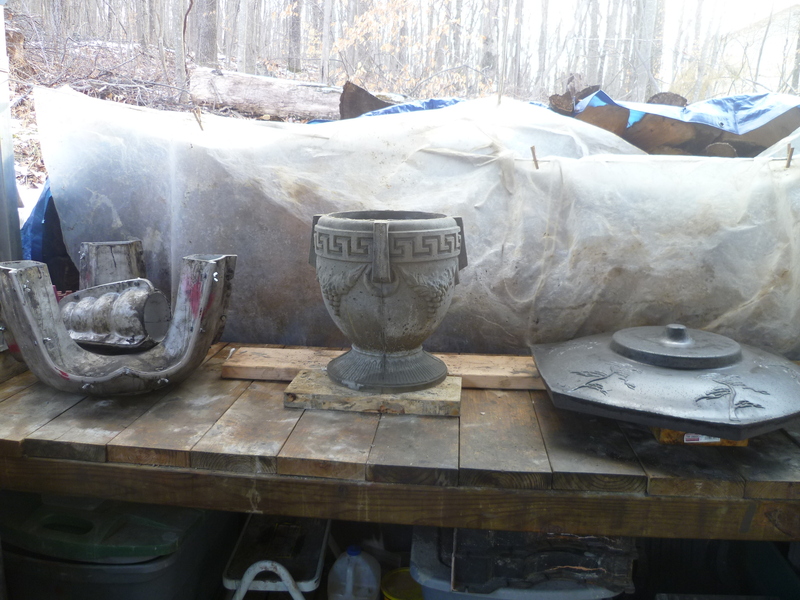 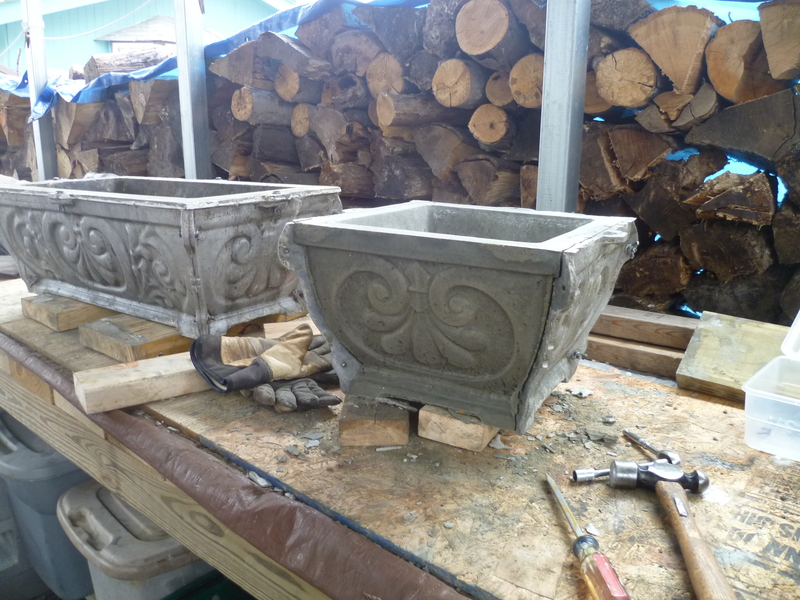 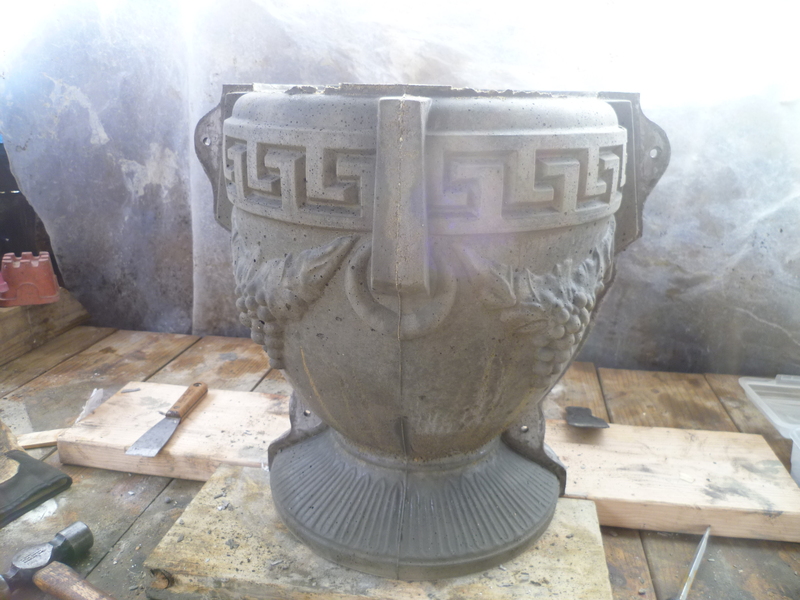 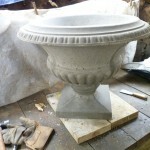 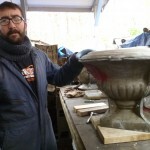 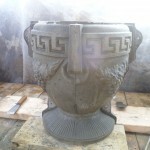 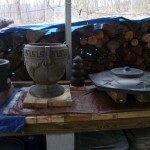 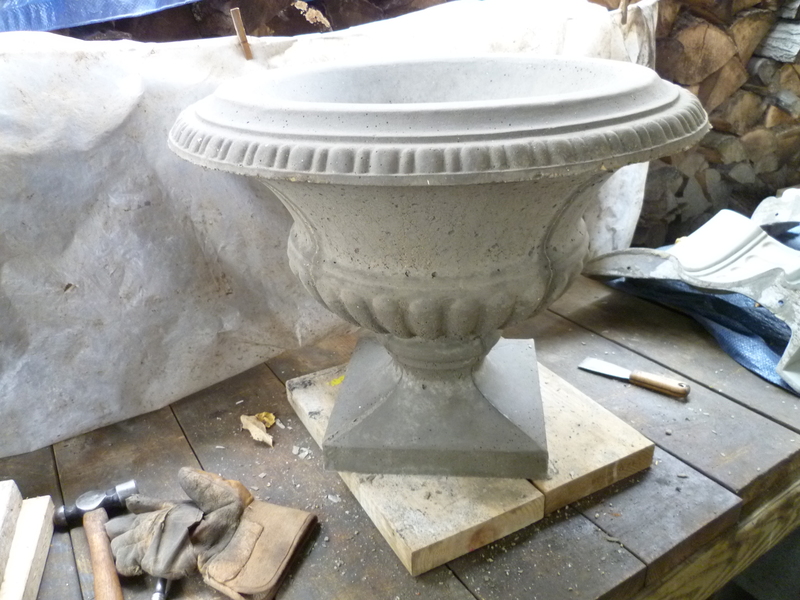 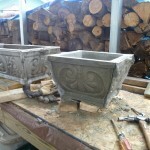 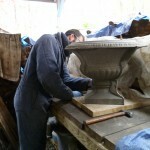 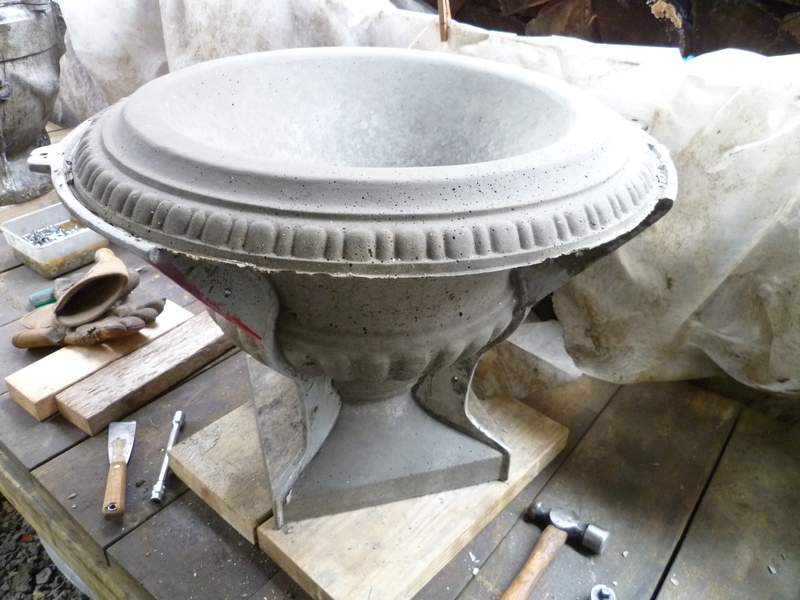 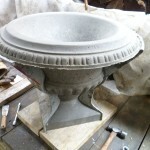 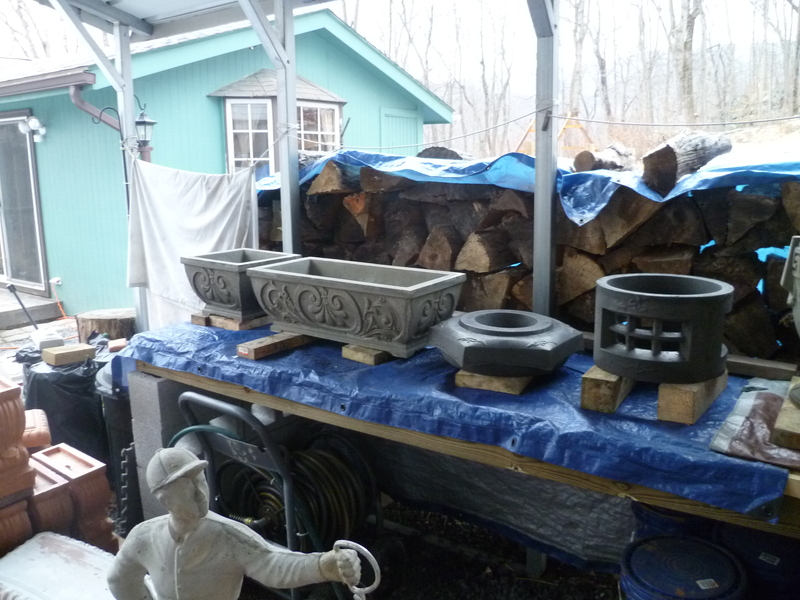 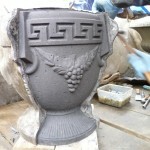 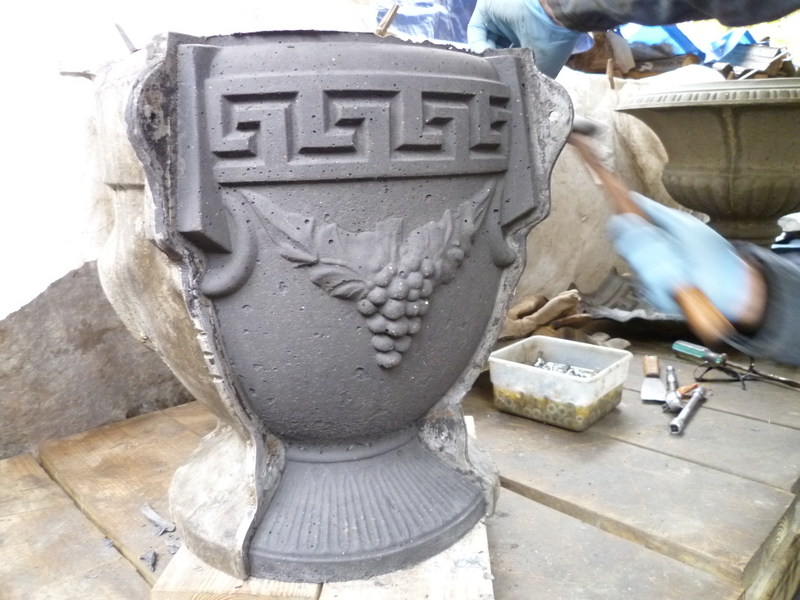 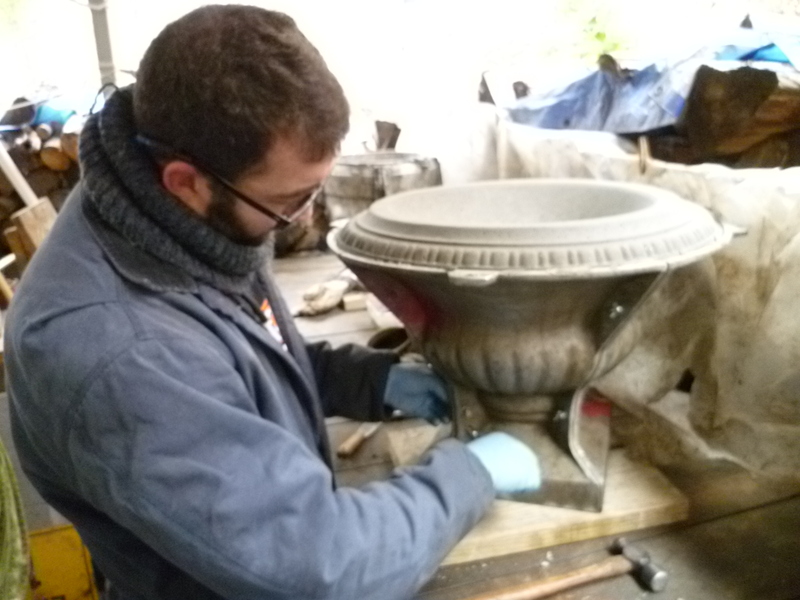 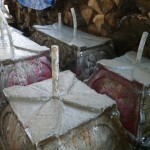 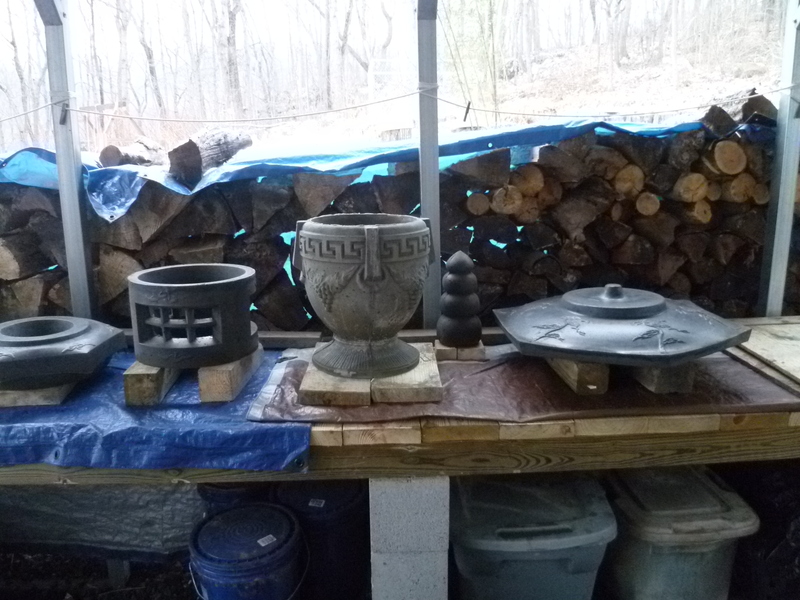 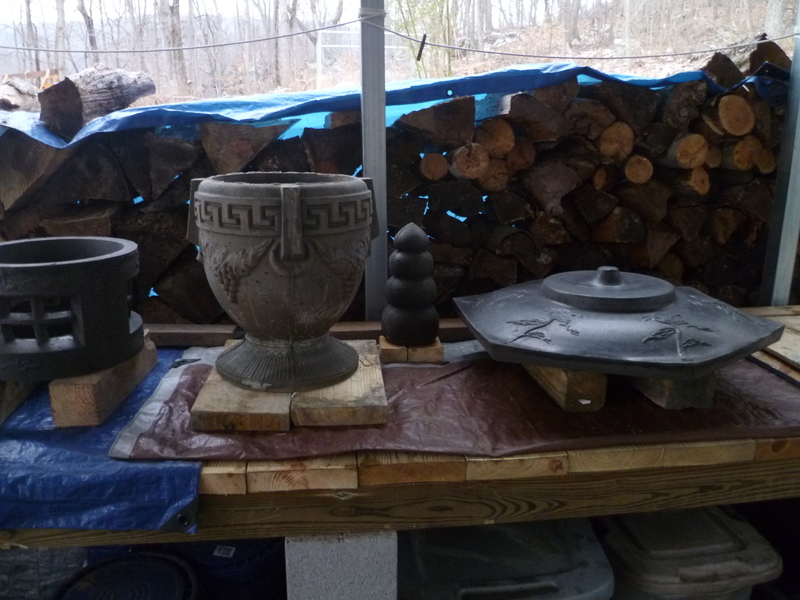 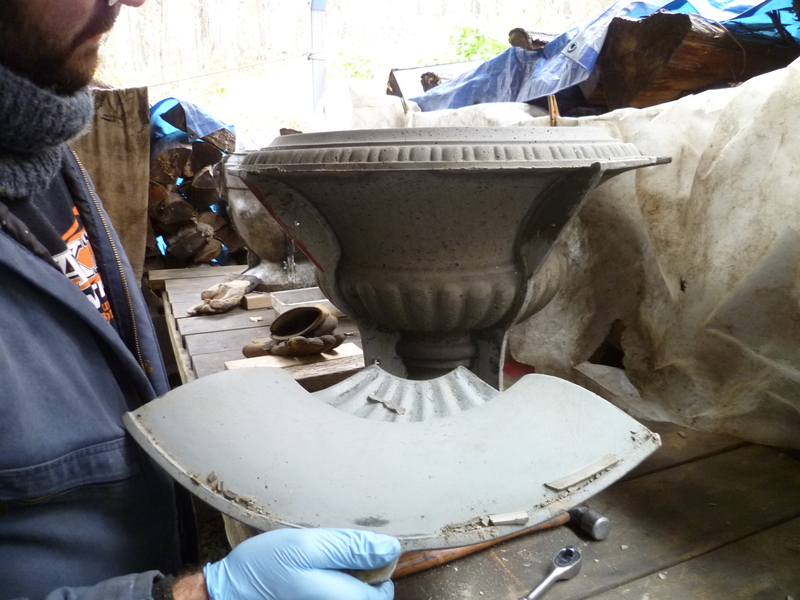 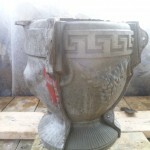 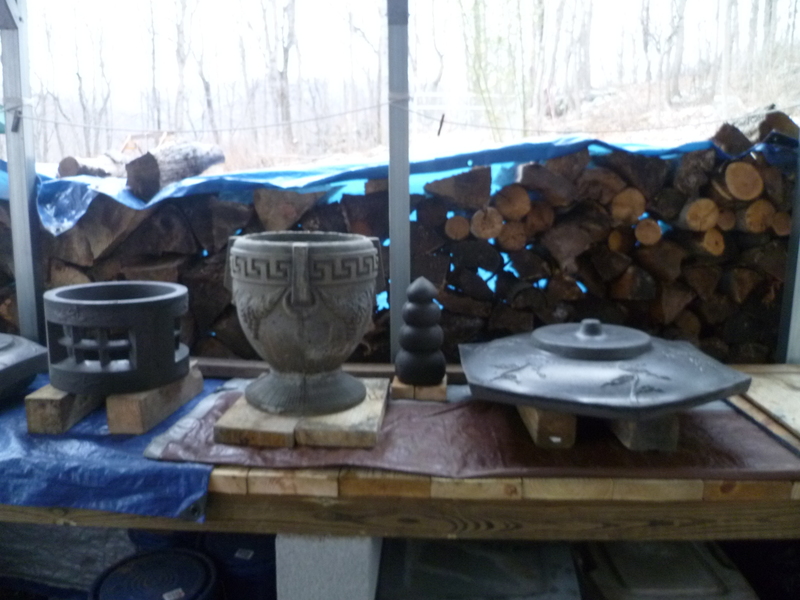 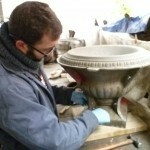 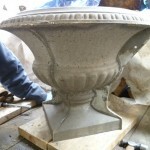 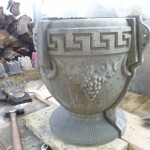 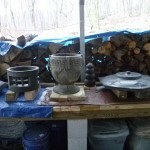 All flower pots come standard with a hole in the bottom and will be rain sealed. 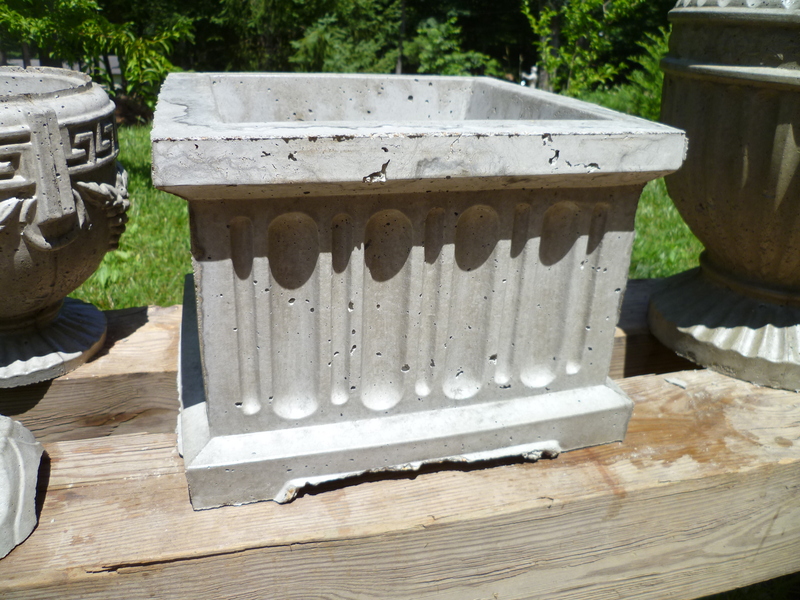 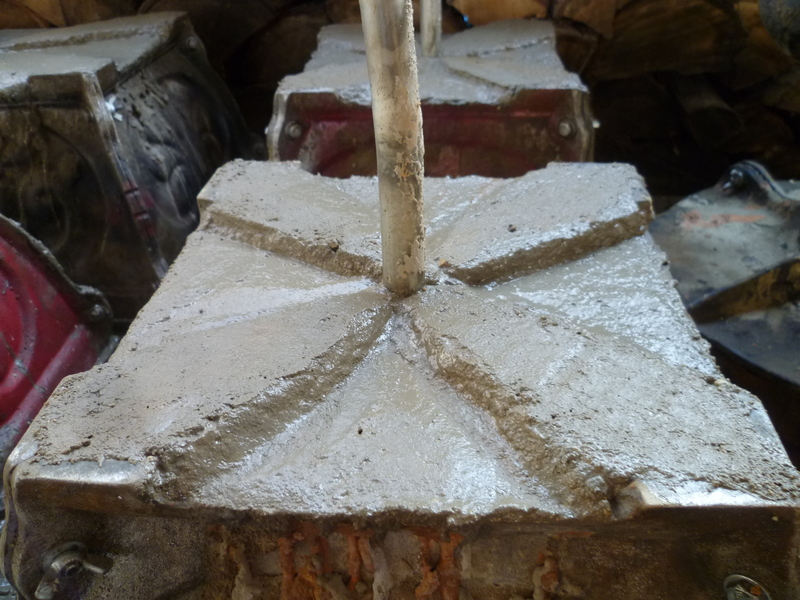 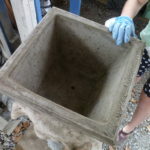 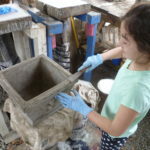 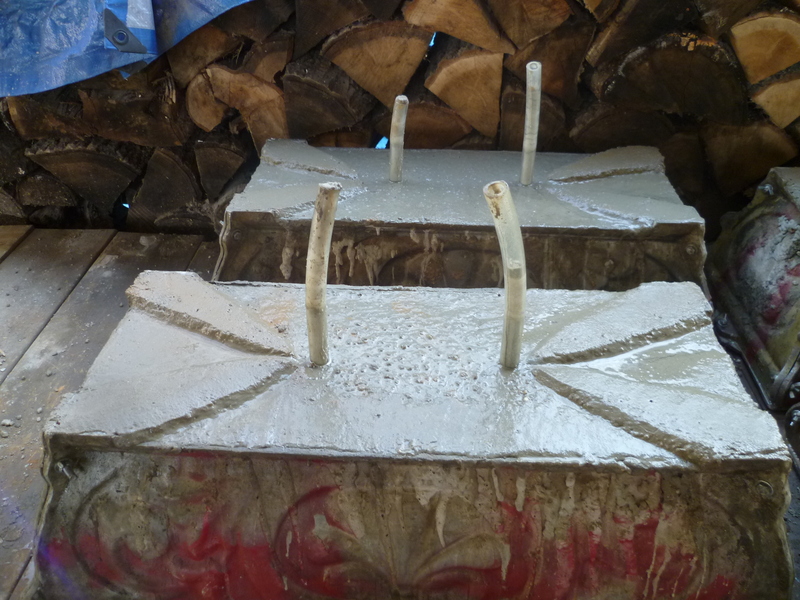 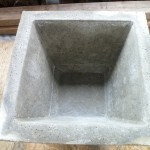 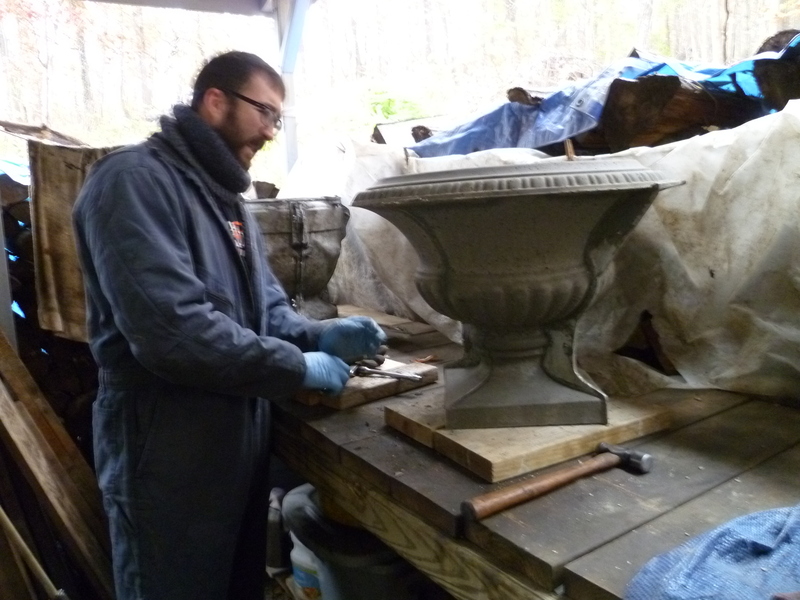 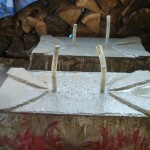 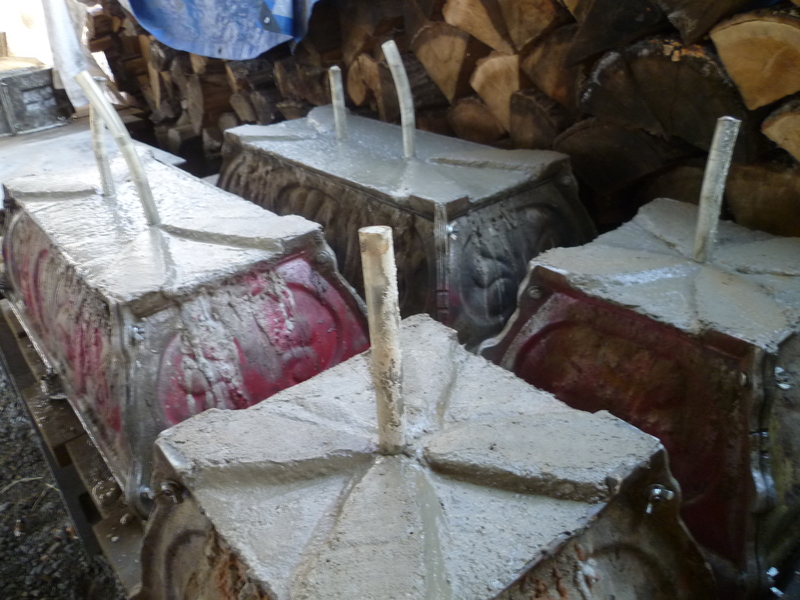 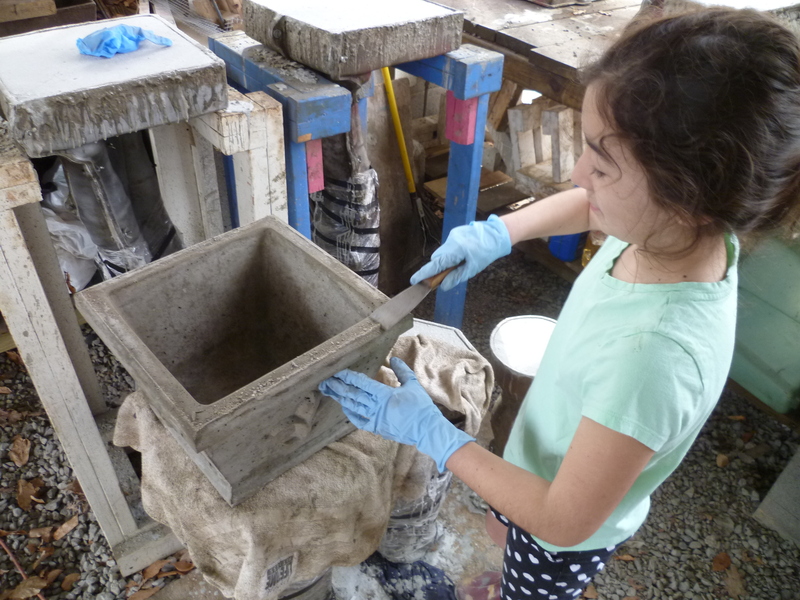 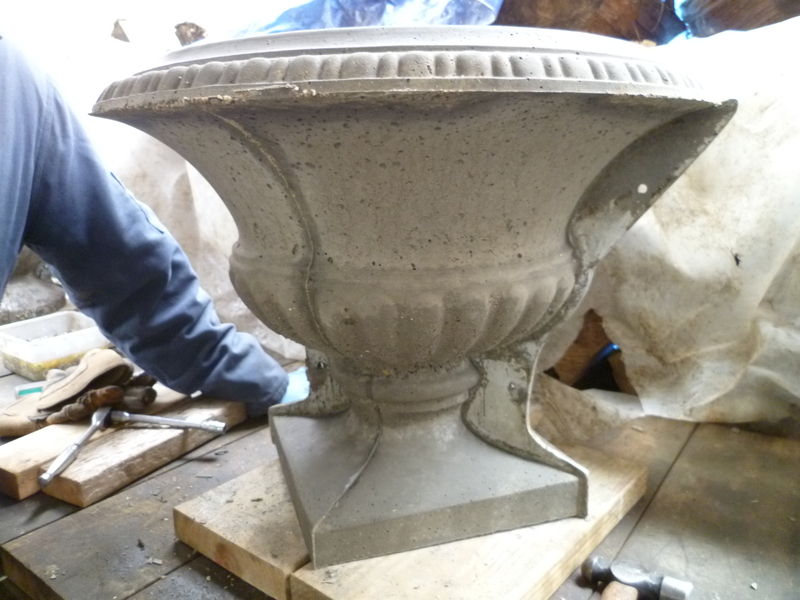 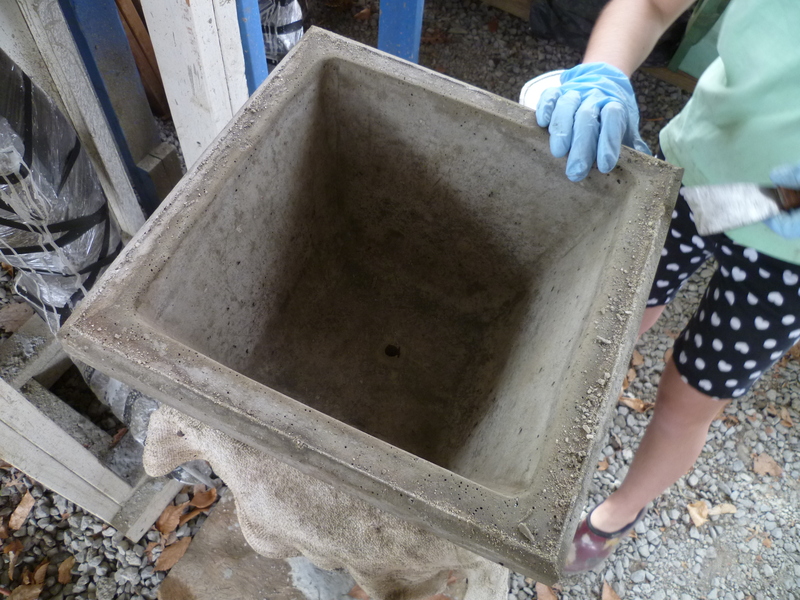 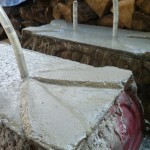 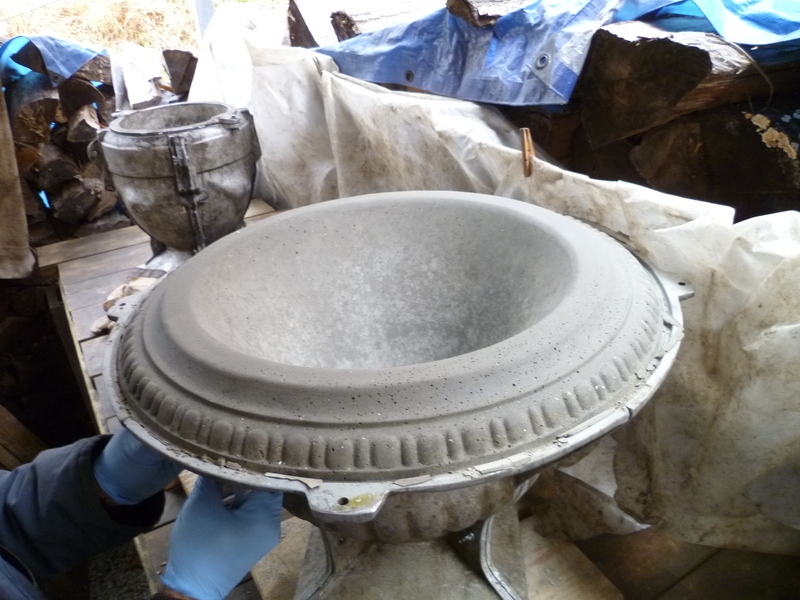 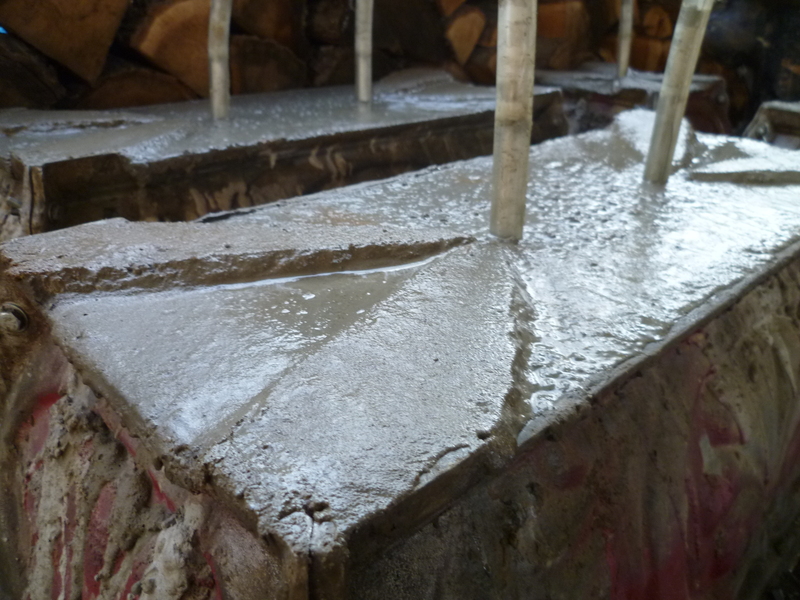 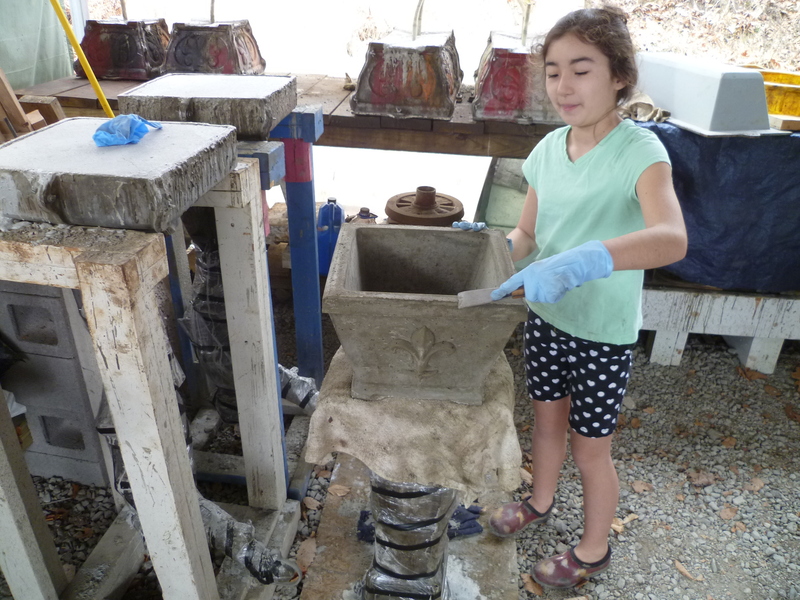 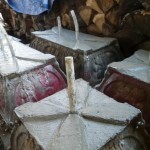 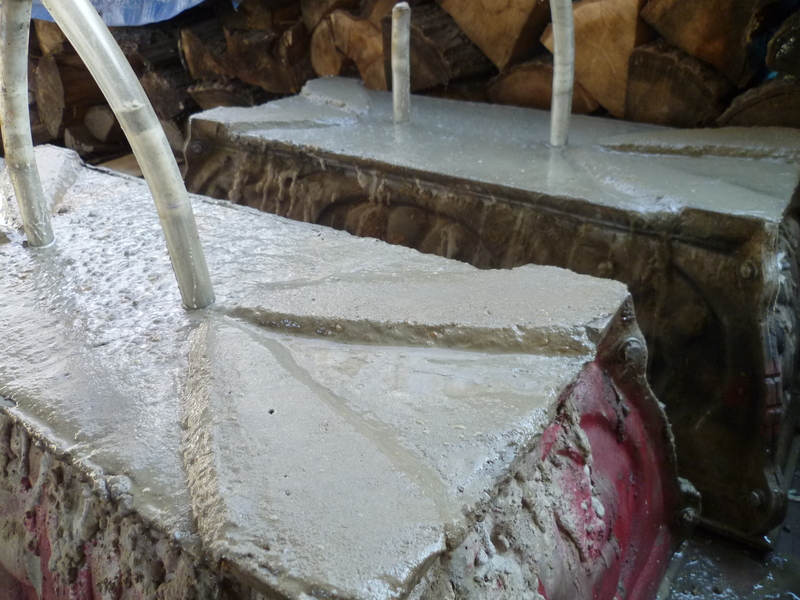 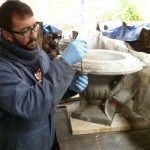 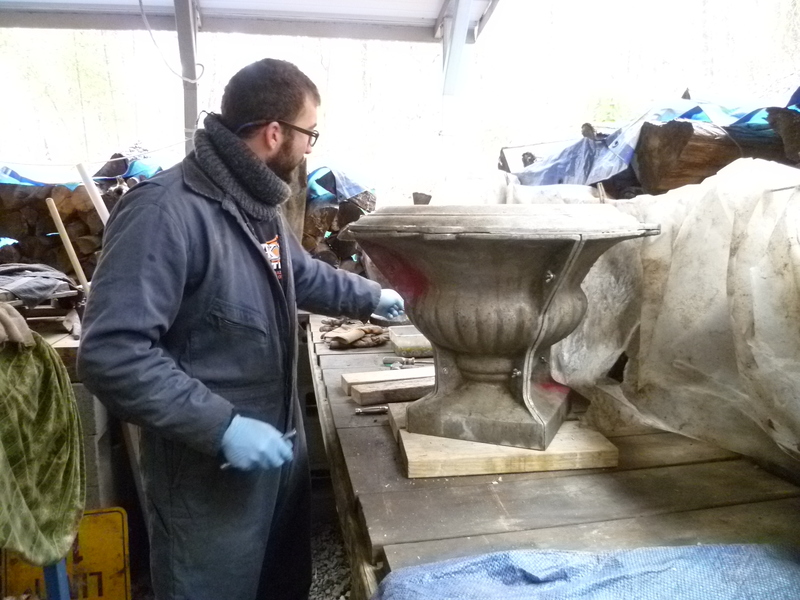 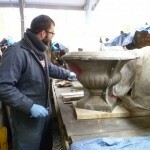 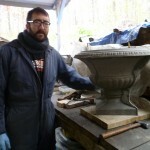 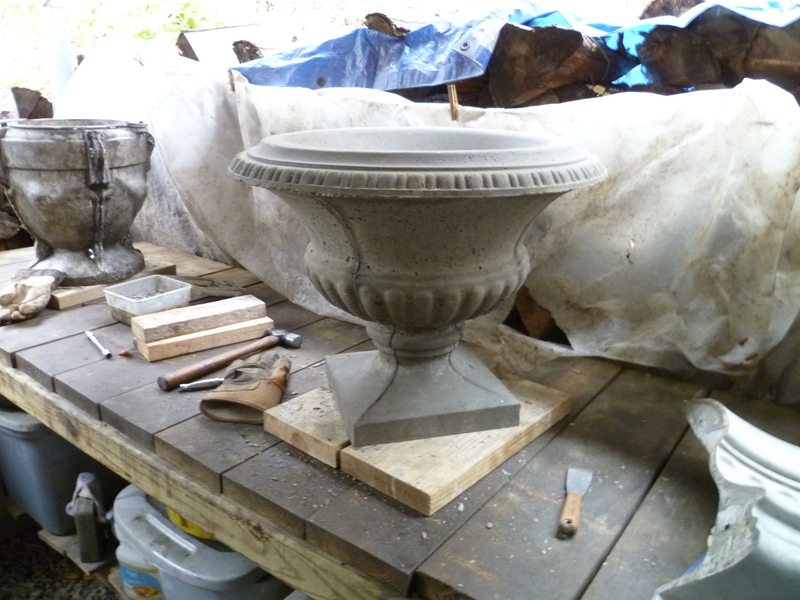 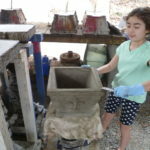 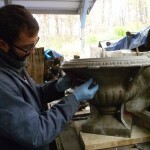 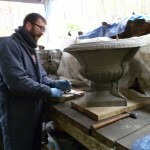 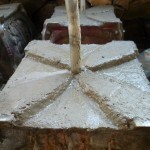 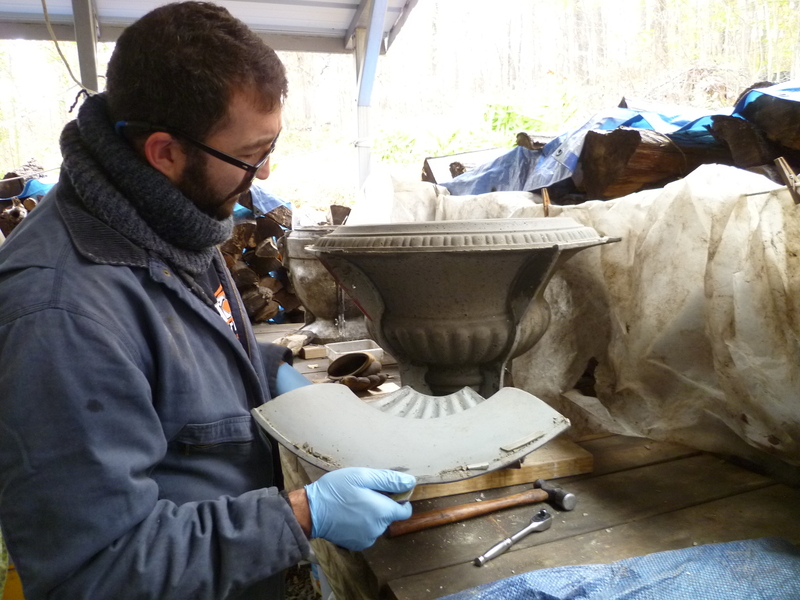 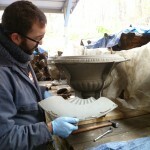 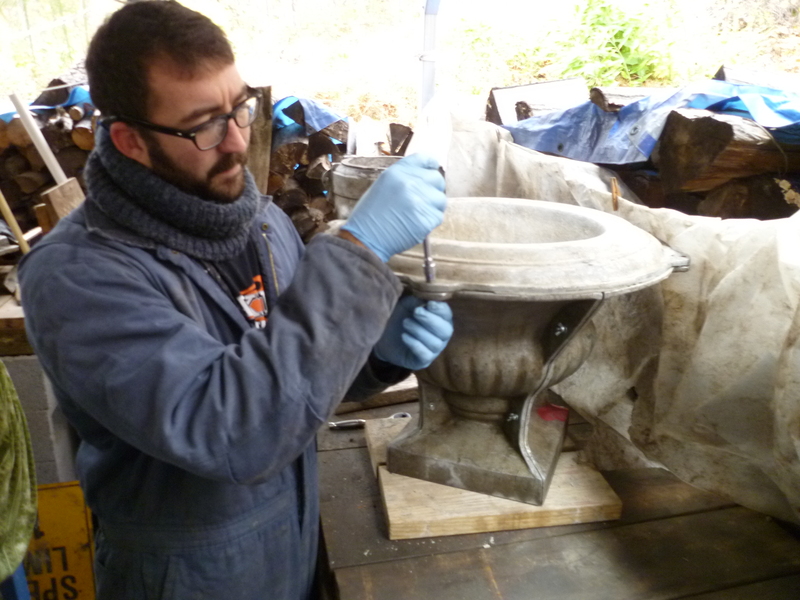 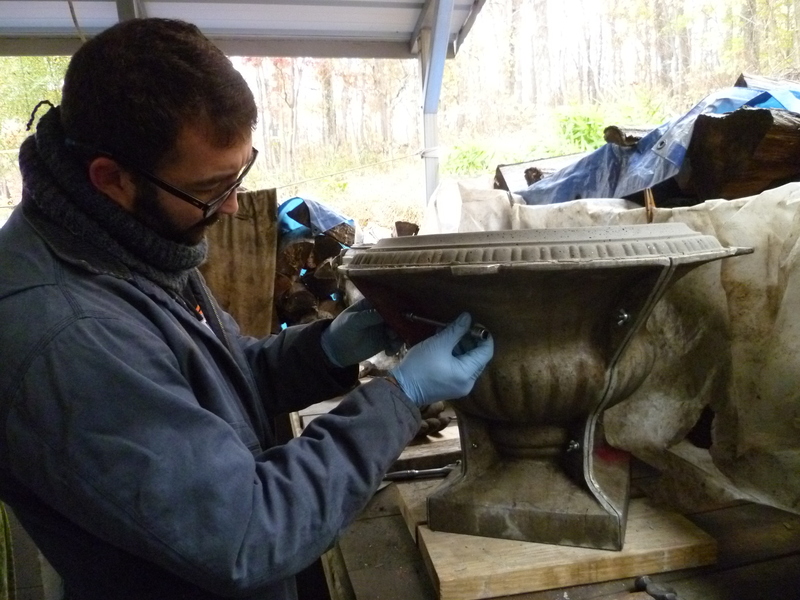 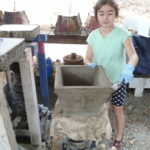 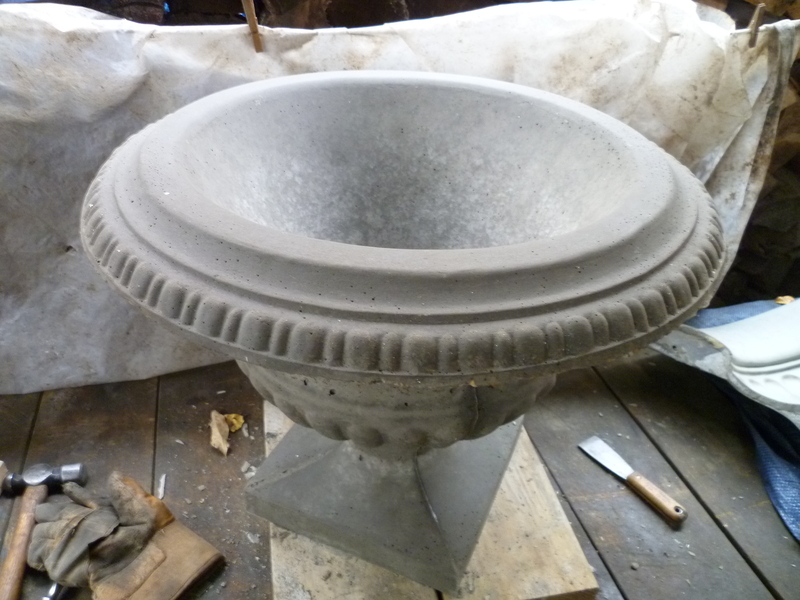 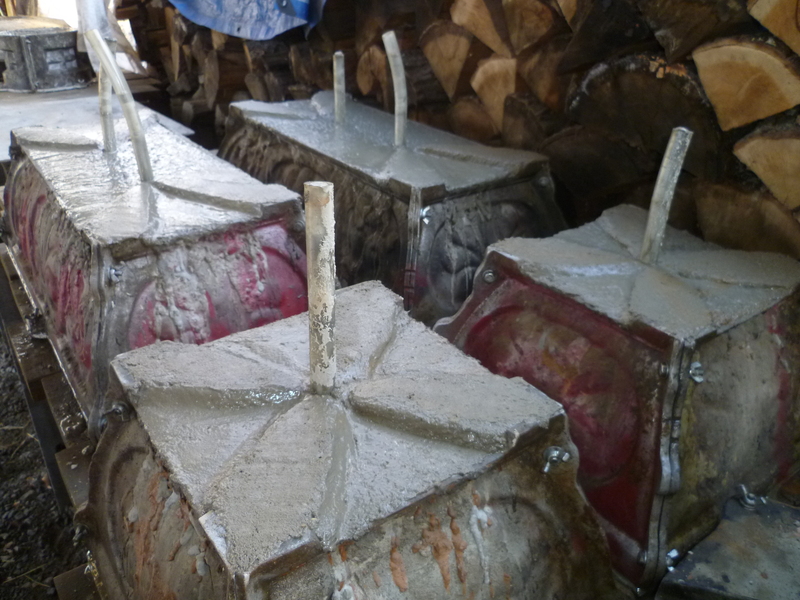 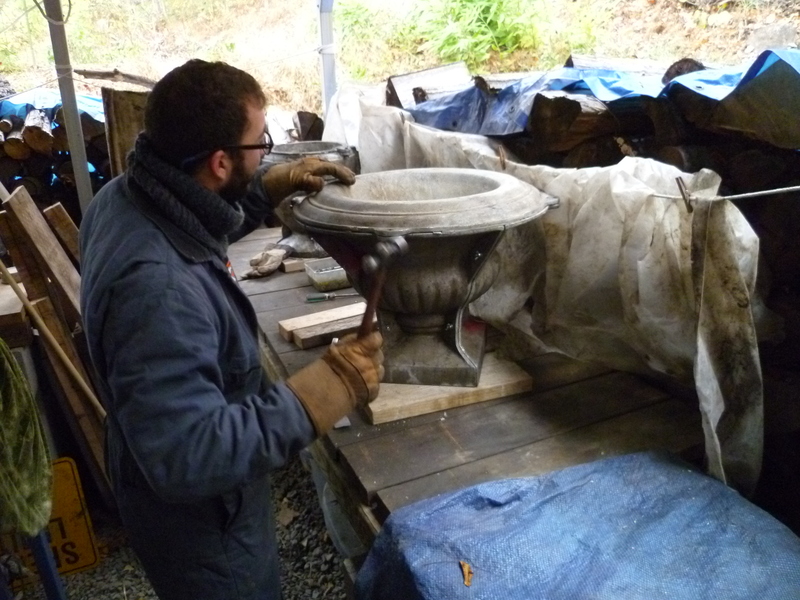 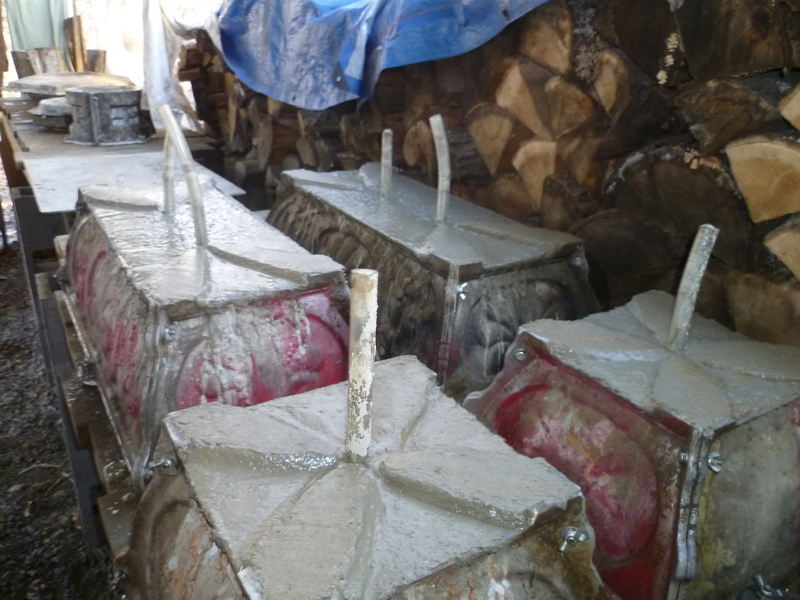 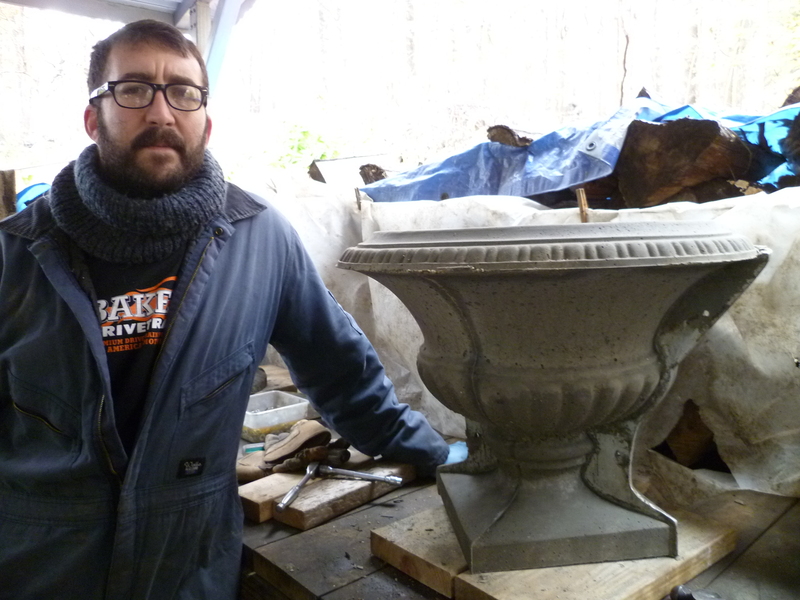 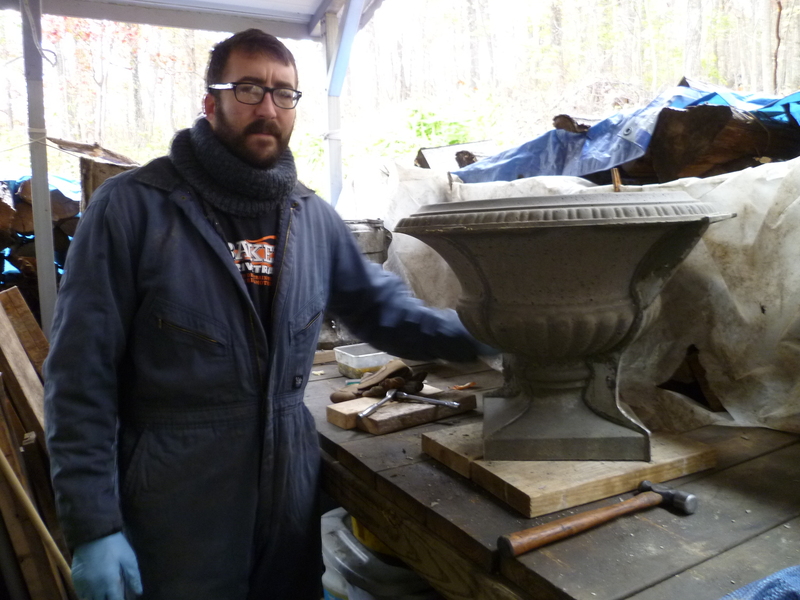 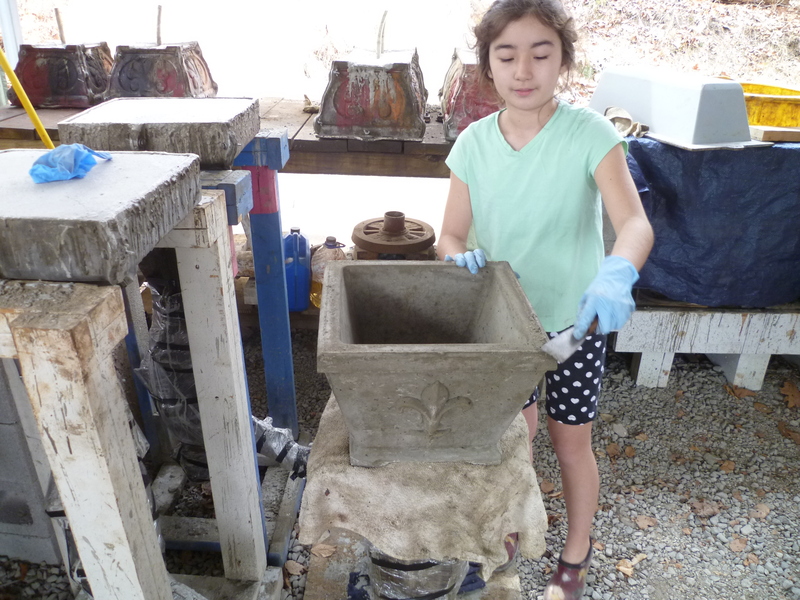 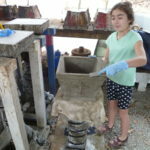 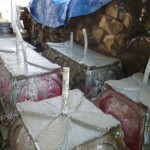 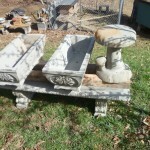 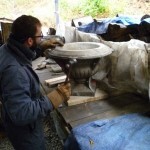 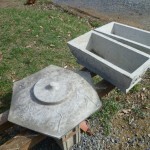 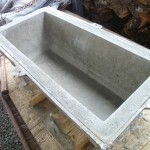 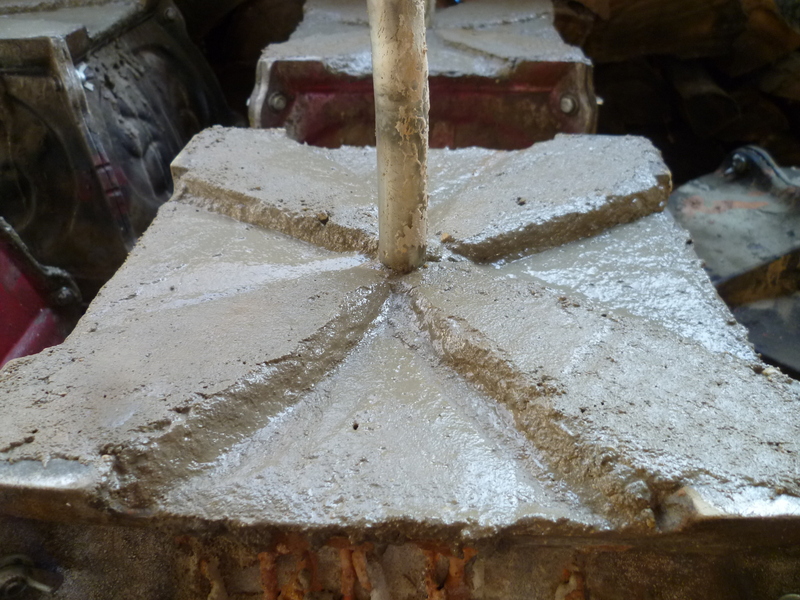 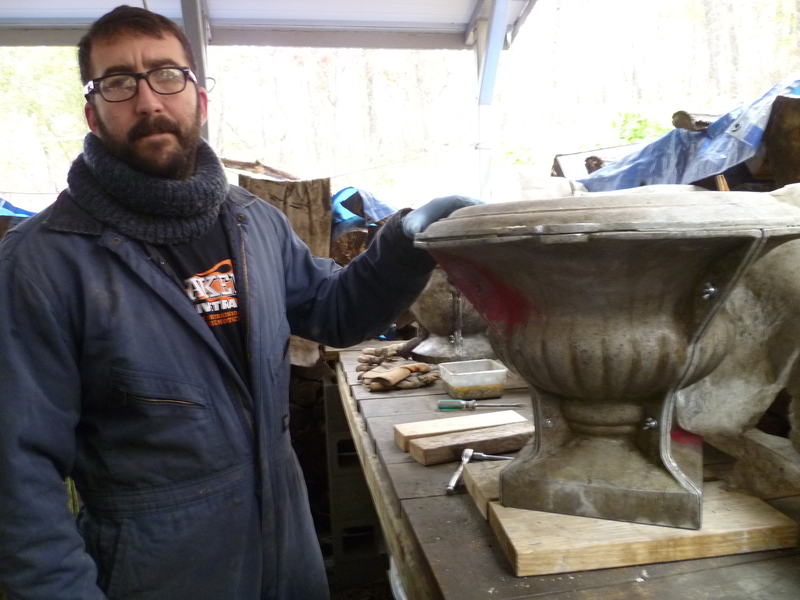 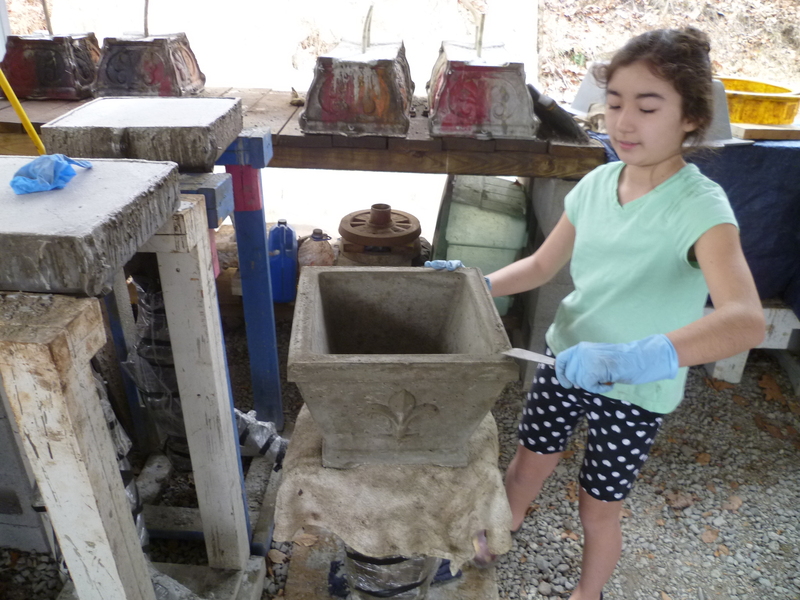 Please let us know if you’d like the concrete unsealed, or the bottom to remain solid. 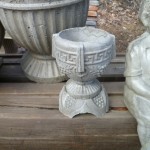 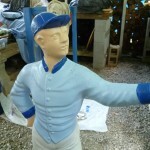 Custom paint/dye colors available for an additional $10. 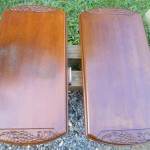 Custom acid stains are also available. 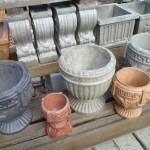 The price depends on the flower pot selected. 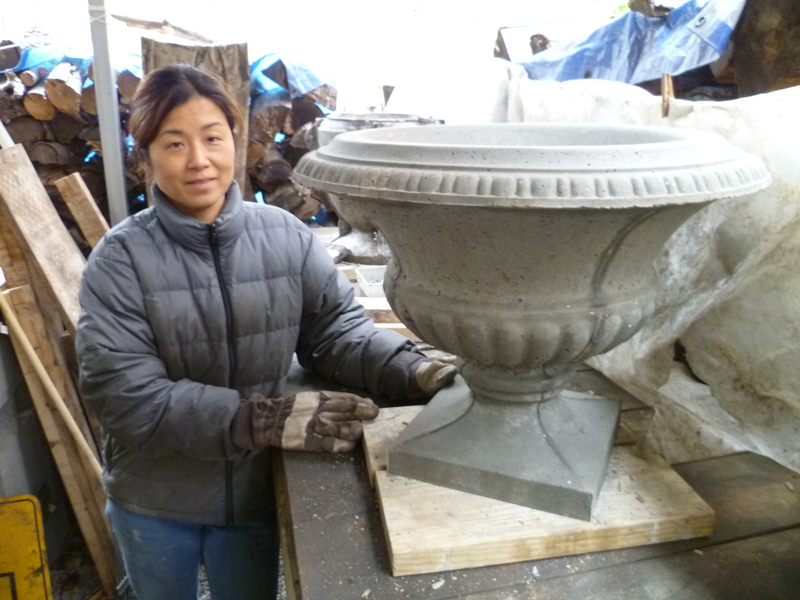 Akiko shapes the legs pretty well. 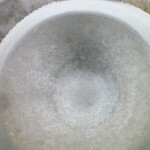 They won’t break this way.